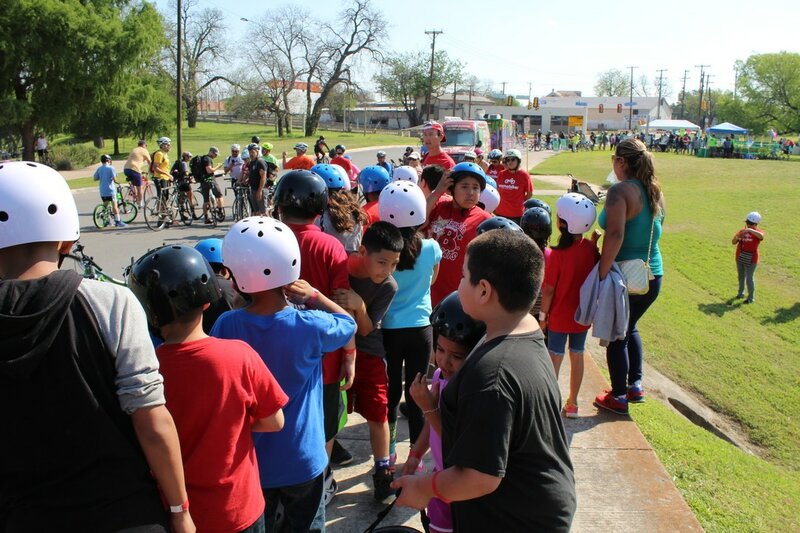 EAB @ School is a tuition-free, youth development, program that works with schools and community partners to incentive students to engage in good behavior, attend classes, and adopt healthy living habits. 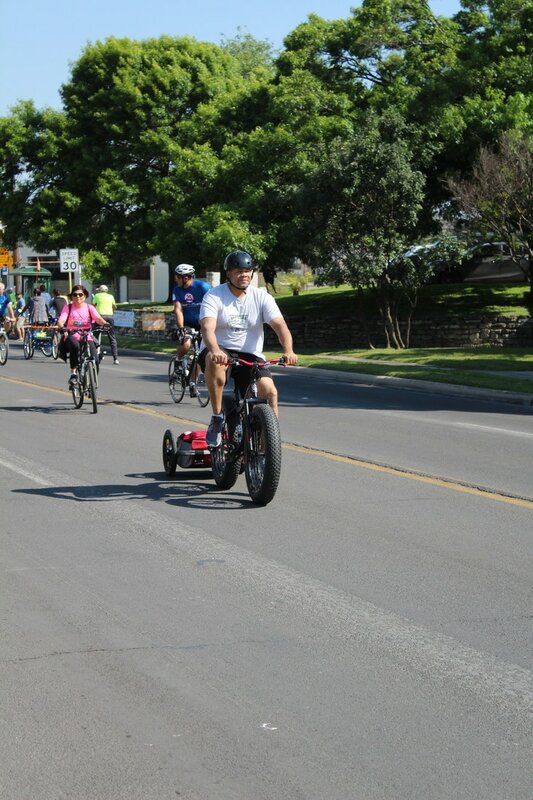 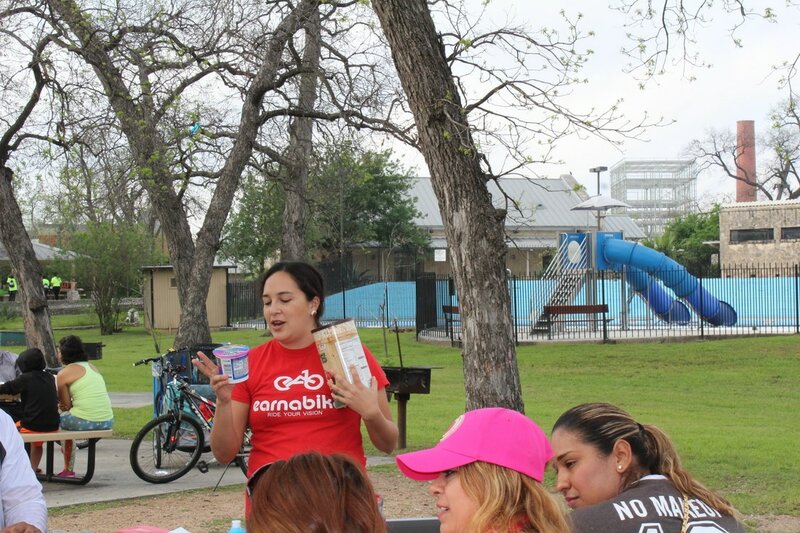 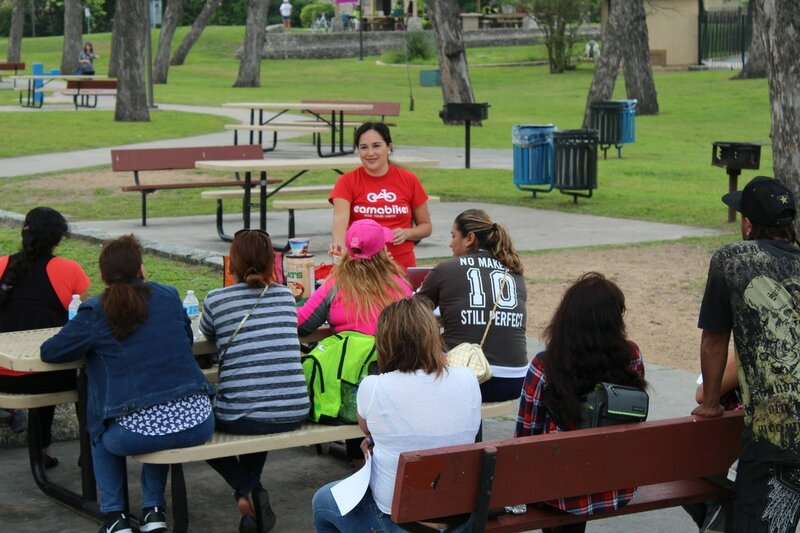 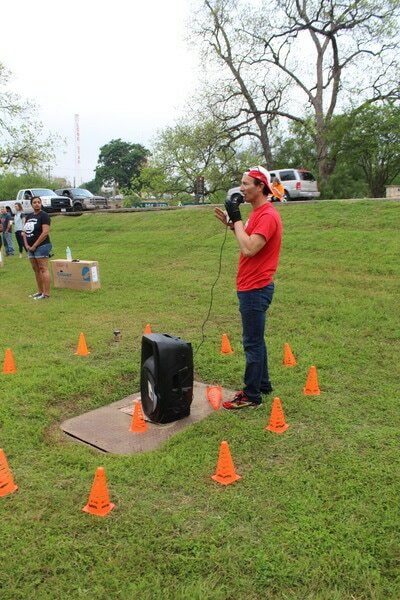 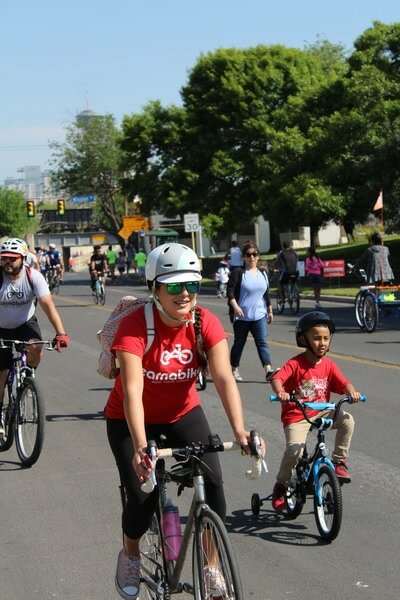 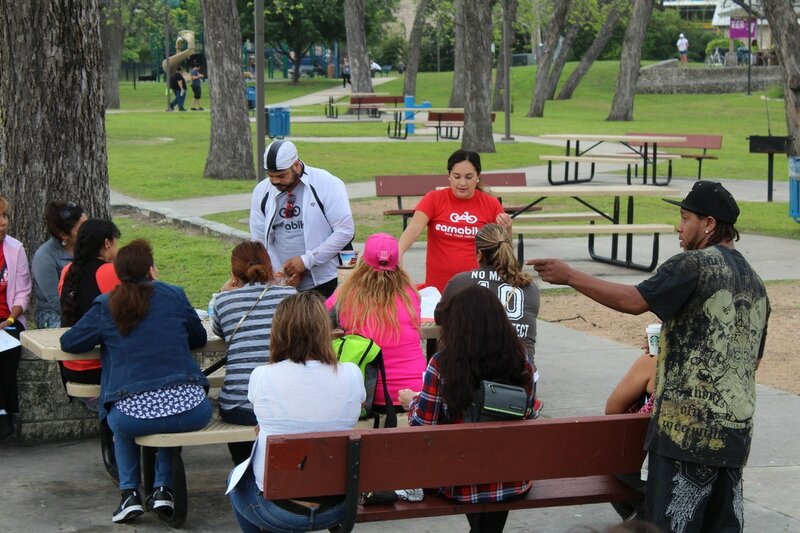 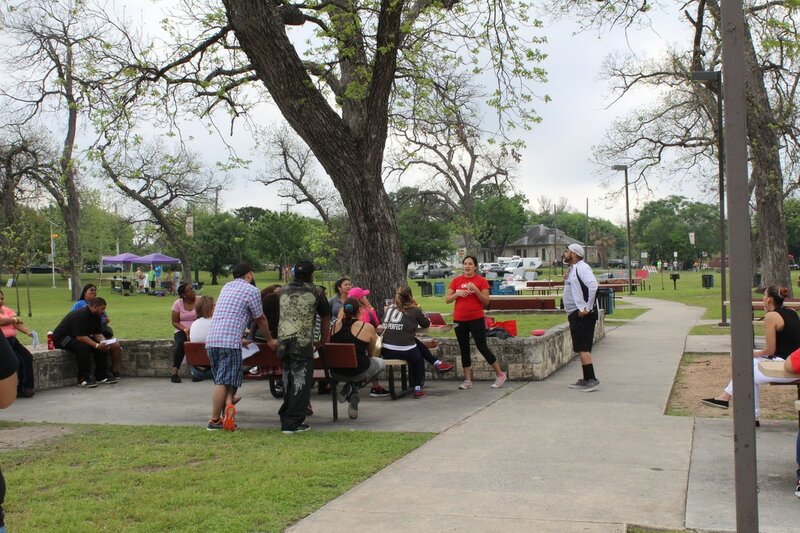 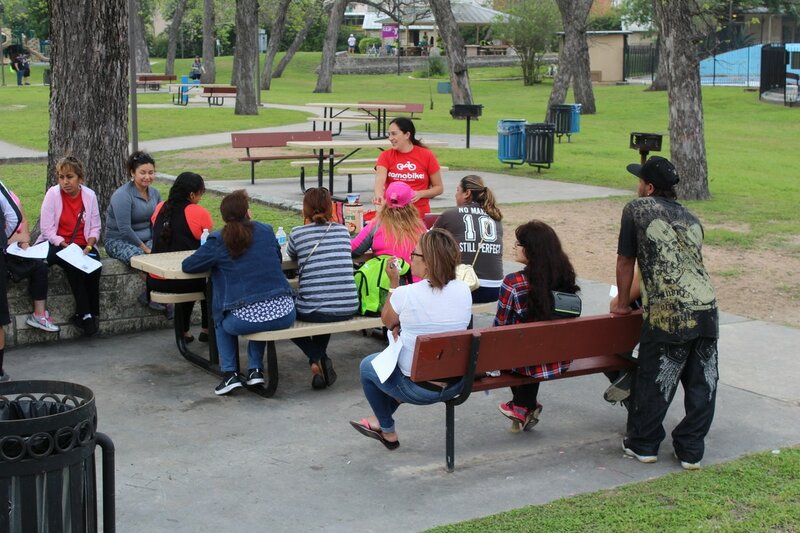 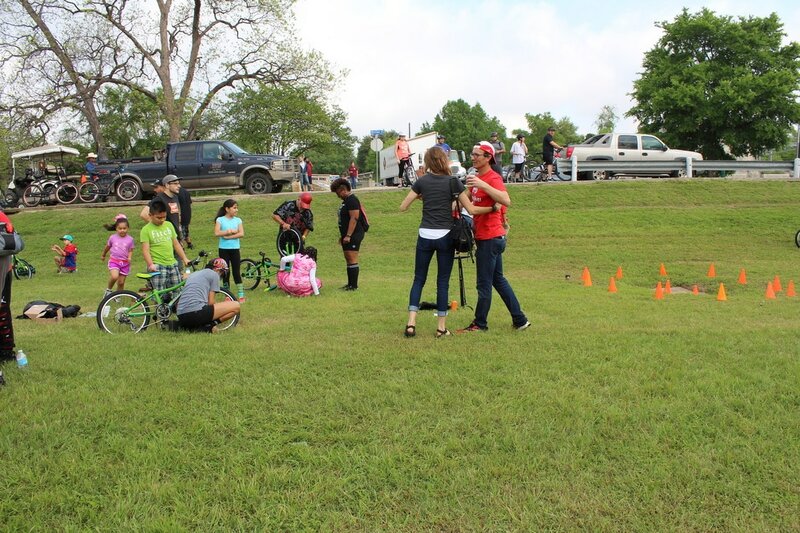 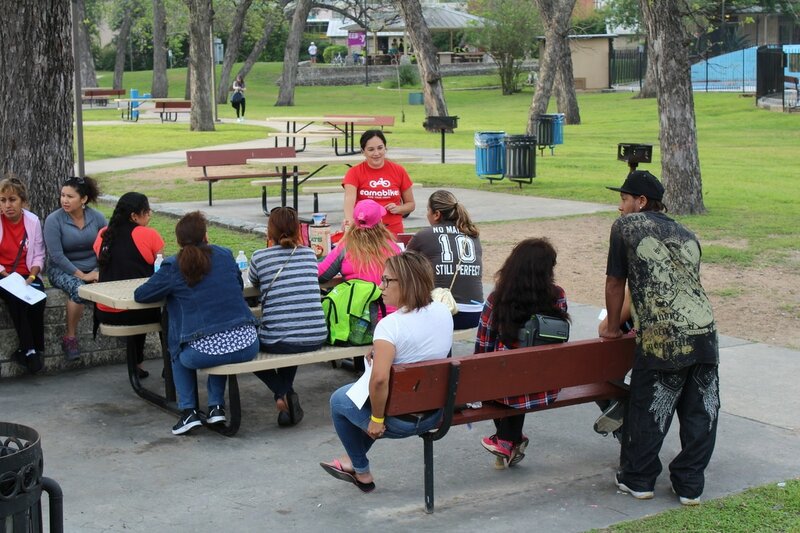 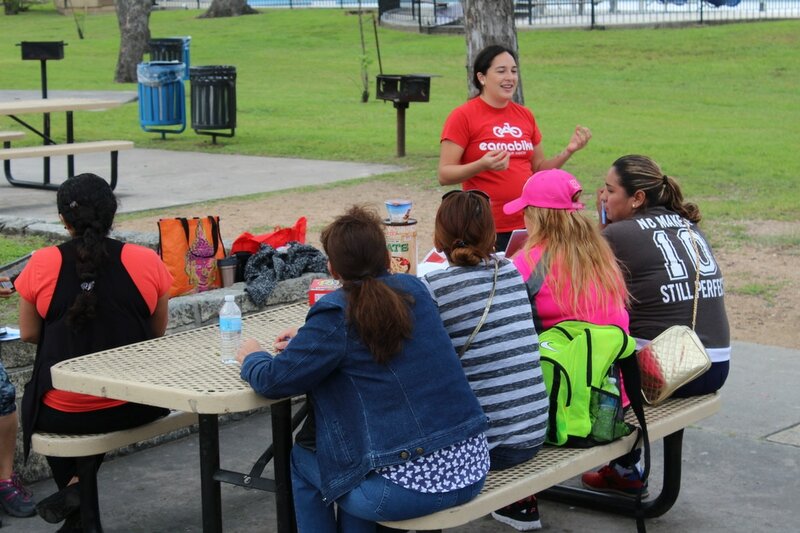 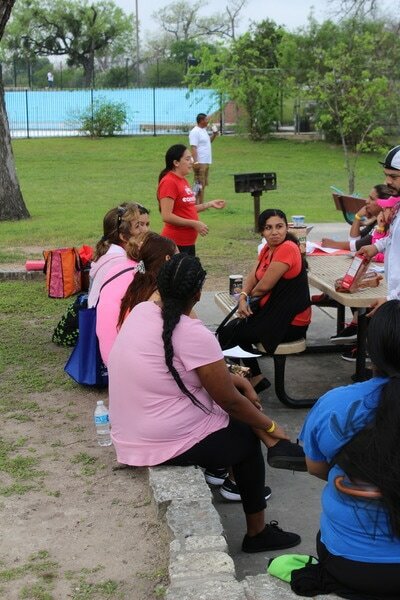 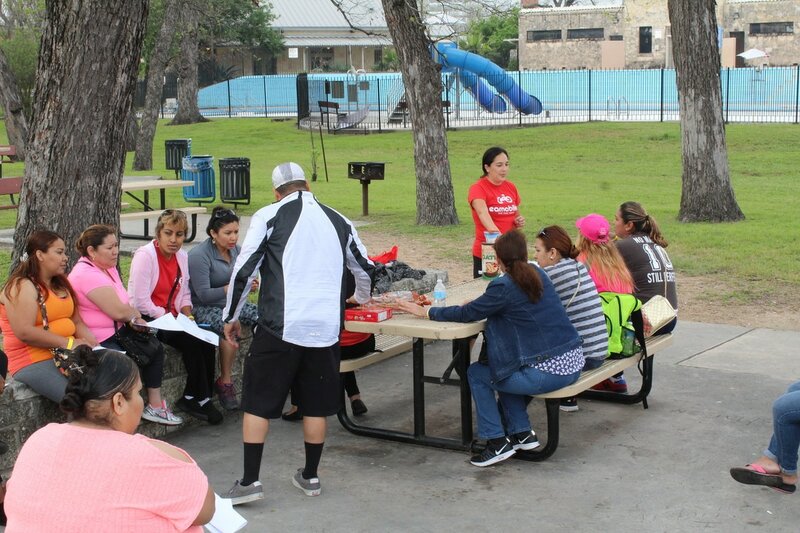 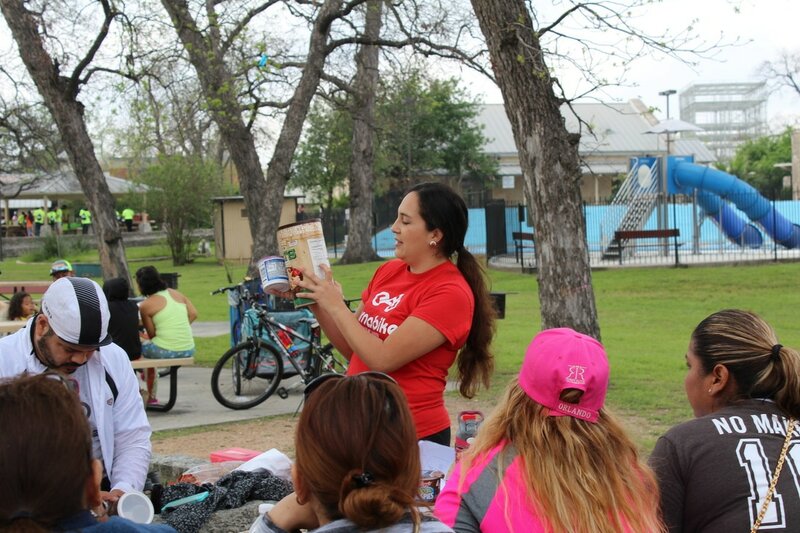 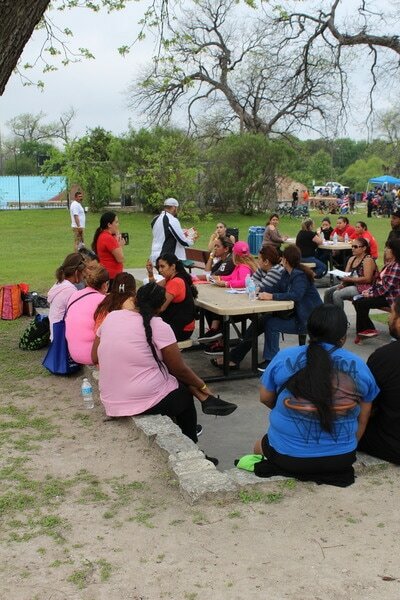 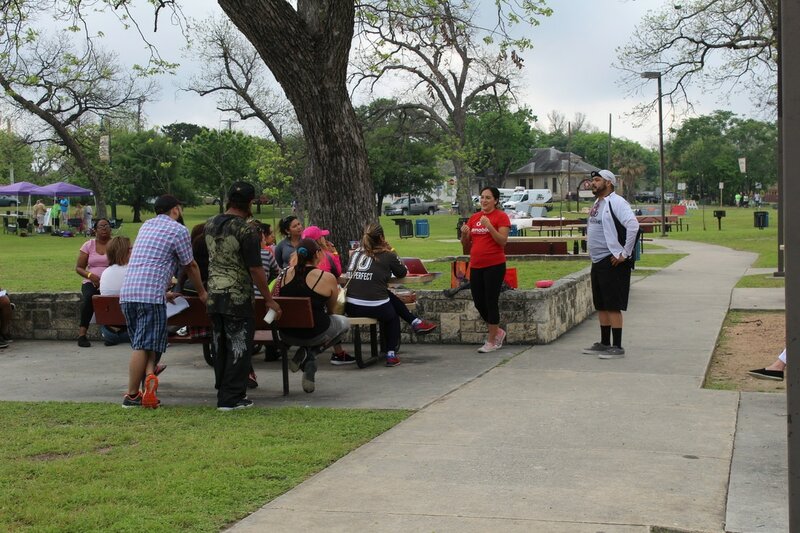 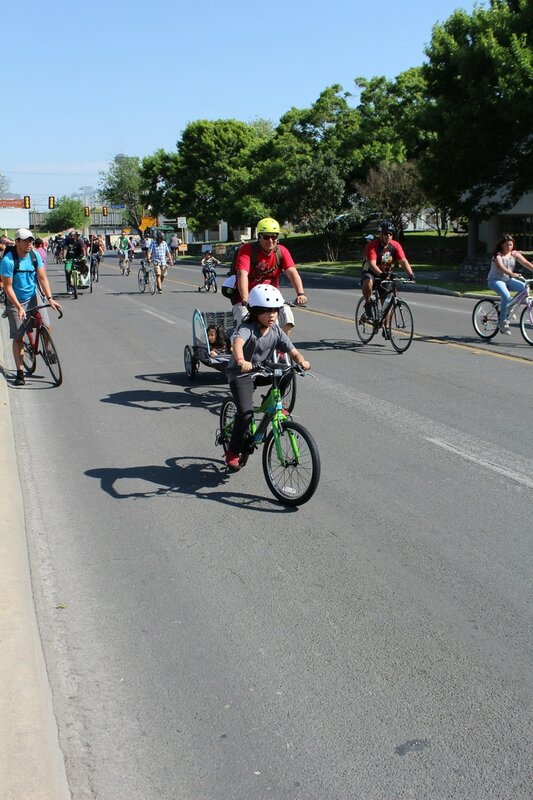 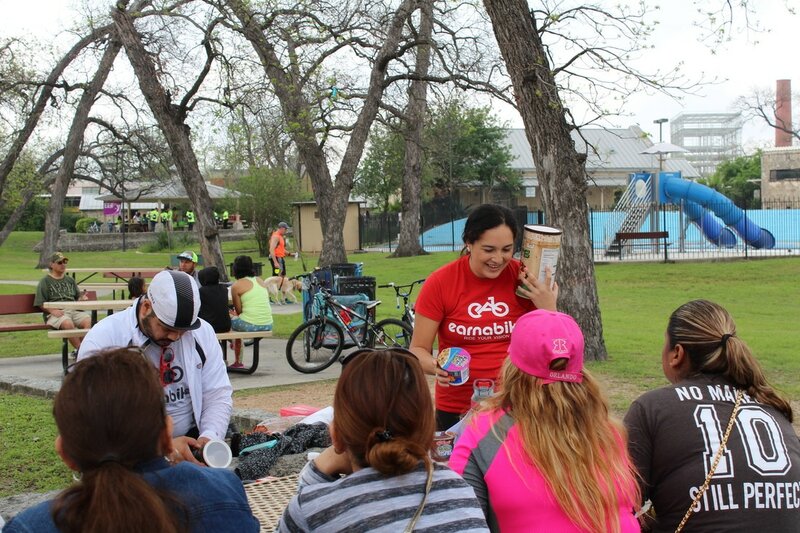 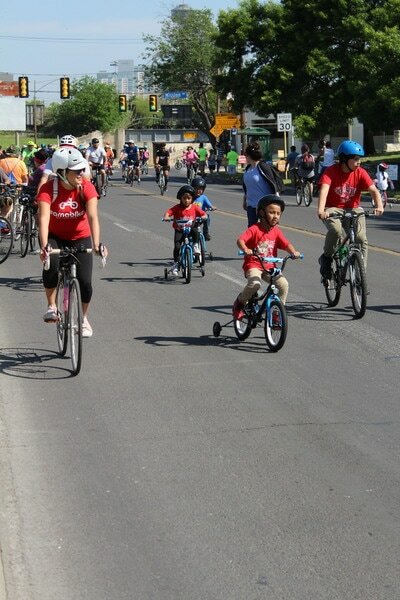 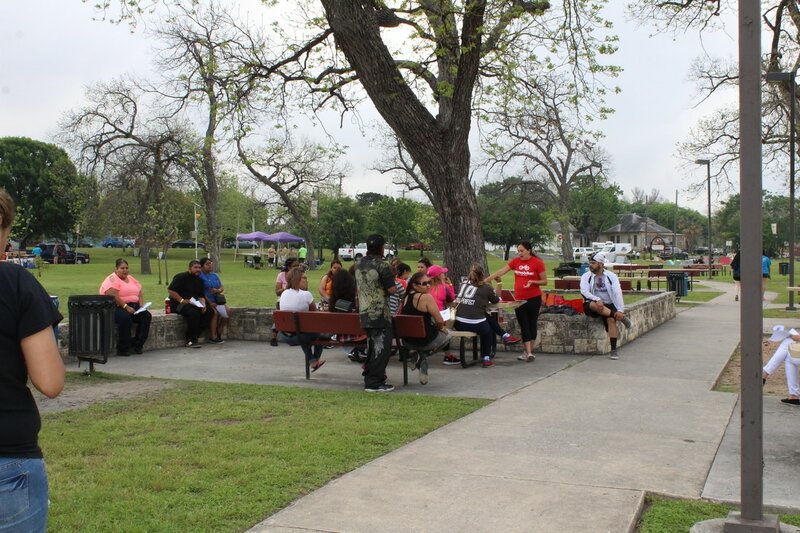 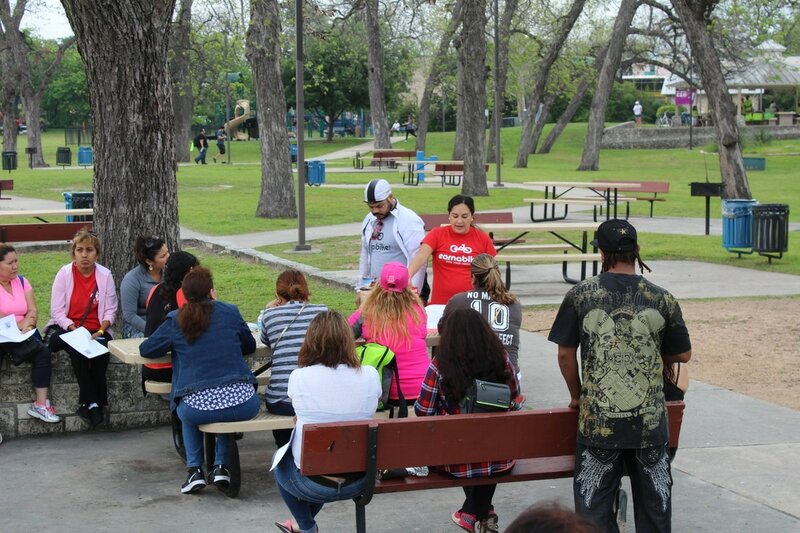 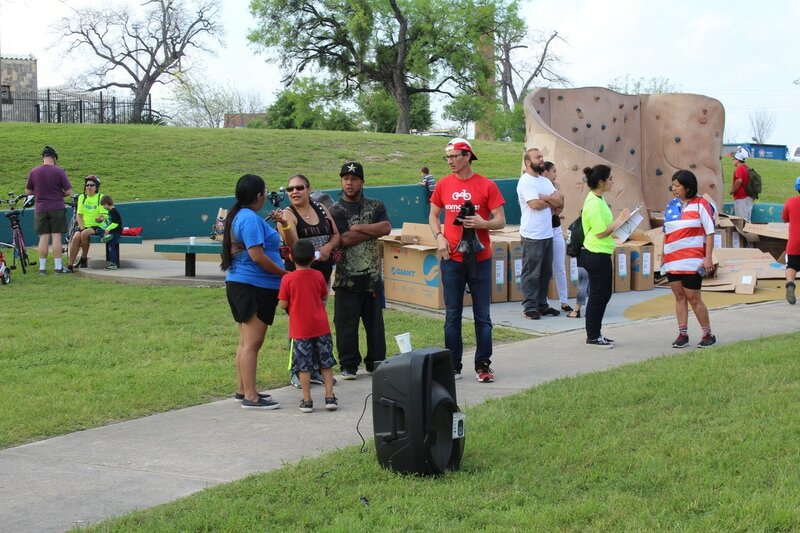 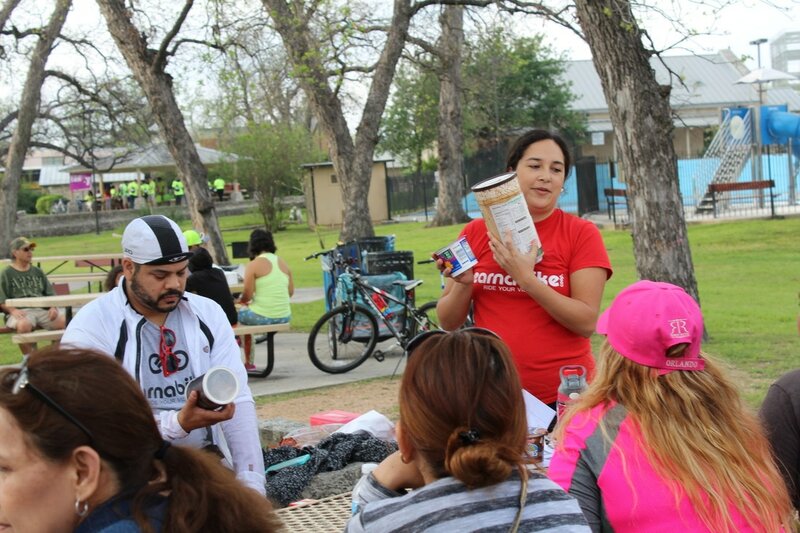 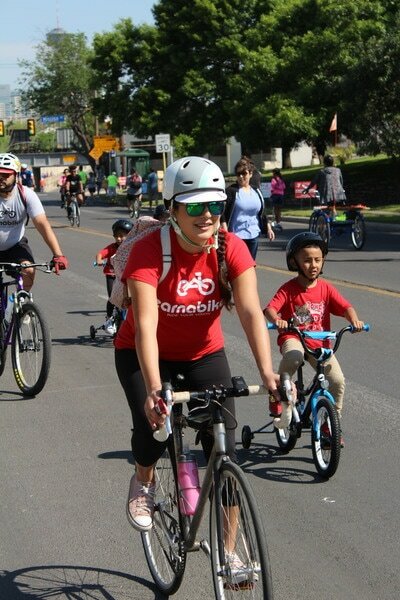 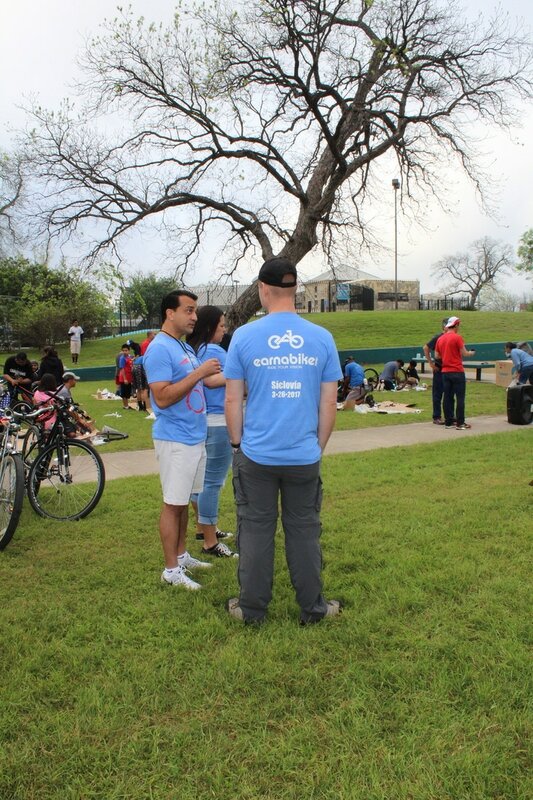 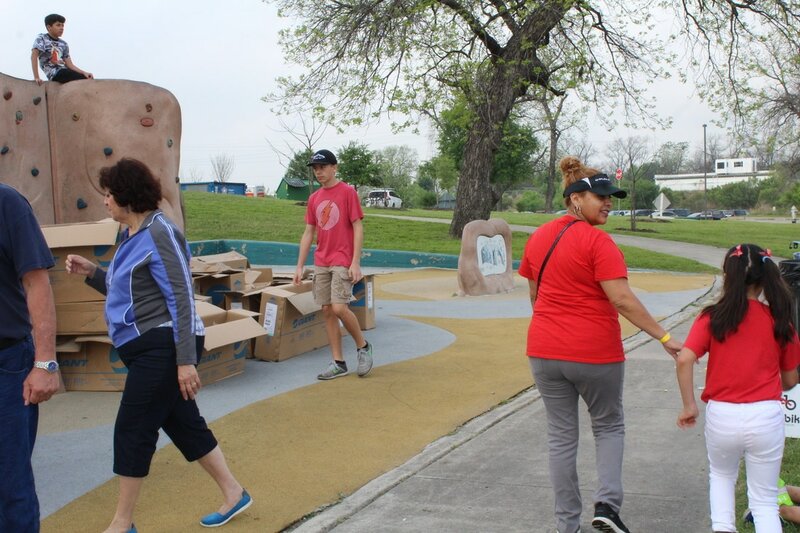 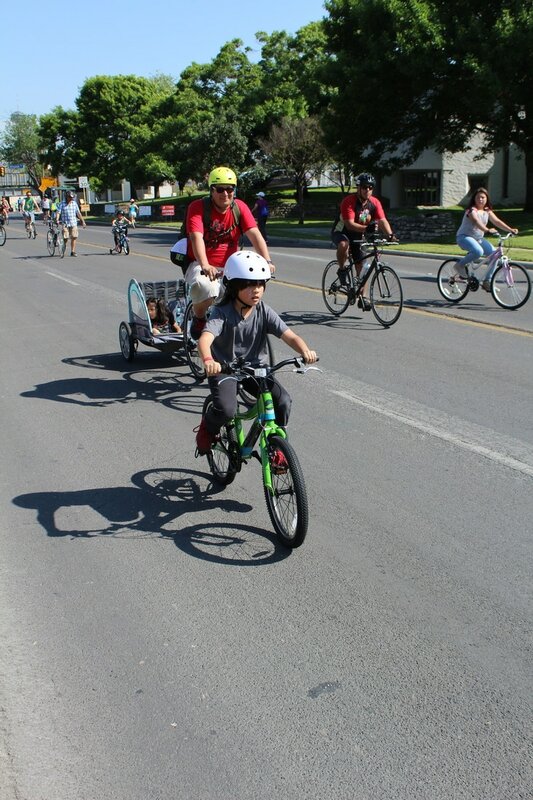 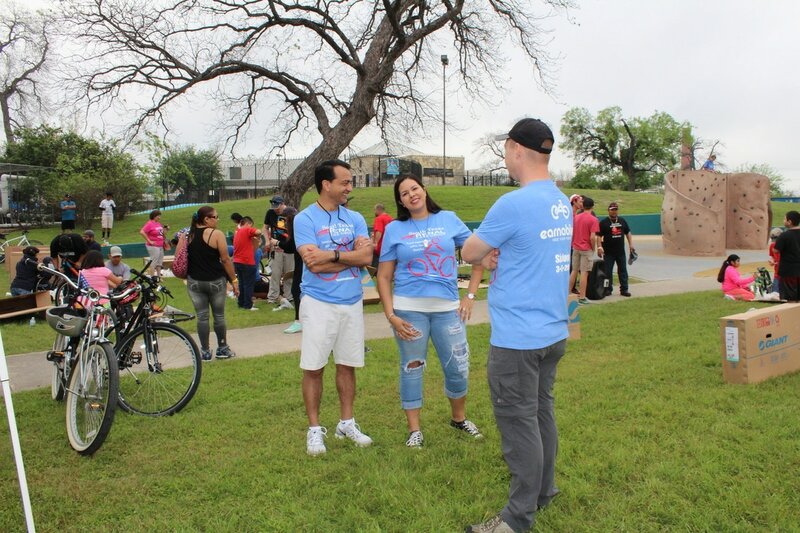 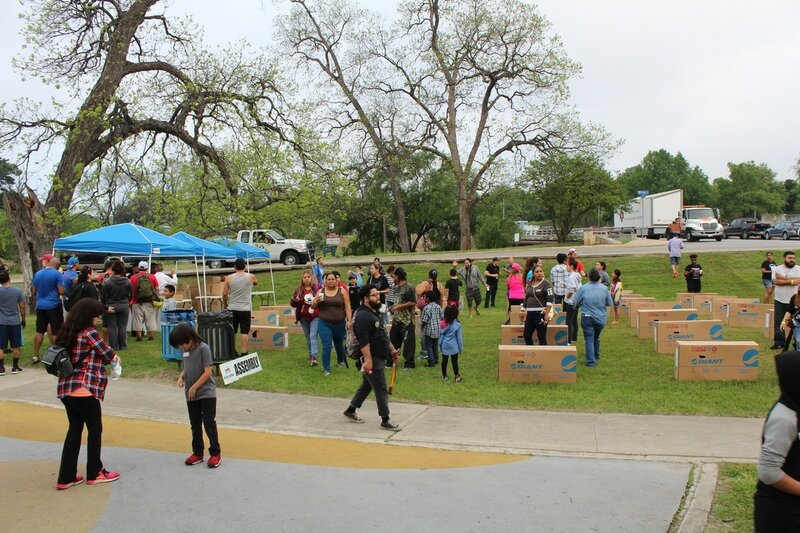 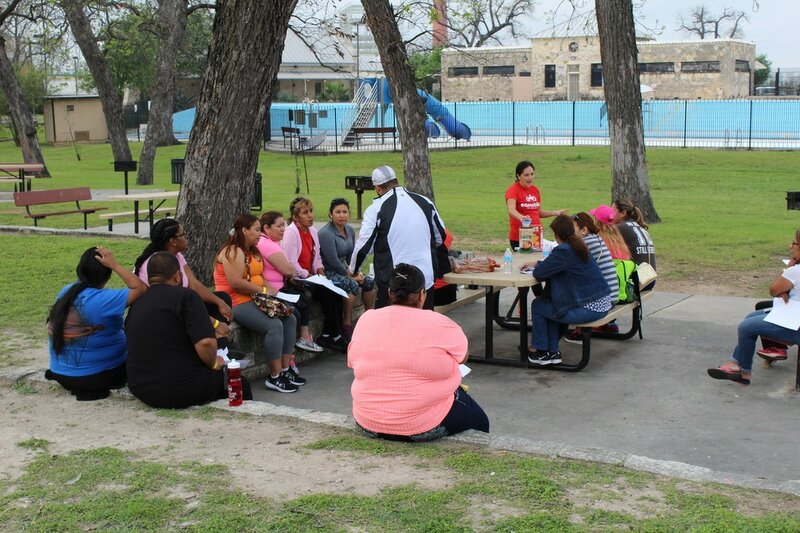 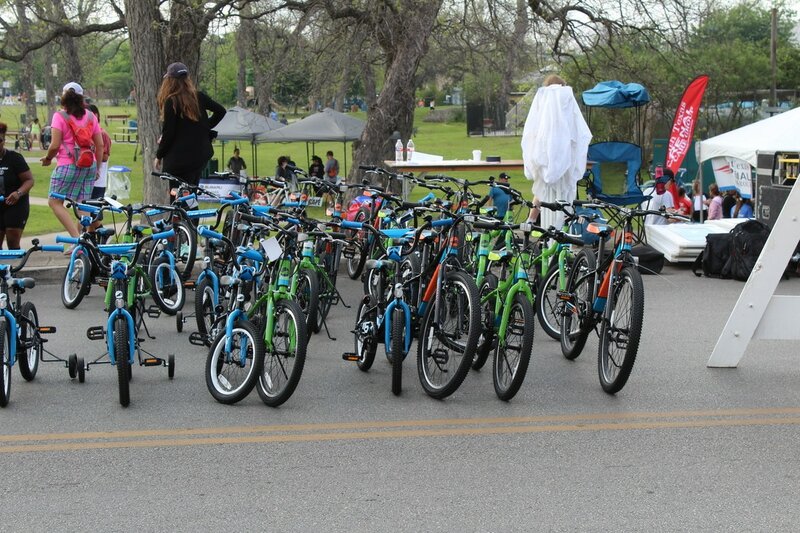 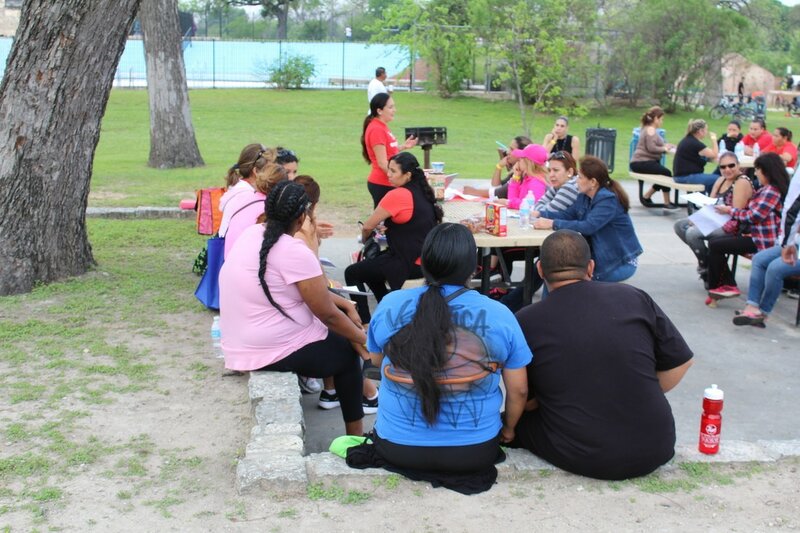 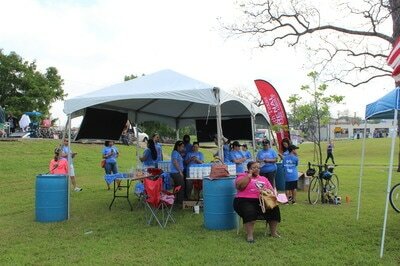 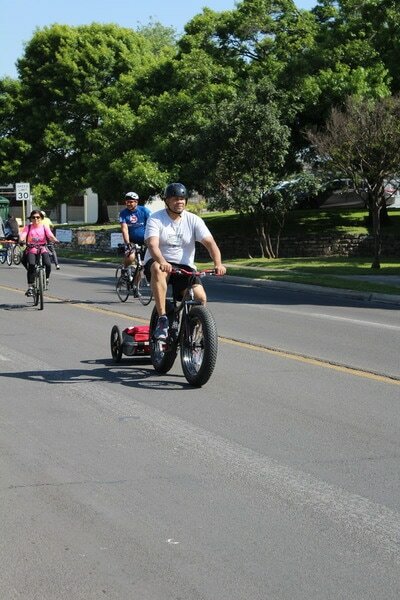 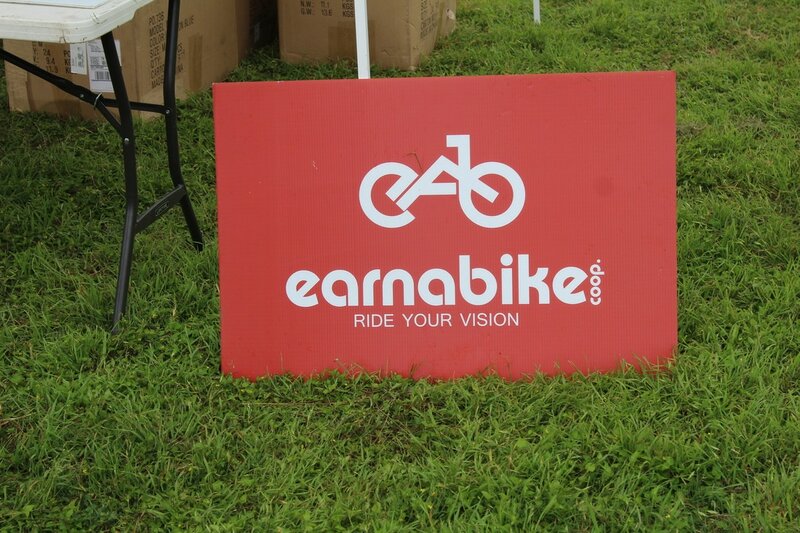 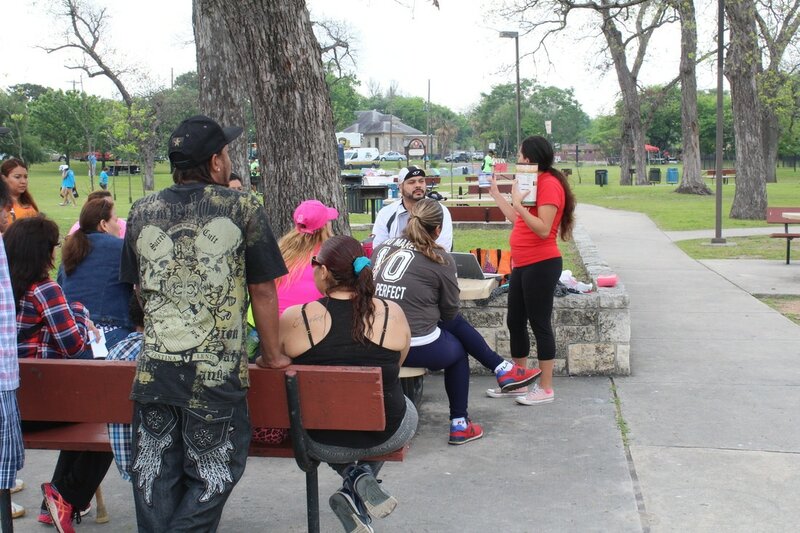 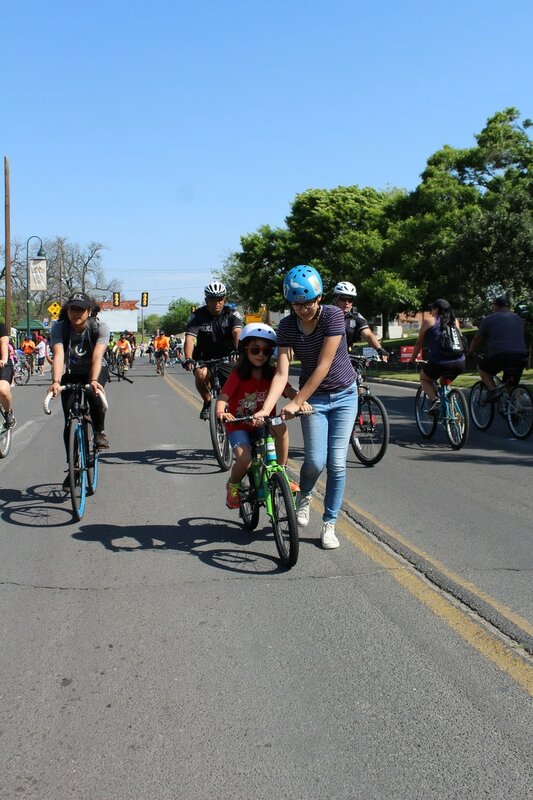 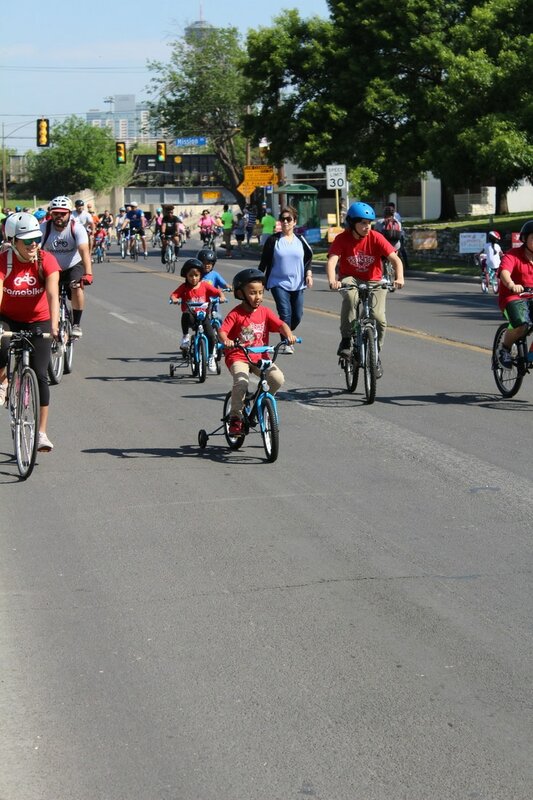 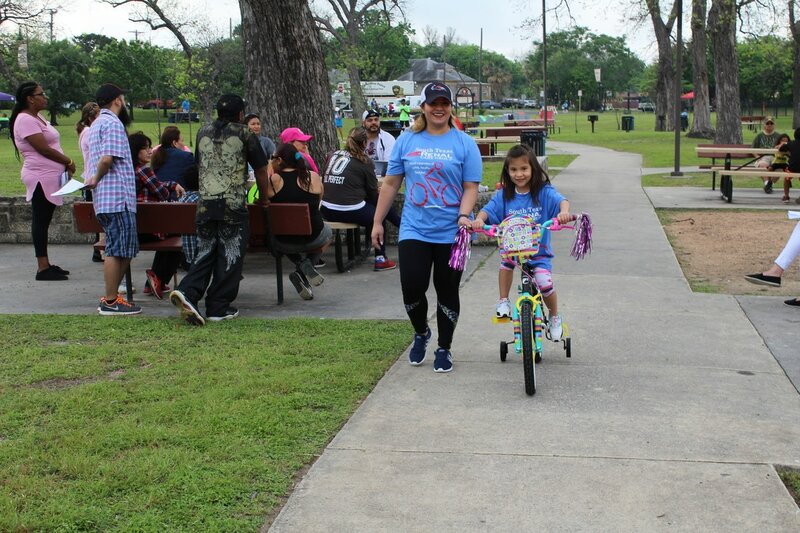 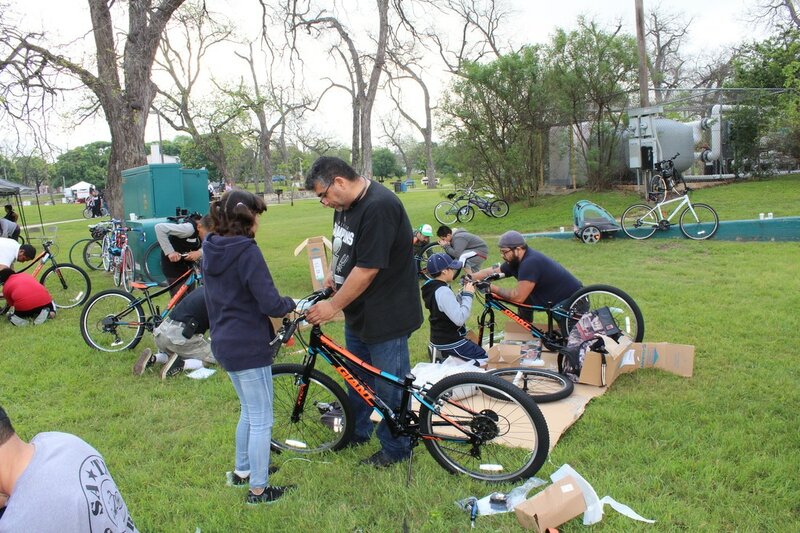 Earn-A-Bike engages parents and guardians to involve themselves in the students educational process and provide a positive motivation for completing the program. 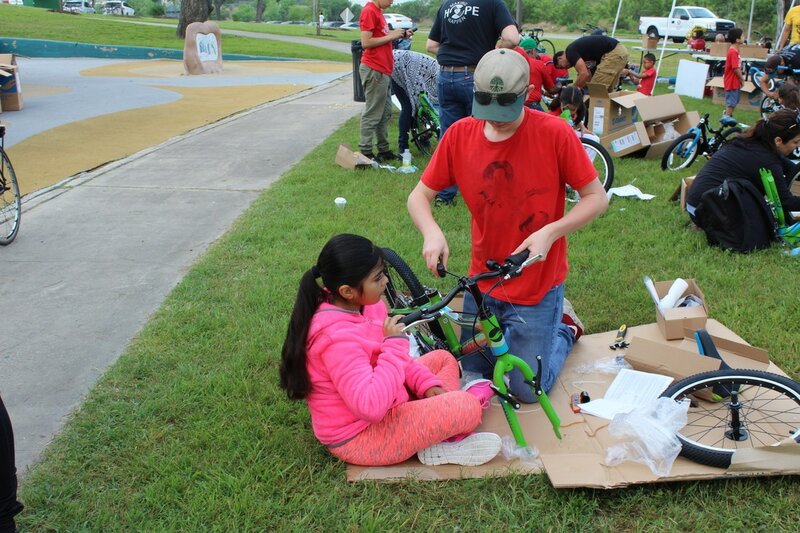 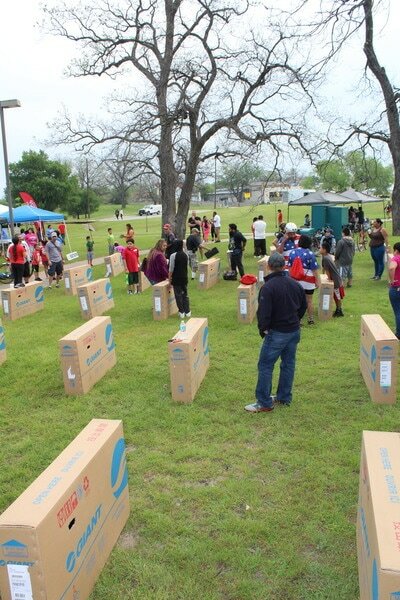 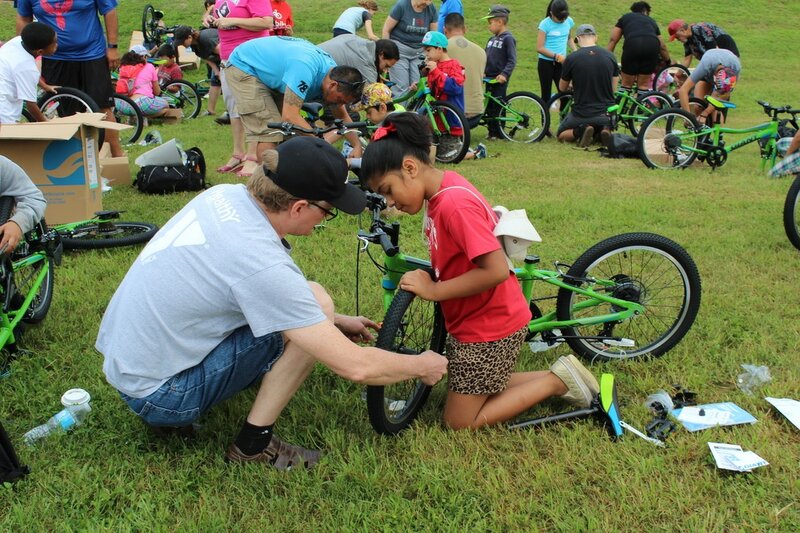 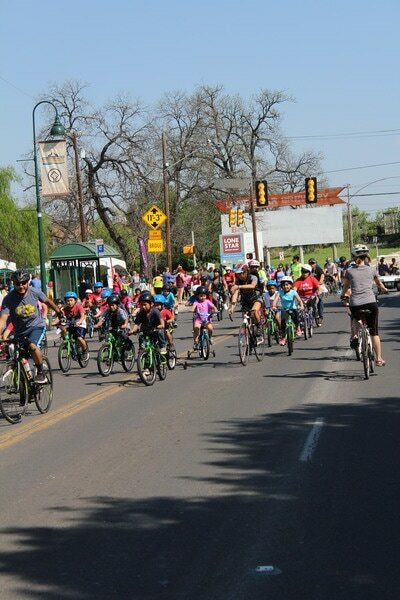 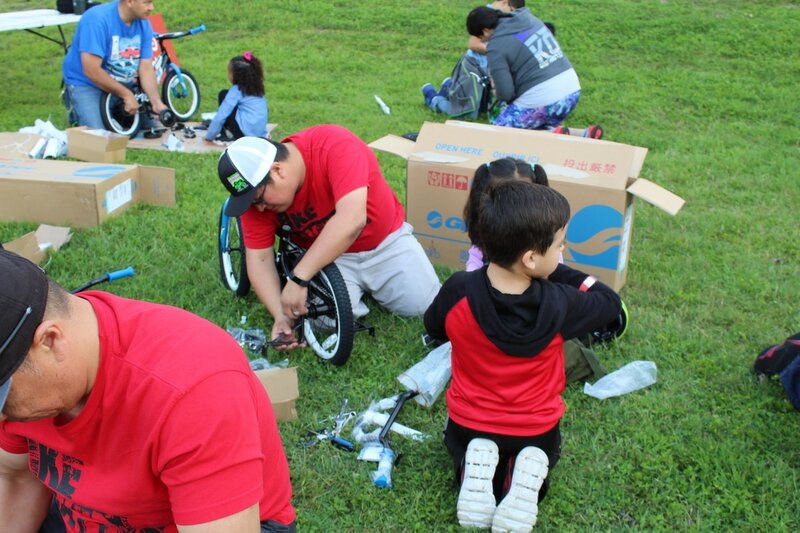 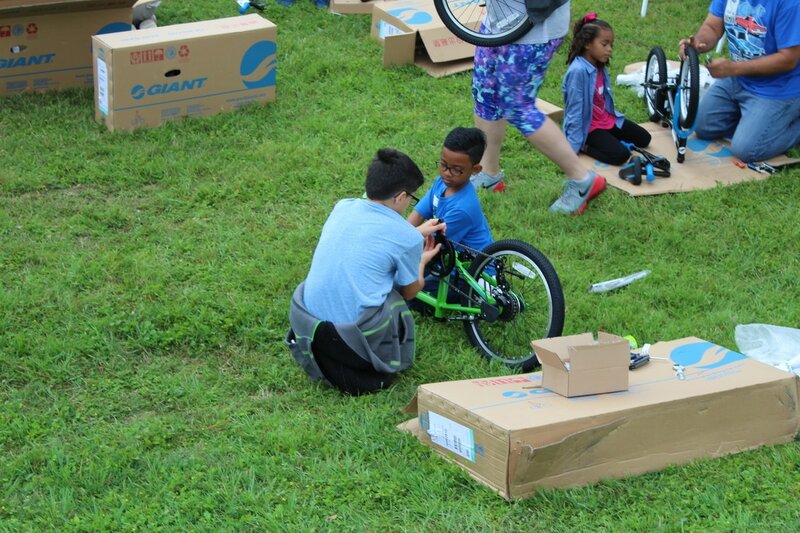 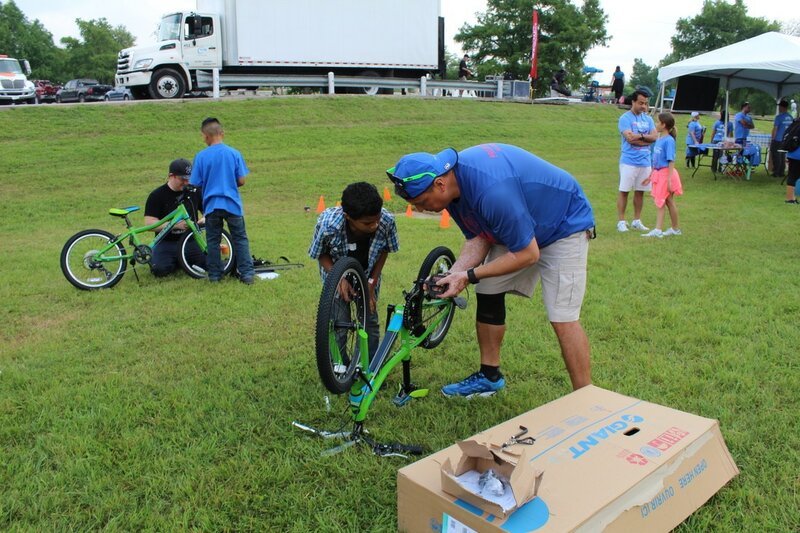 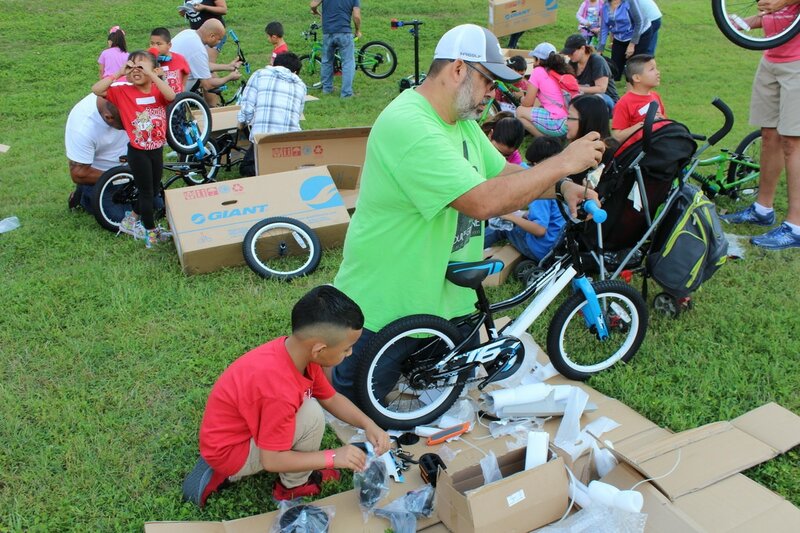 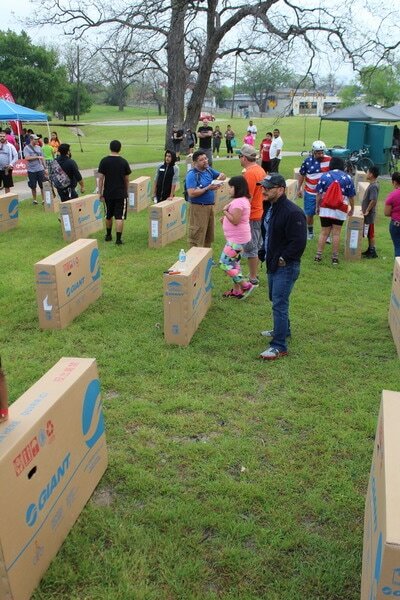 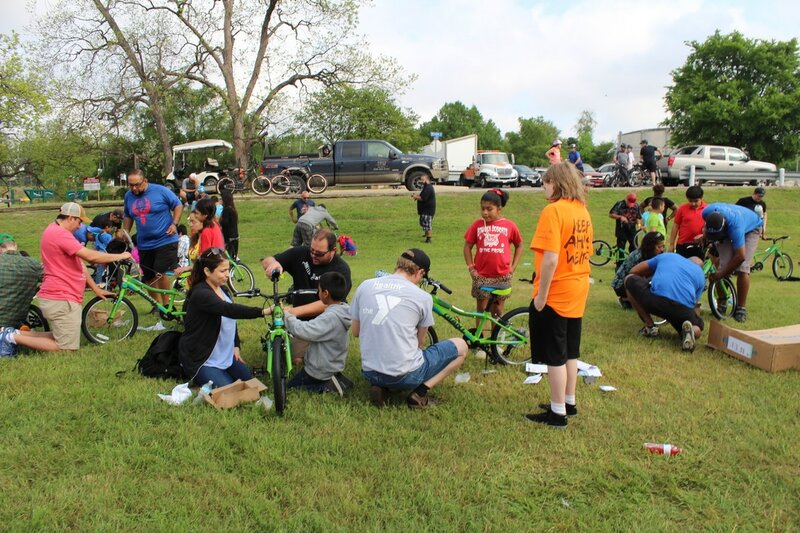 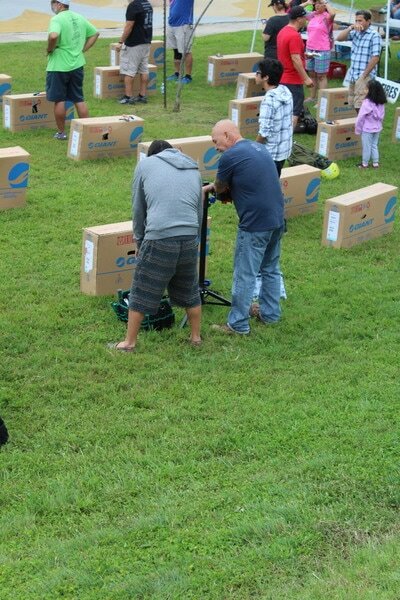 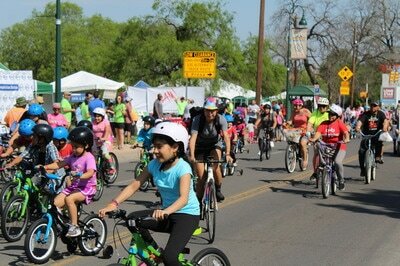 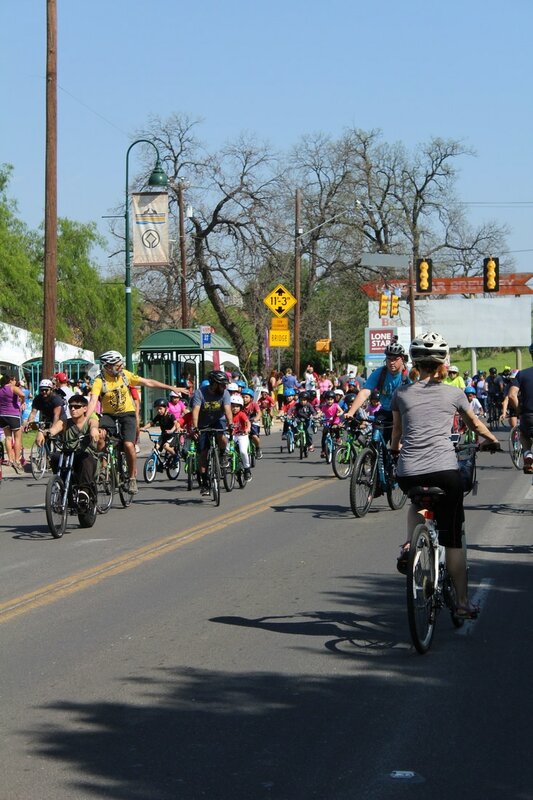 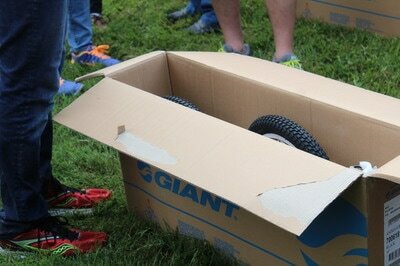 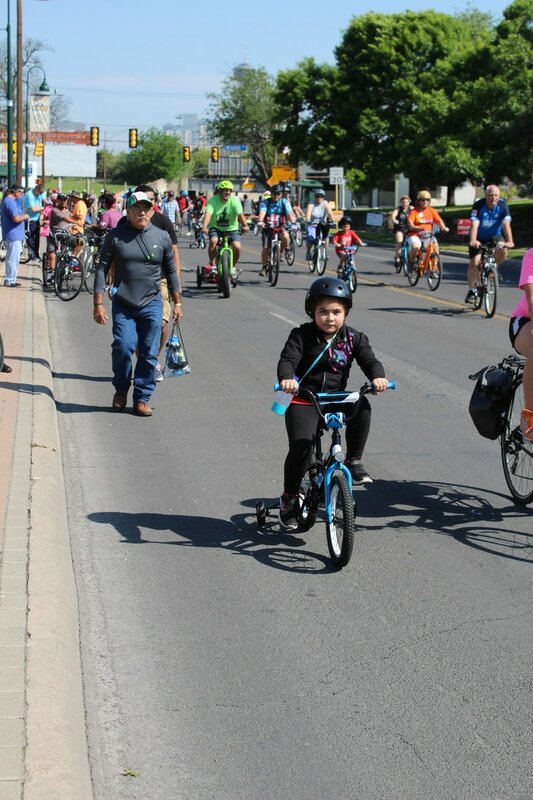 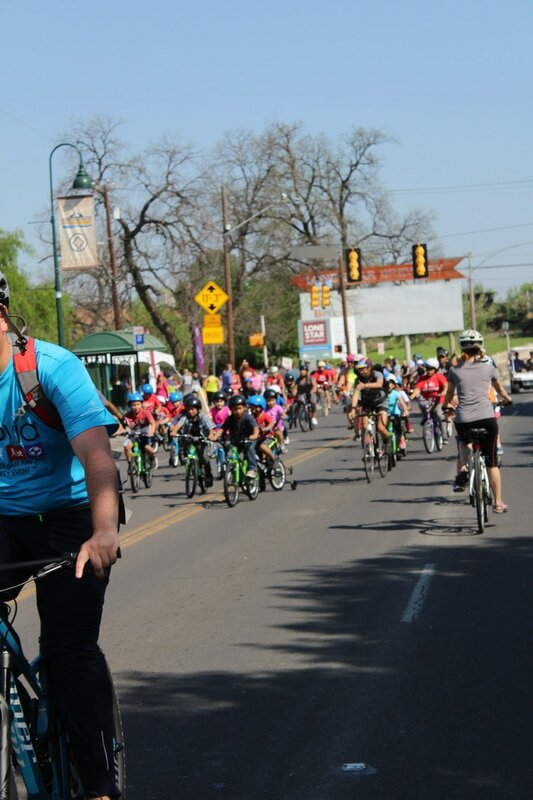 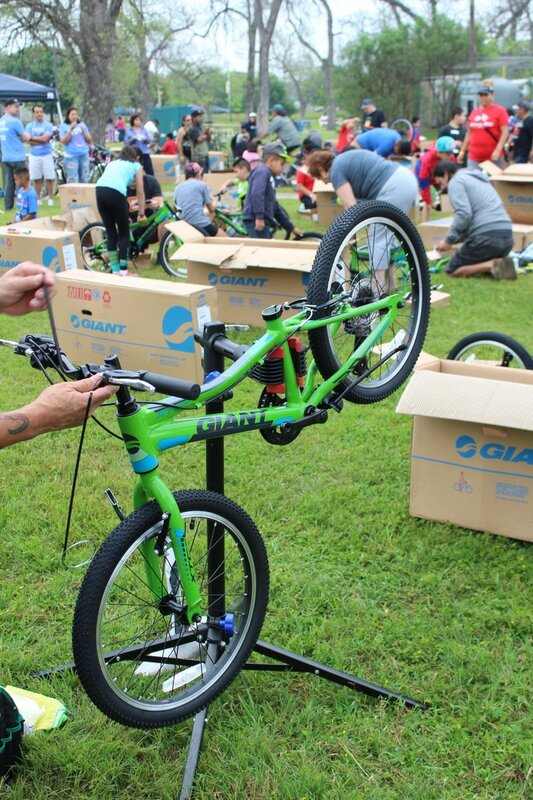 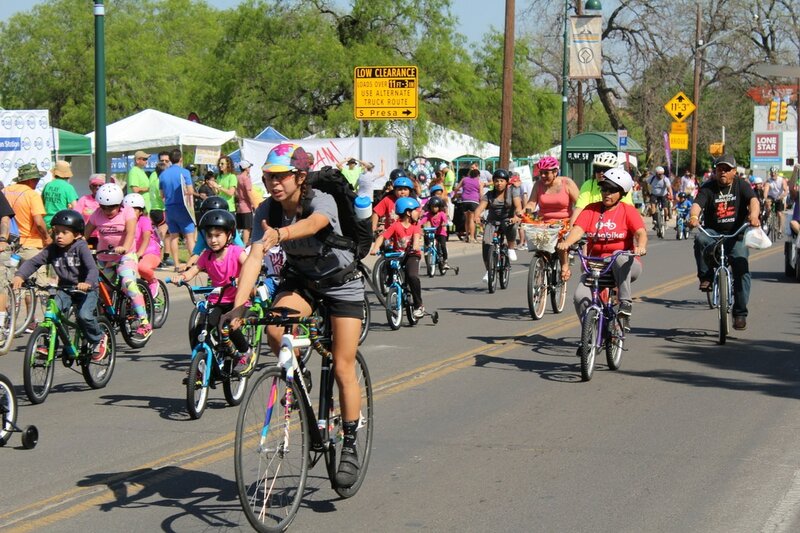 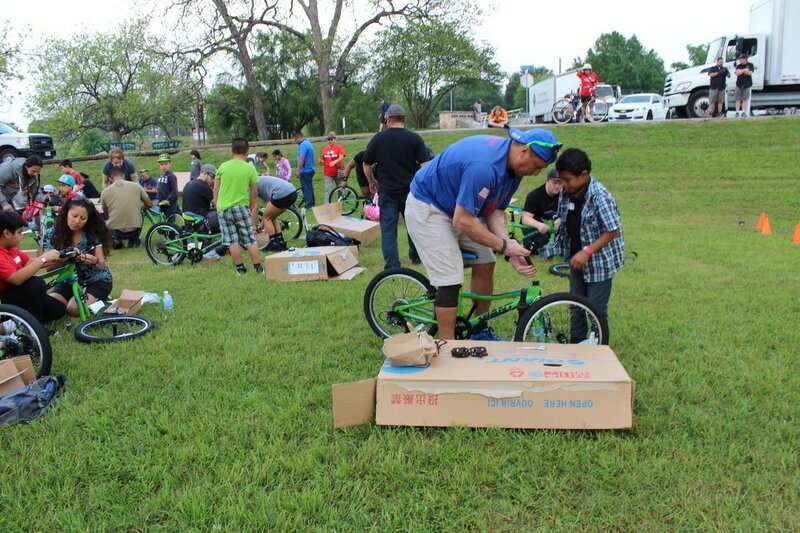 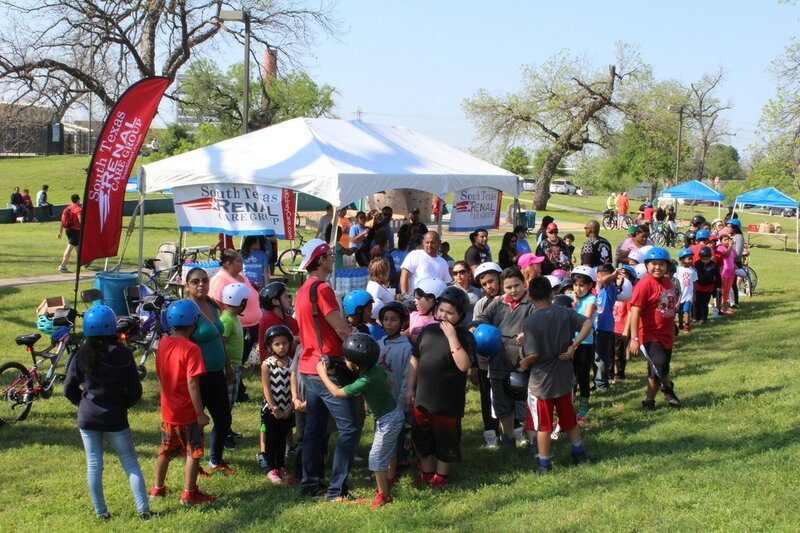 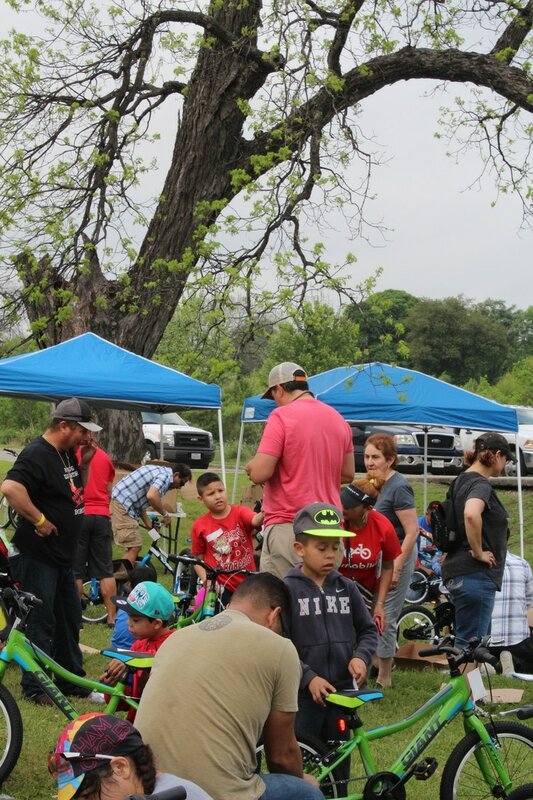 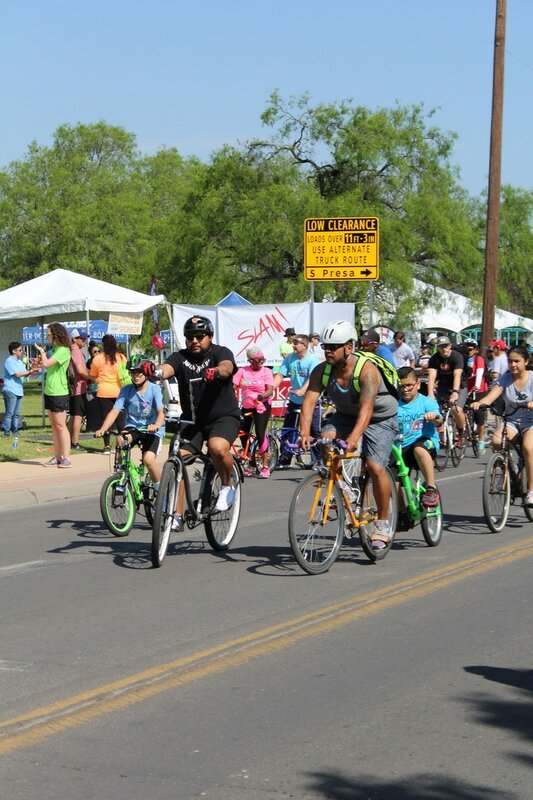 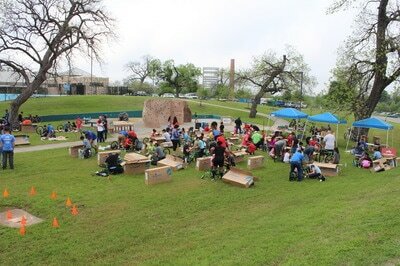 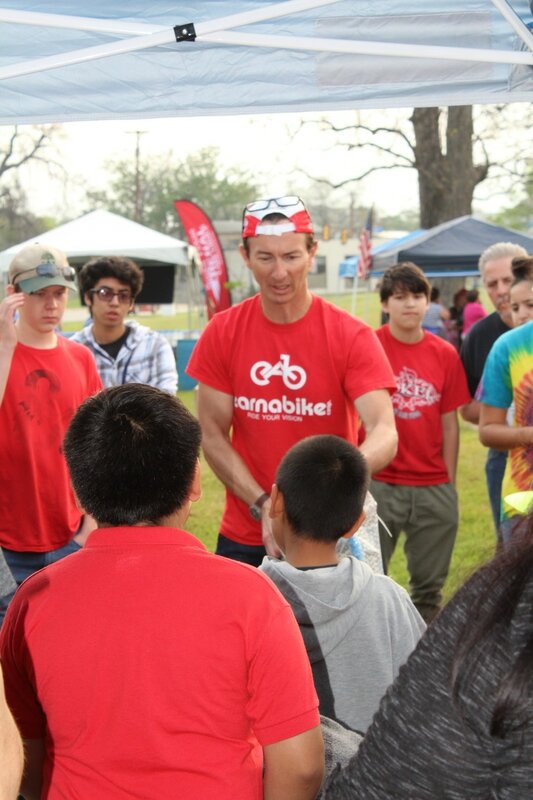 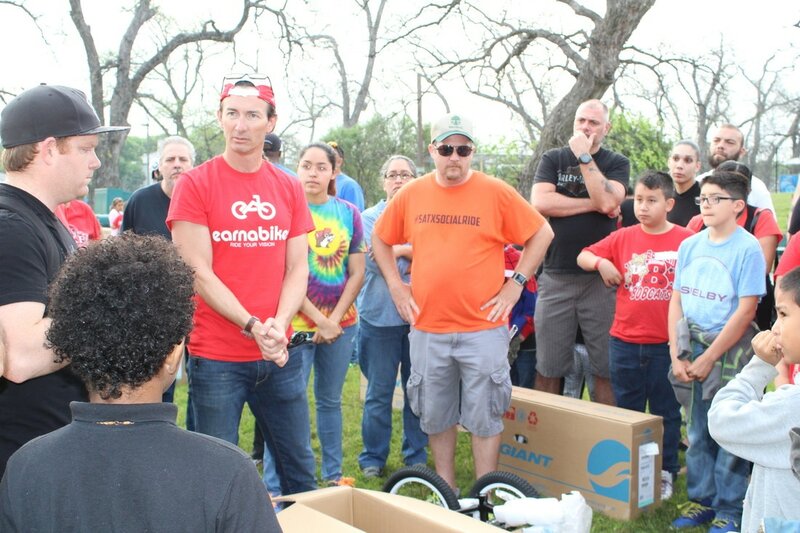 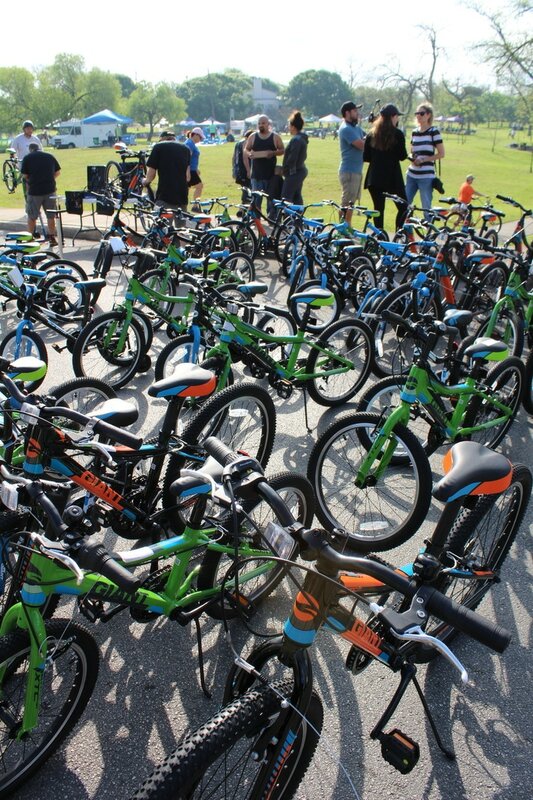 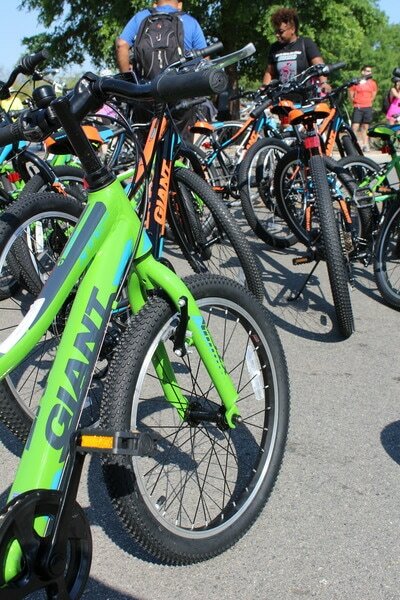 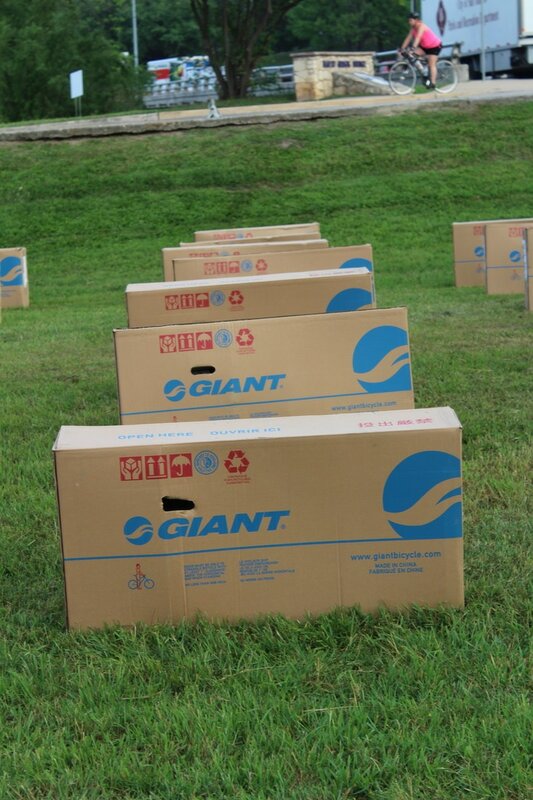 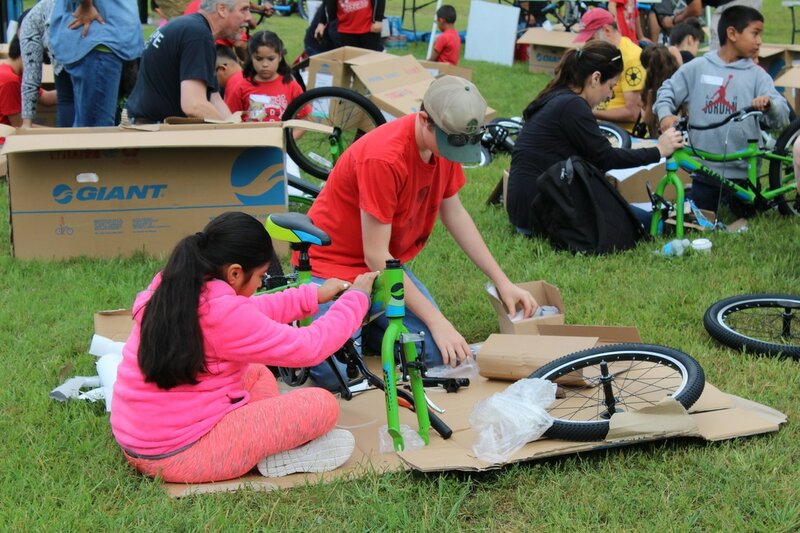 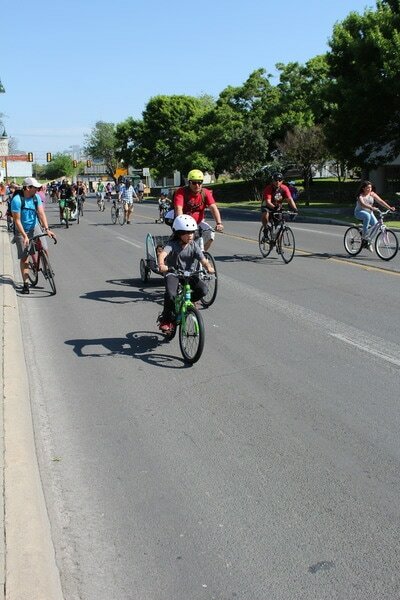 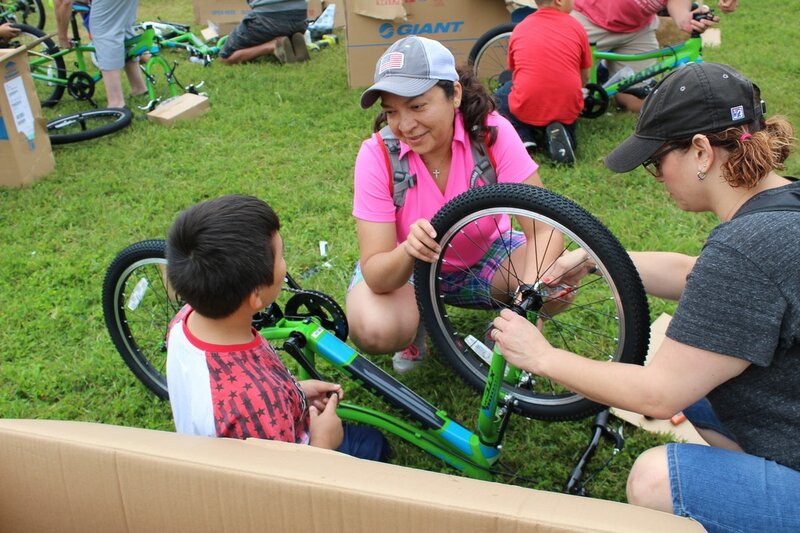 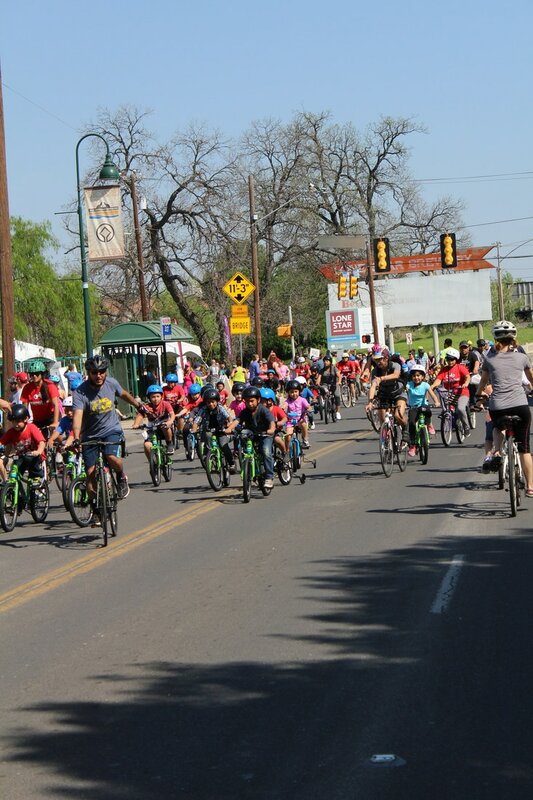 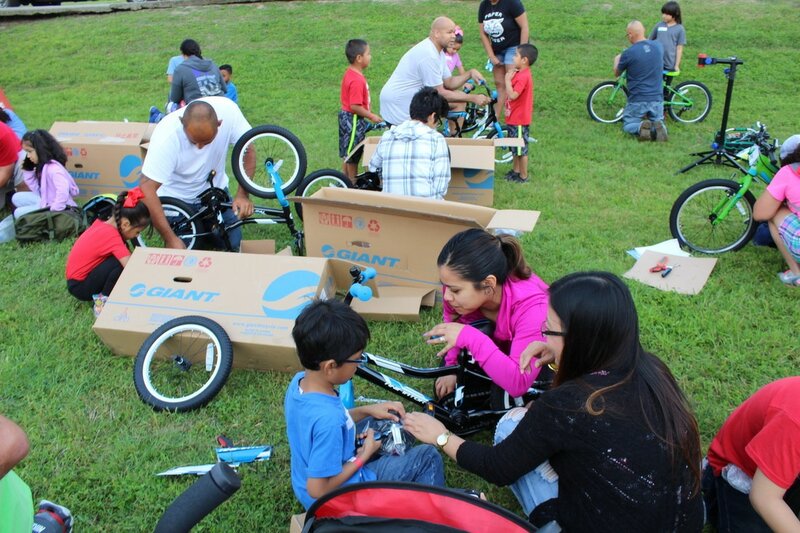 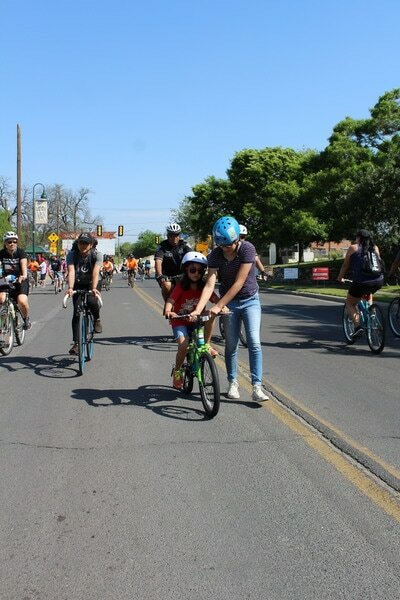 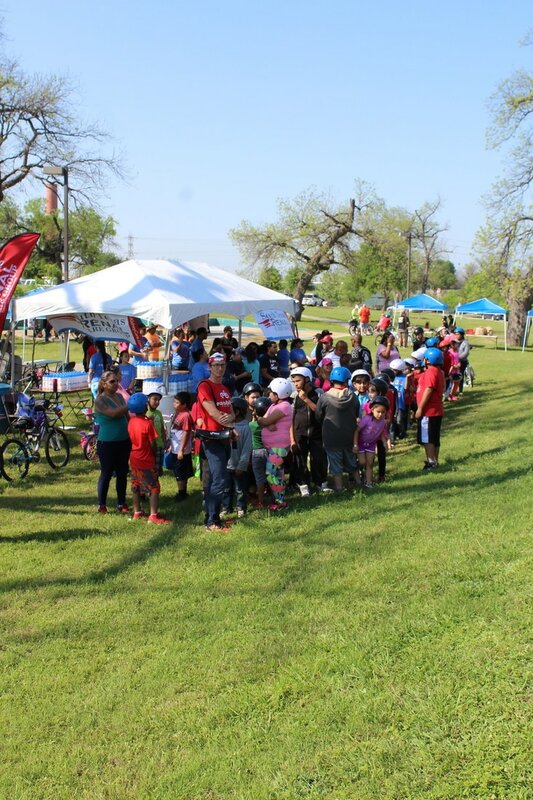 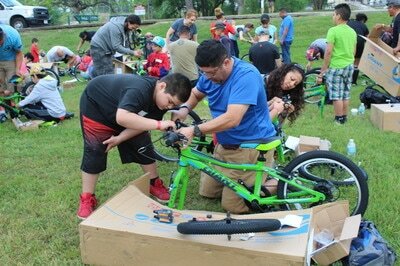 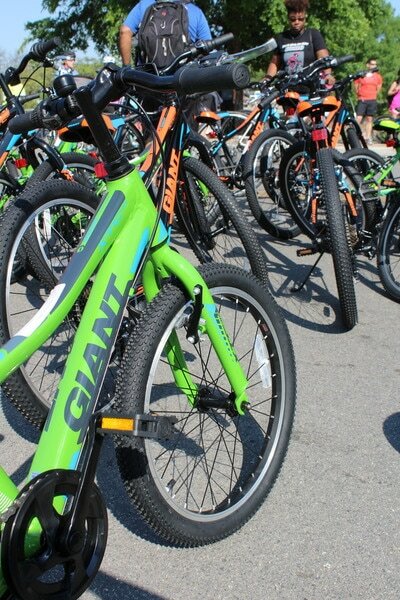 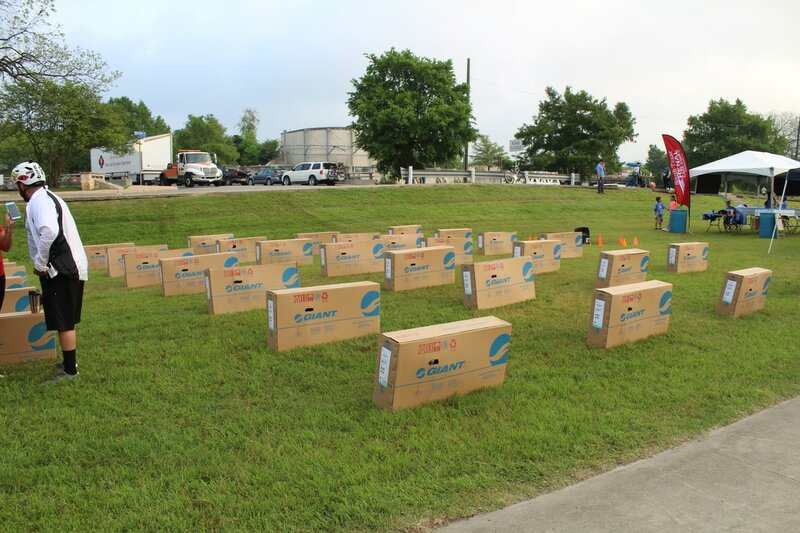 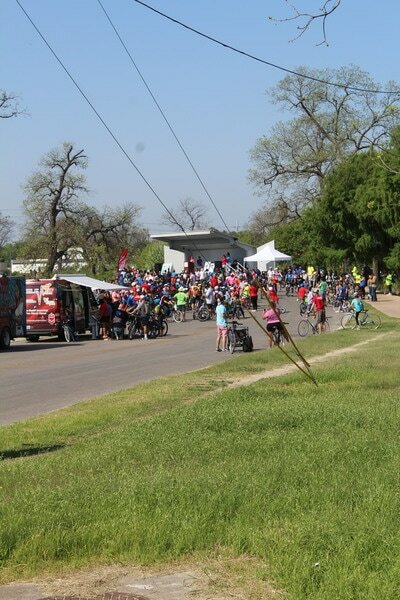 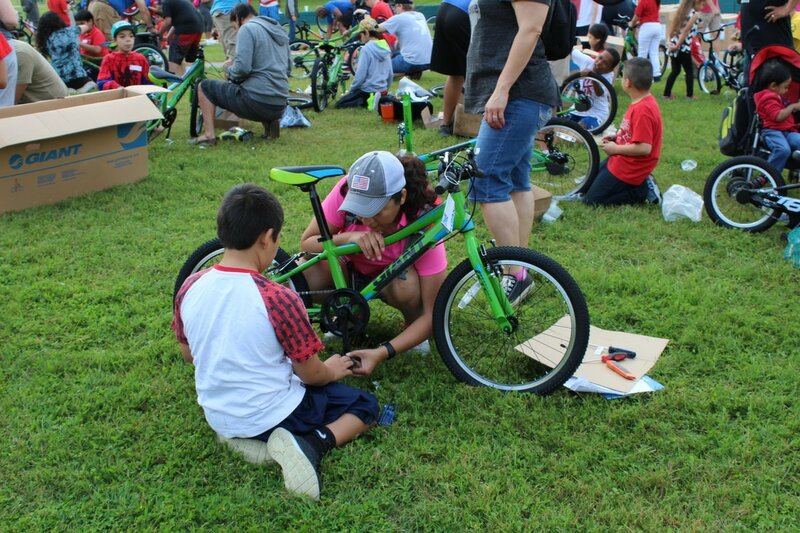 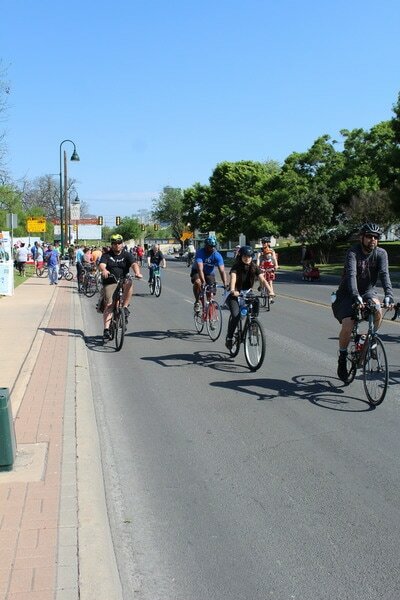 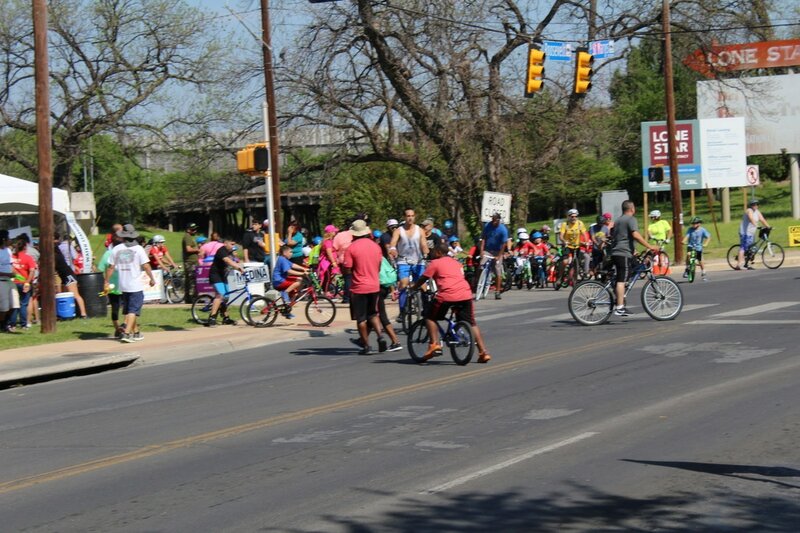 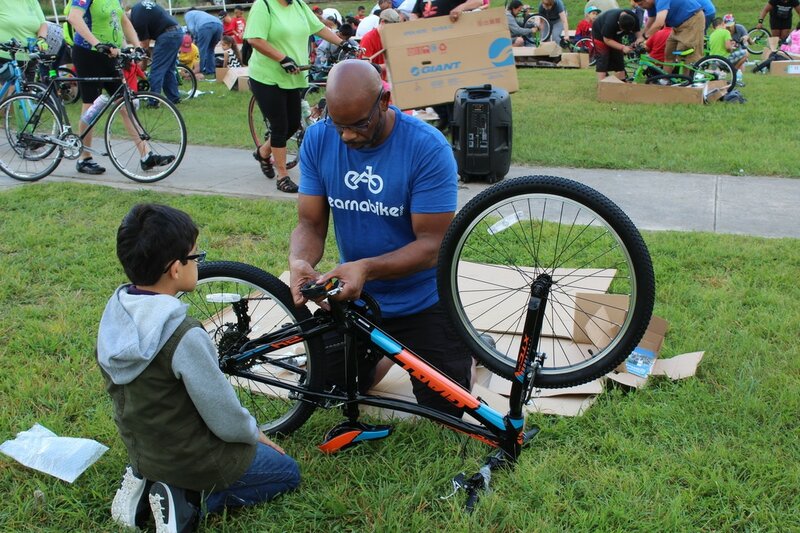 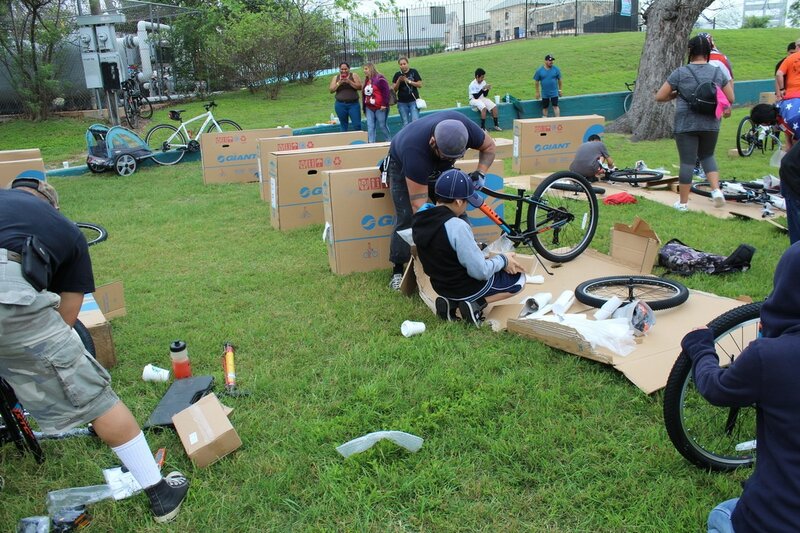 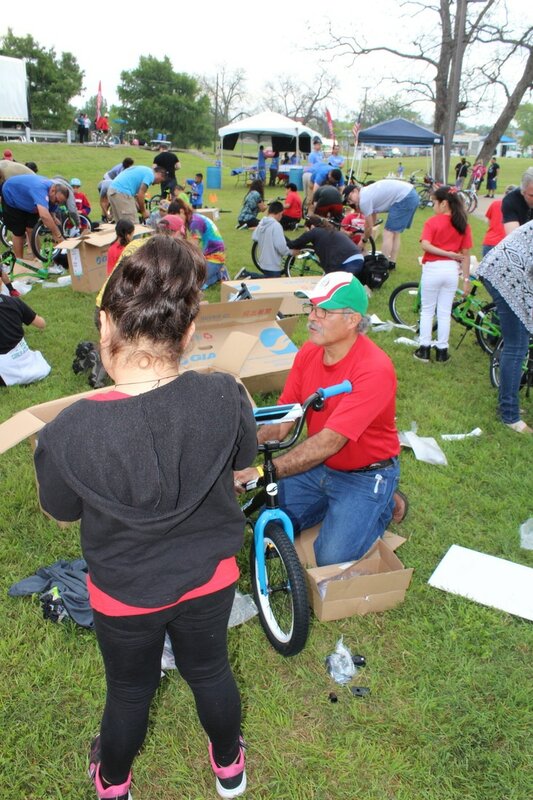 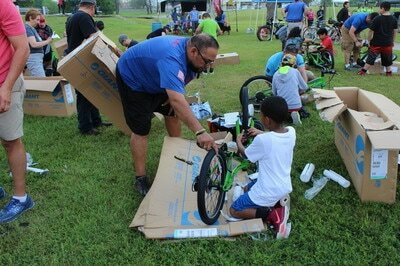 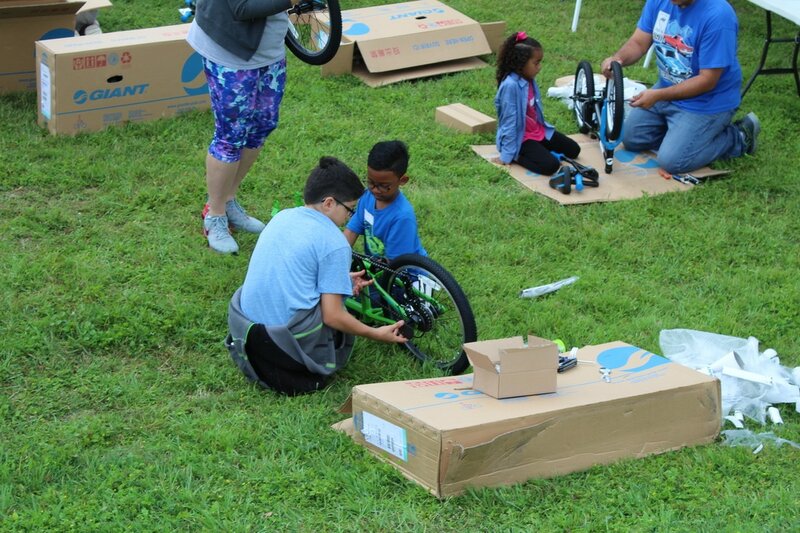 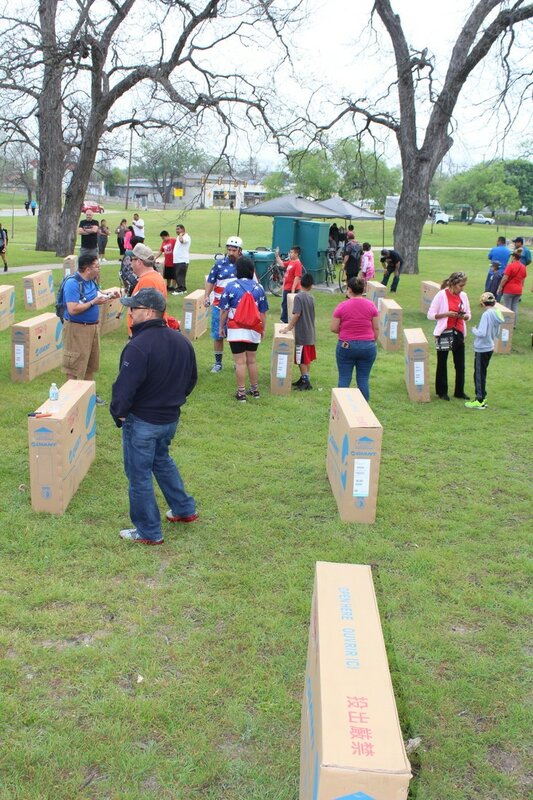 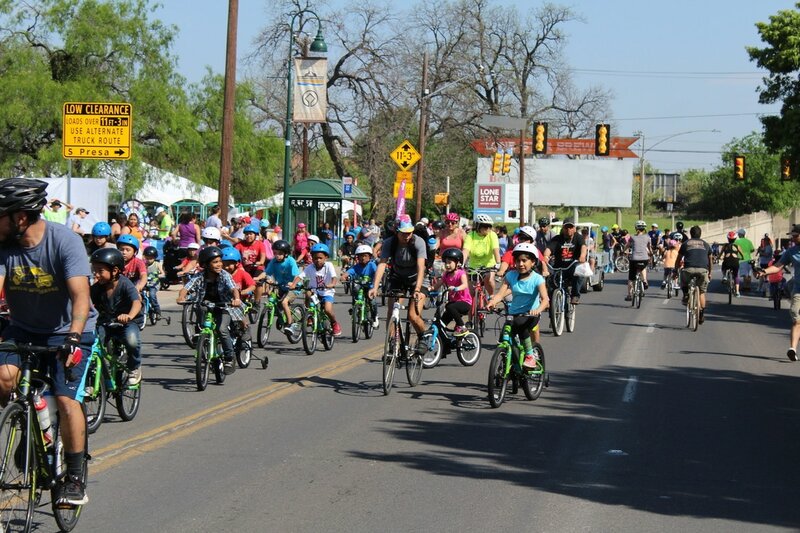 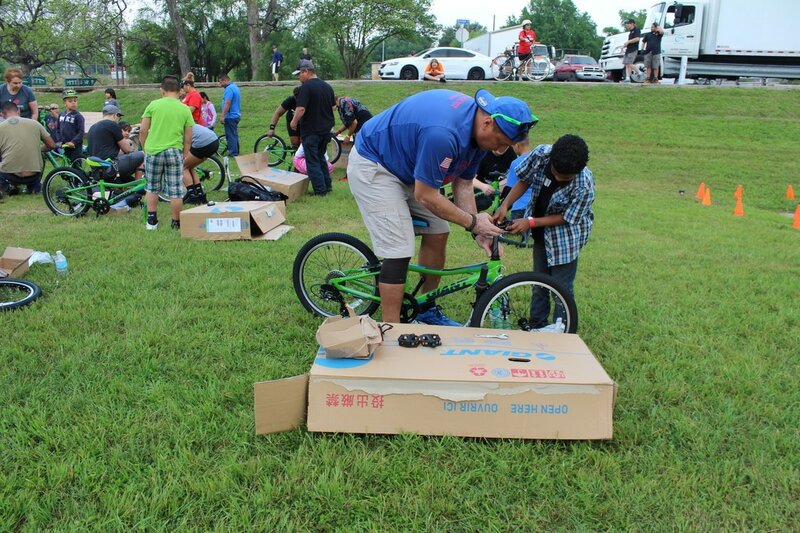 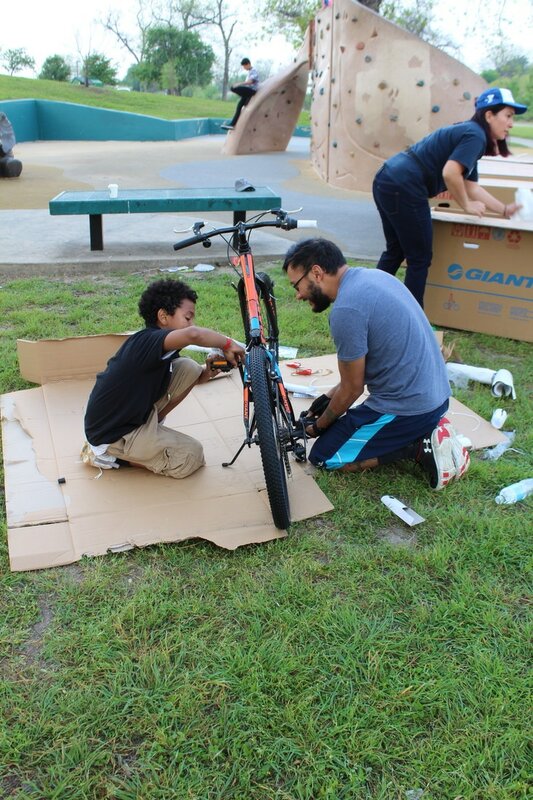 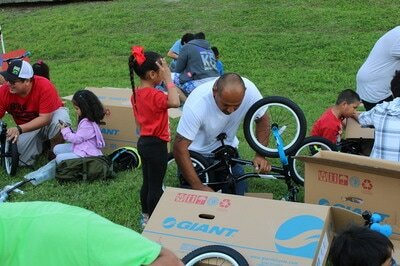 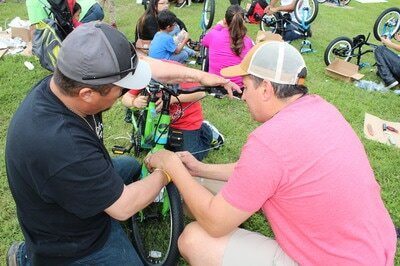 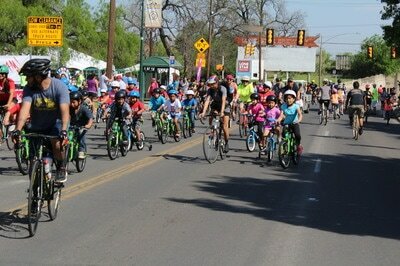 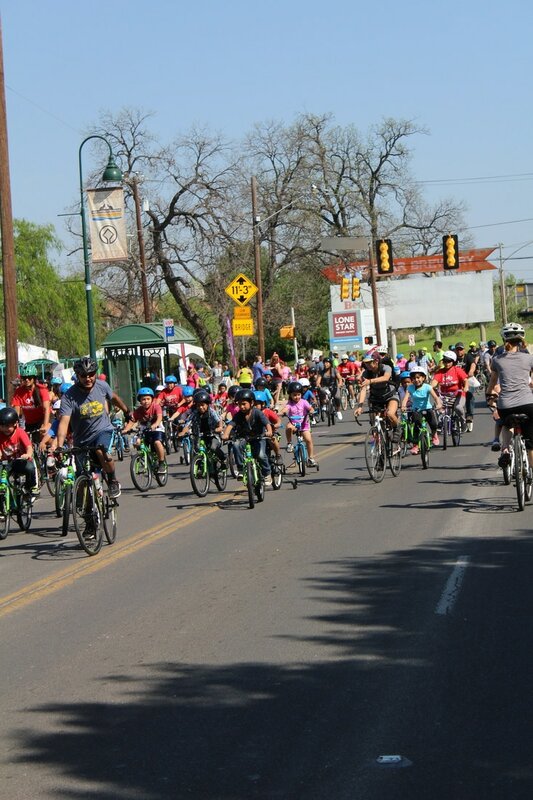 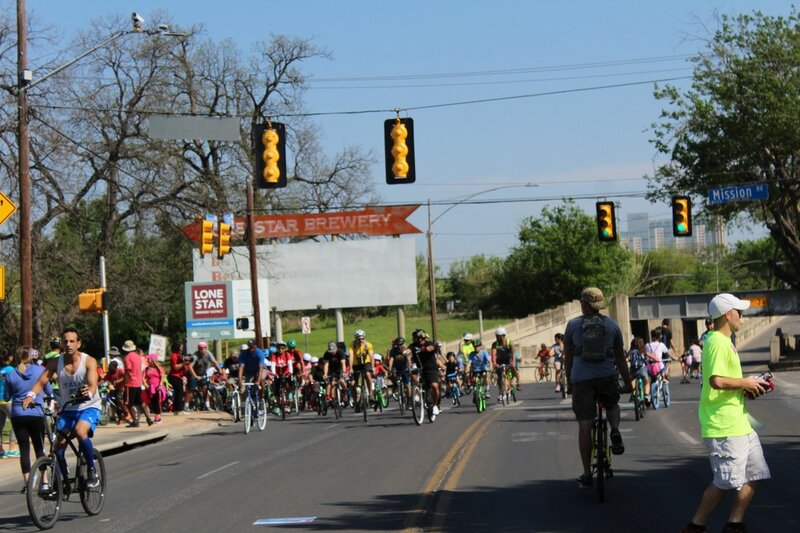 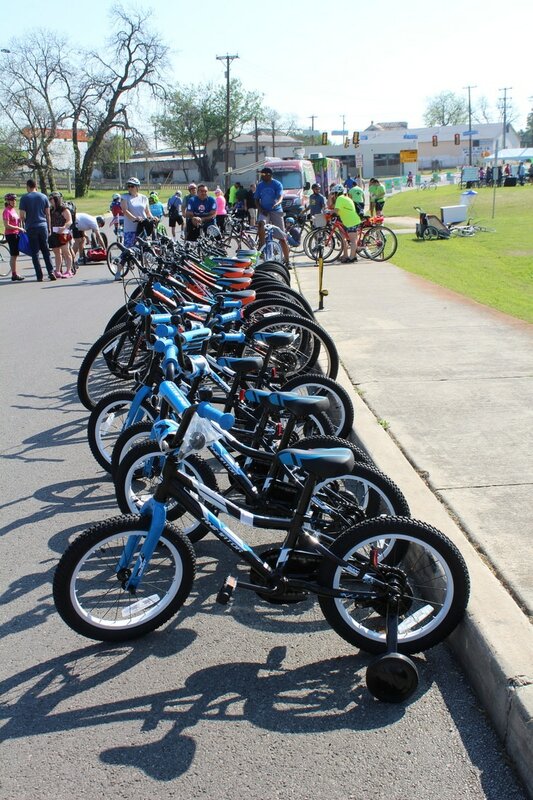 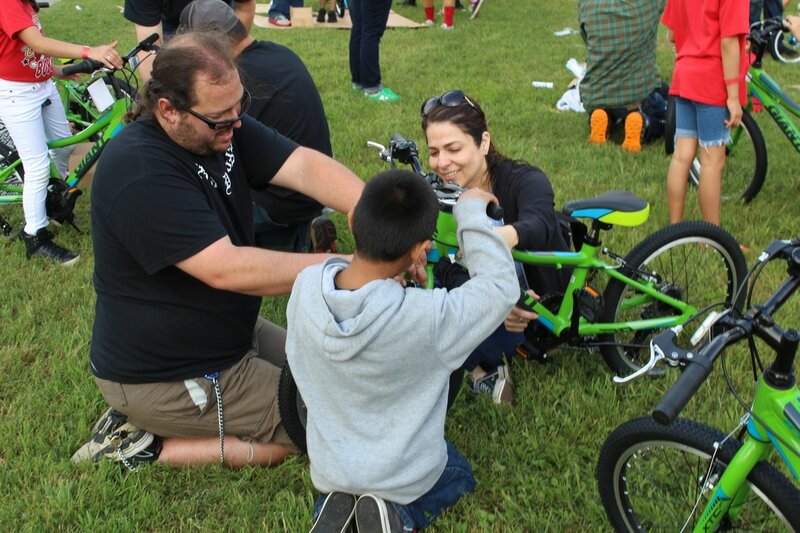 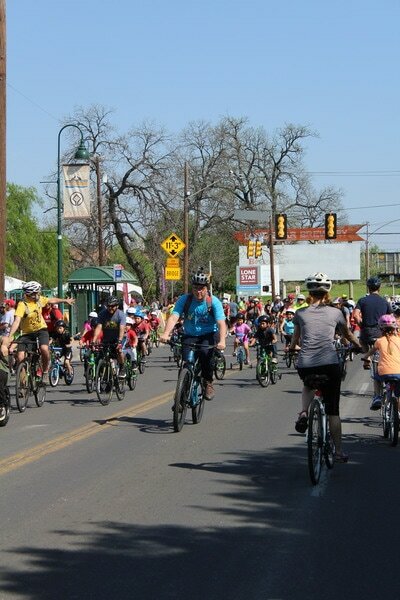 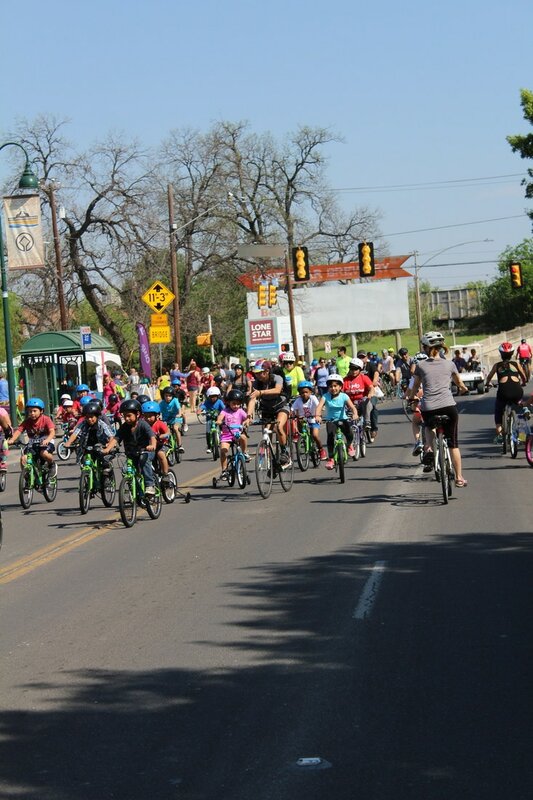 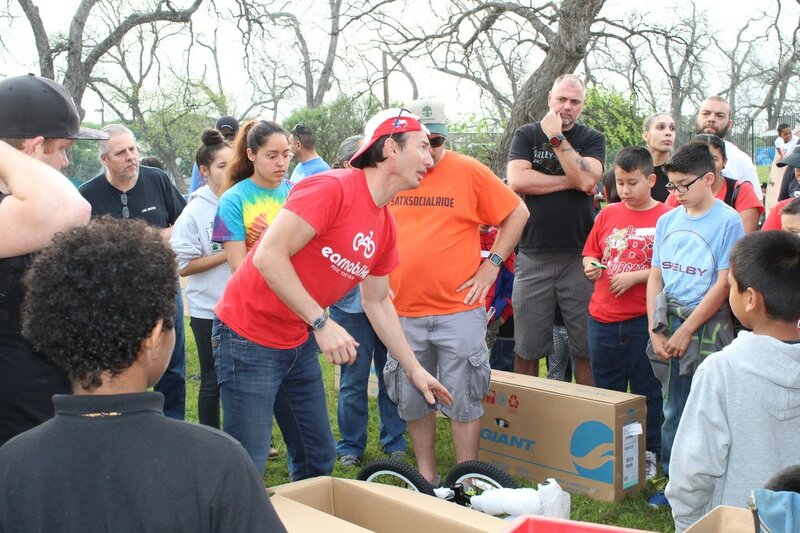 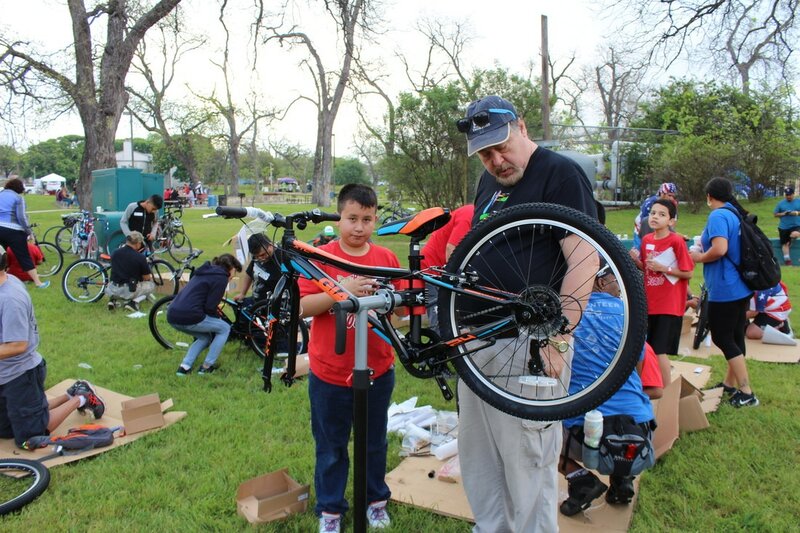 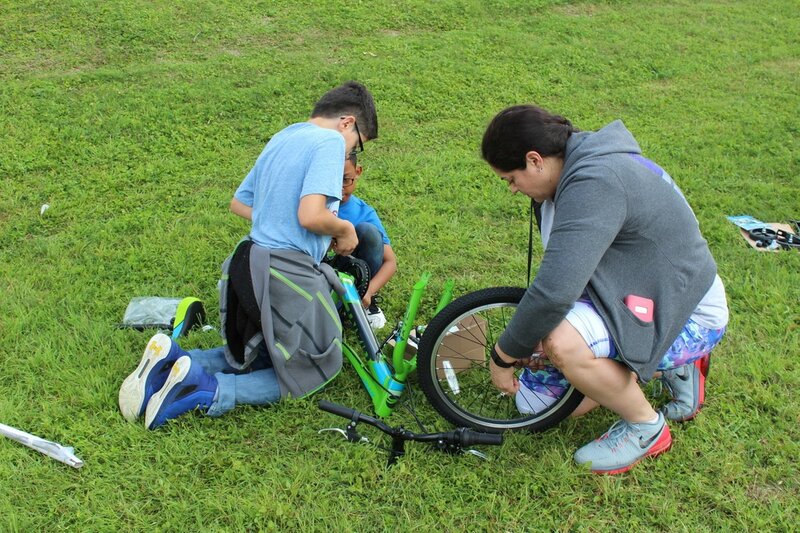 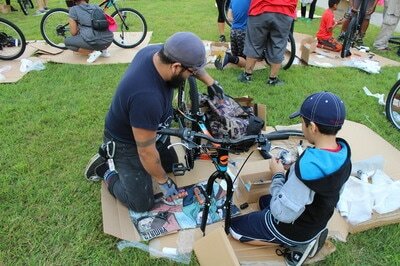 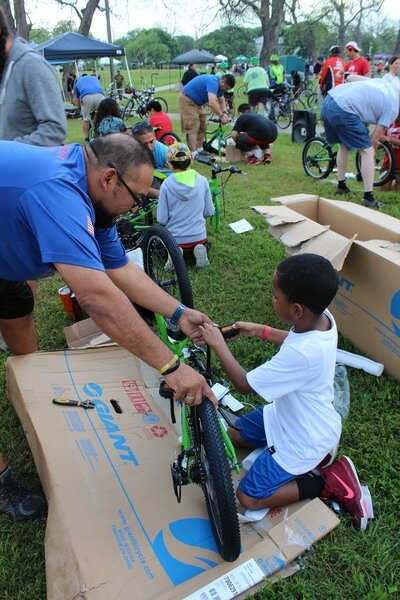 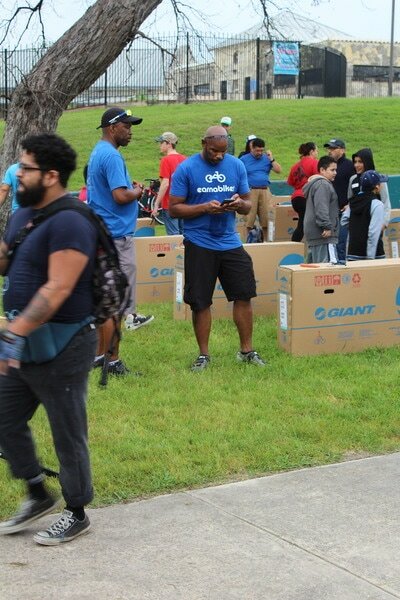 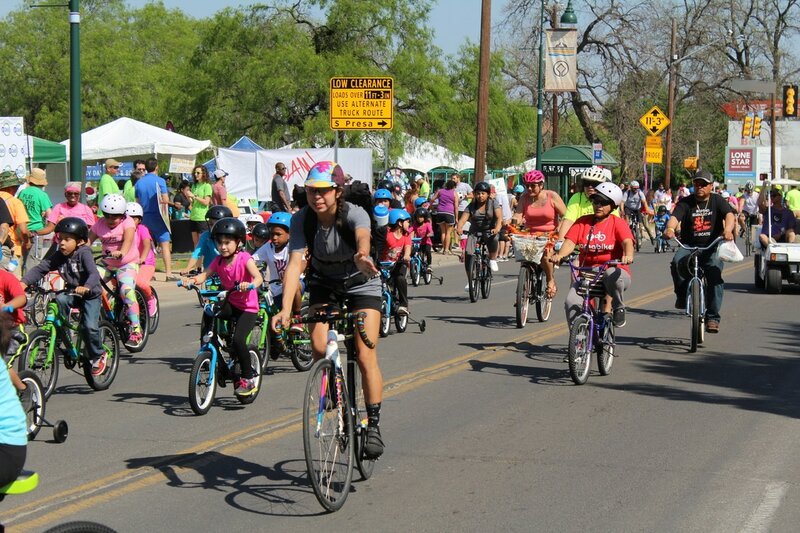 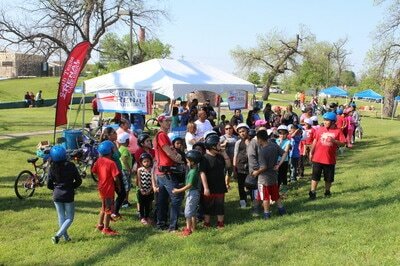 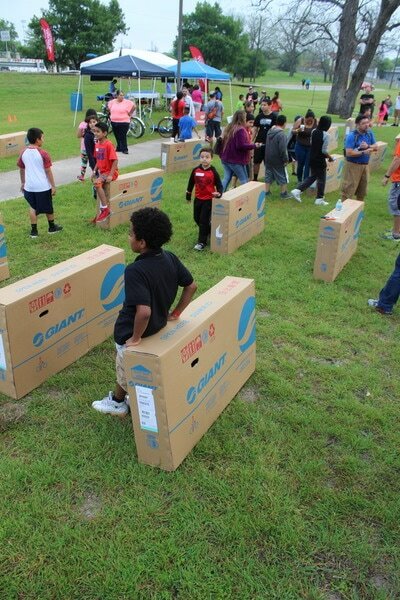 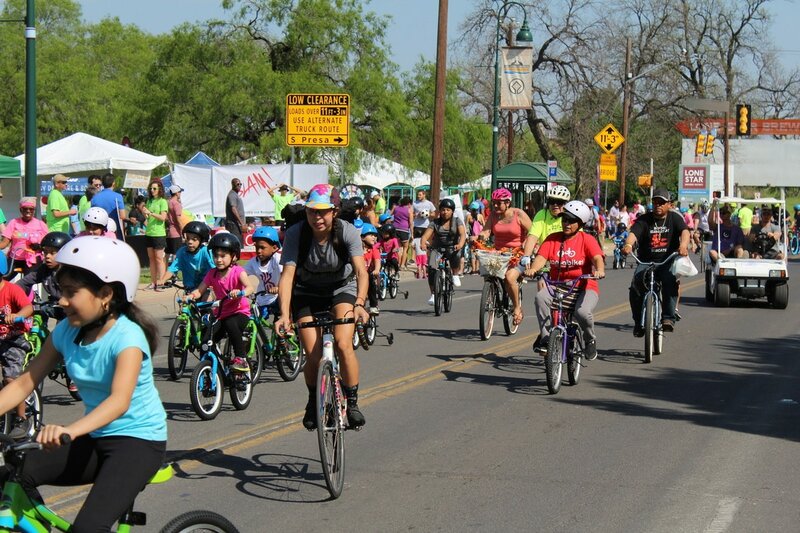 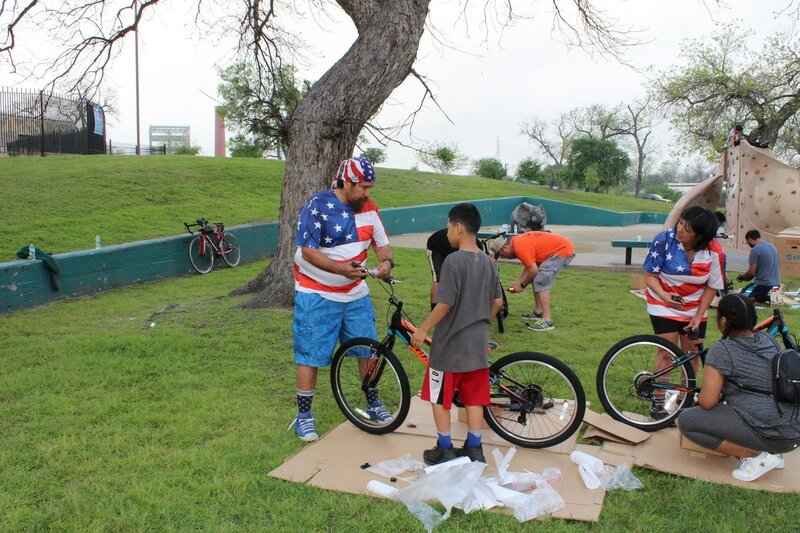 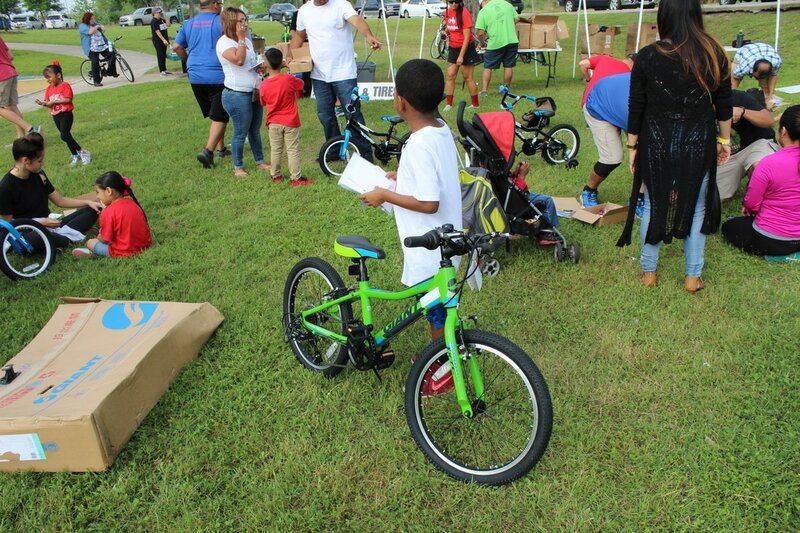 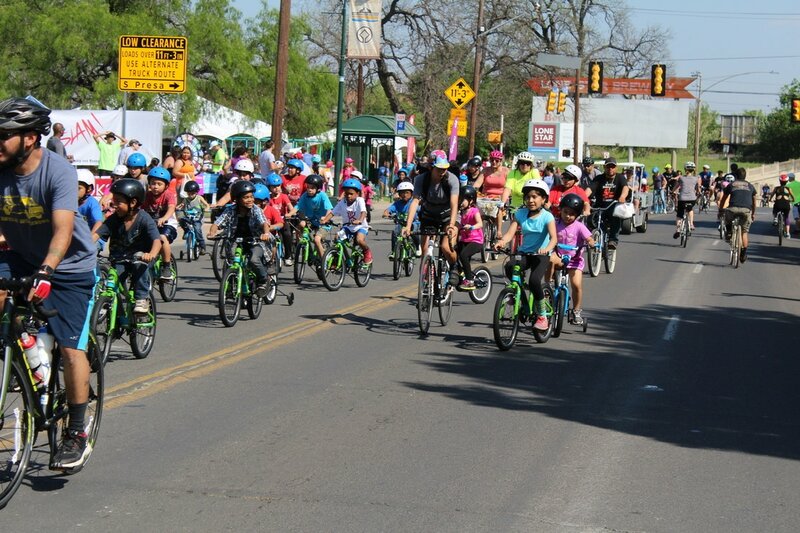 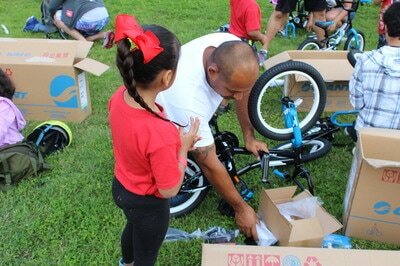 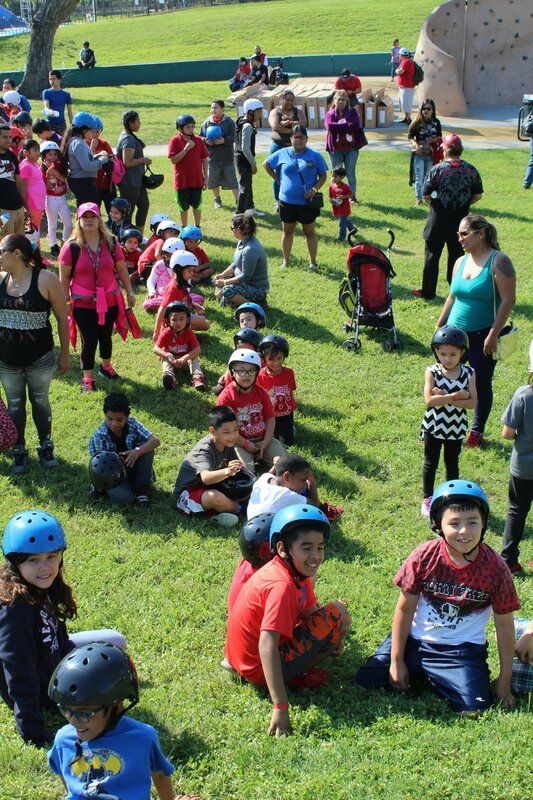 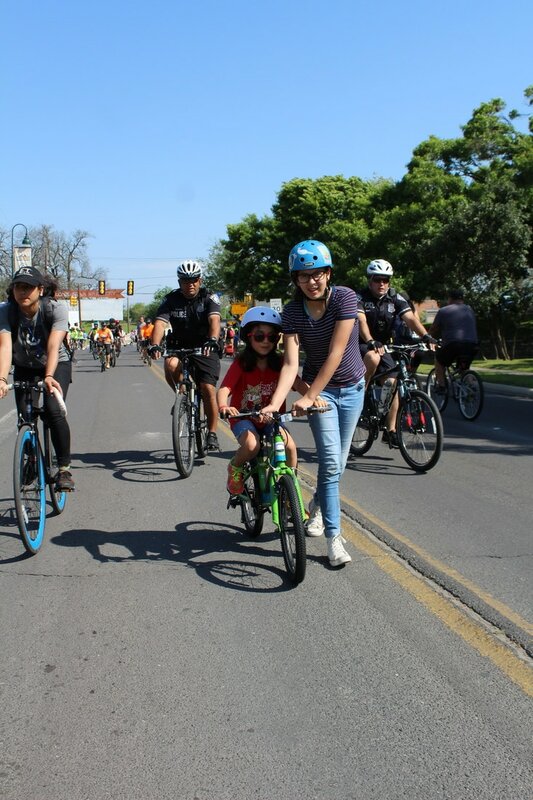 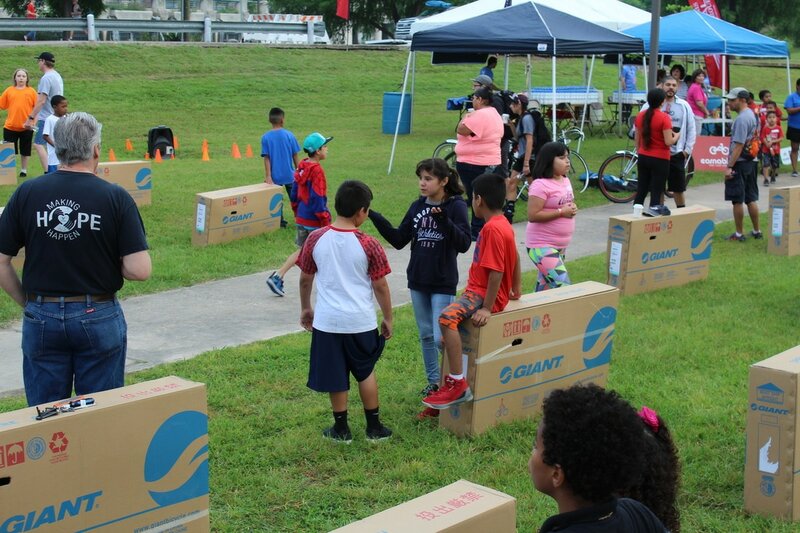 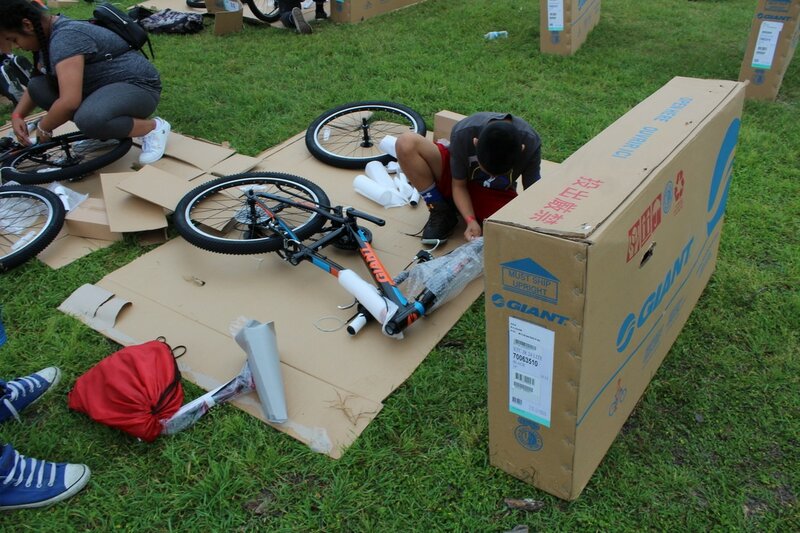 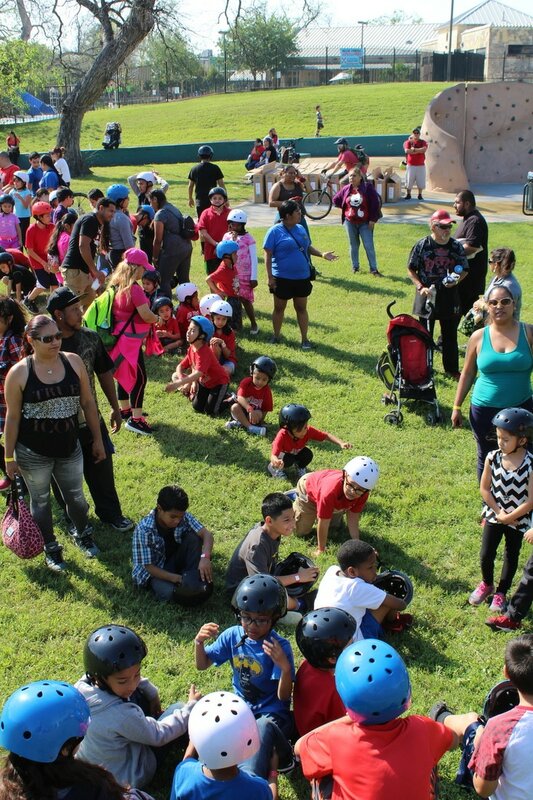 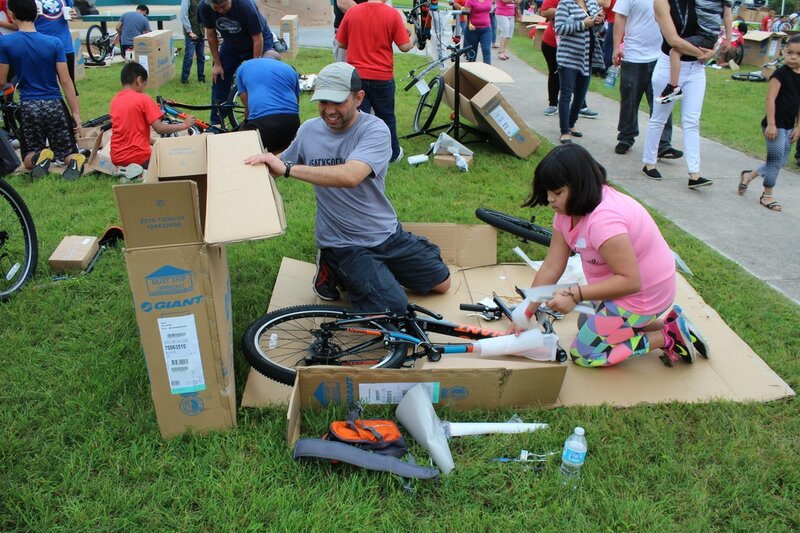 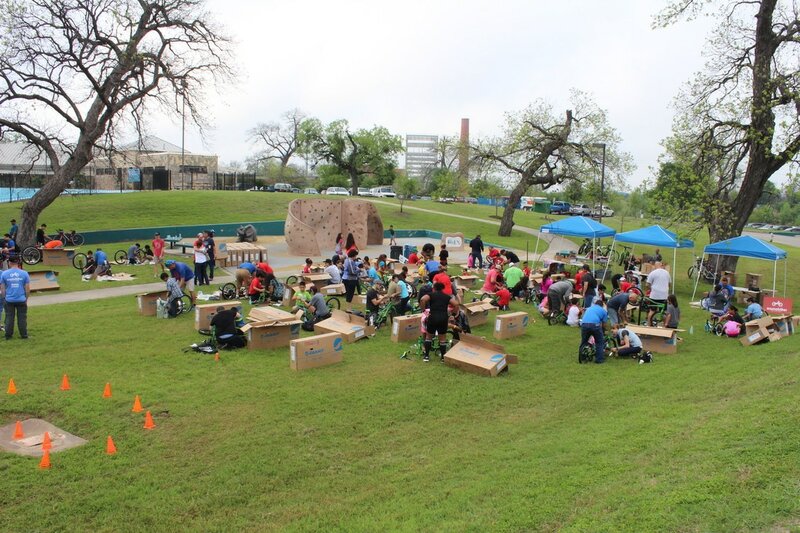 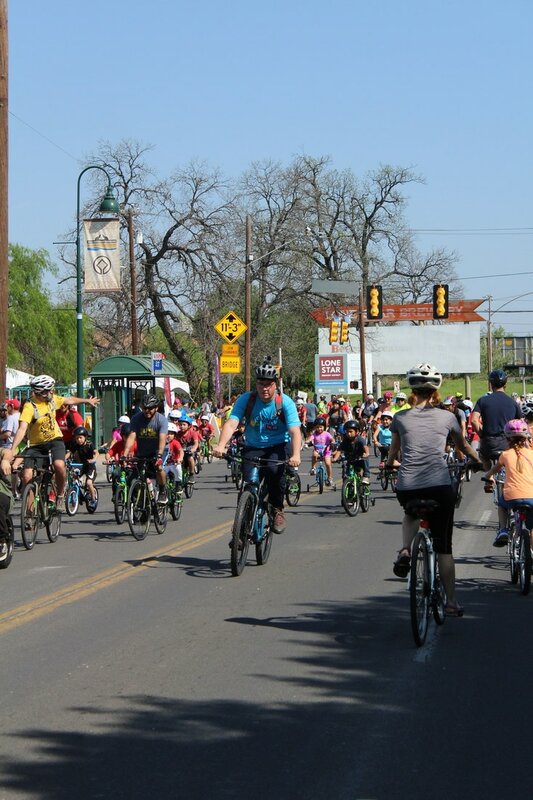 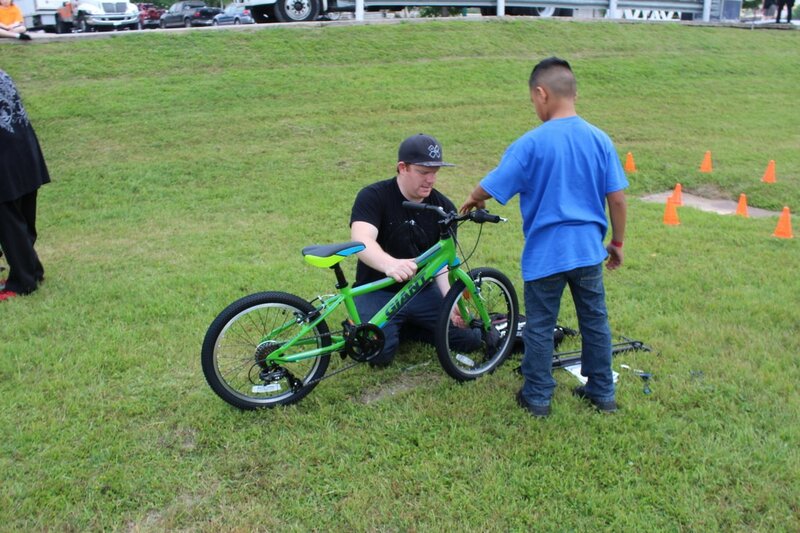 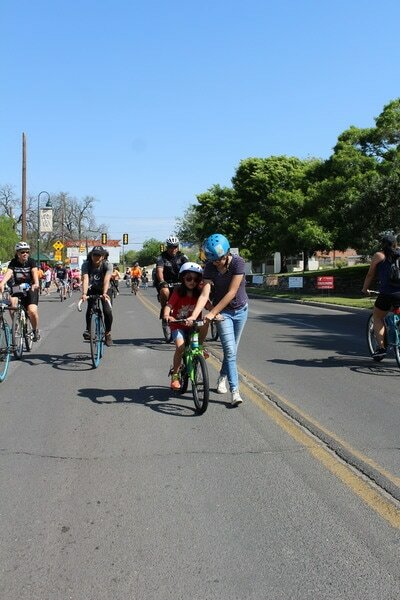 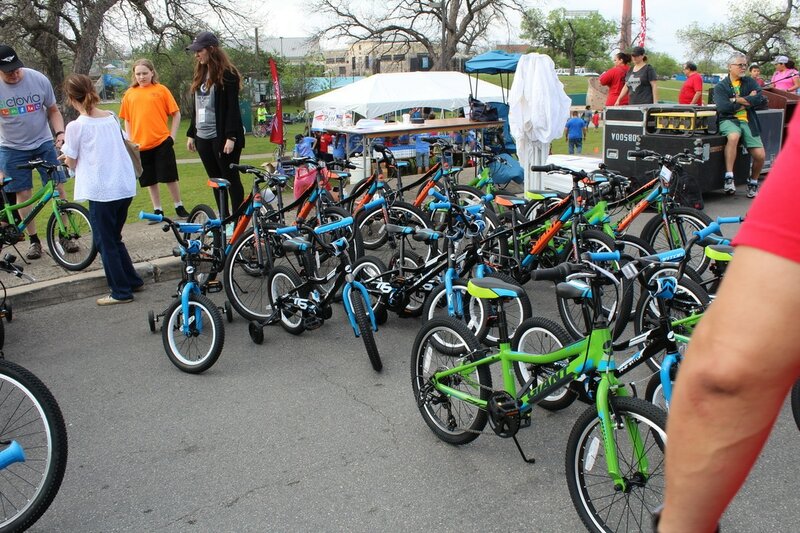 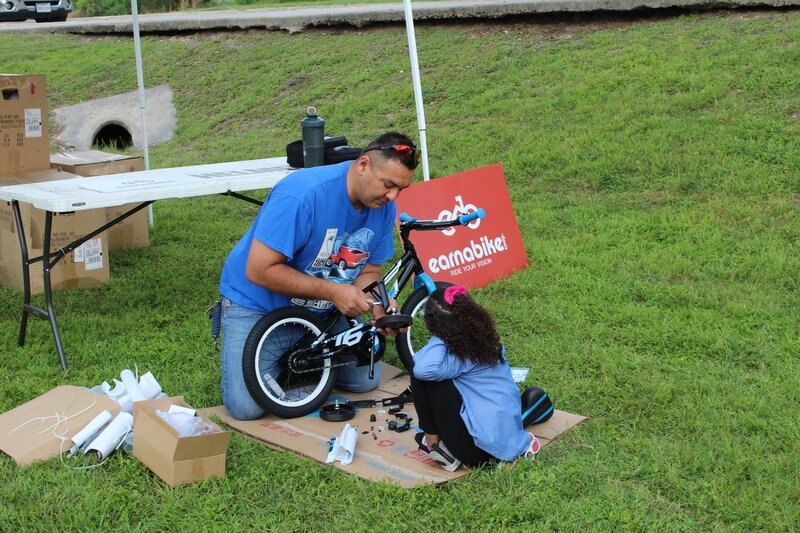 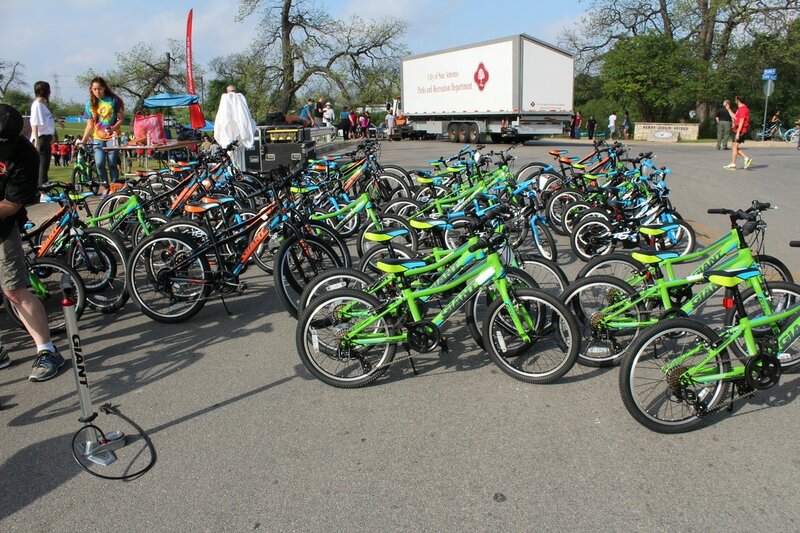 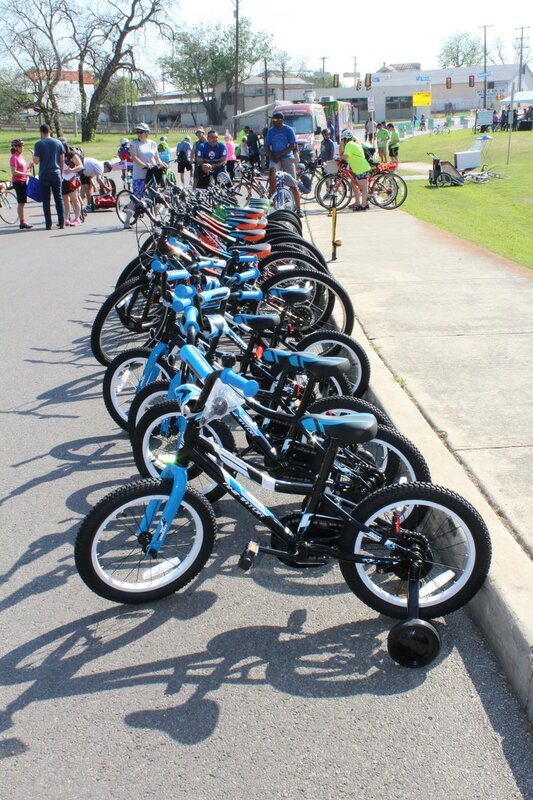 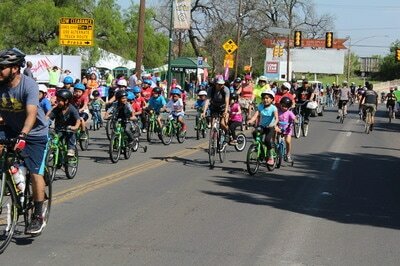 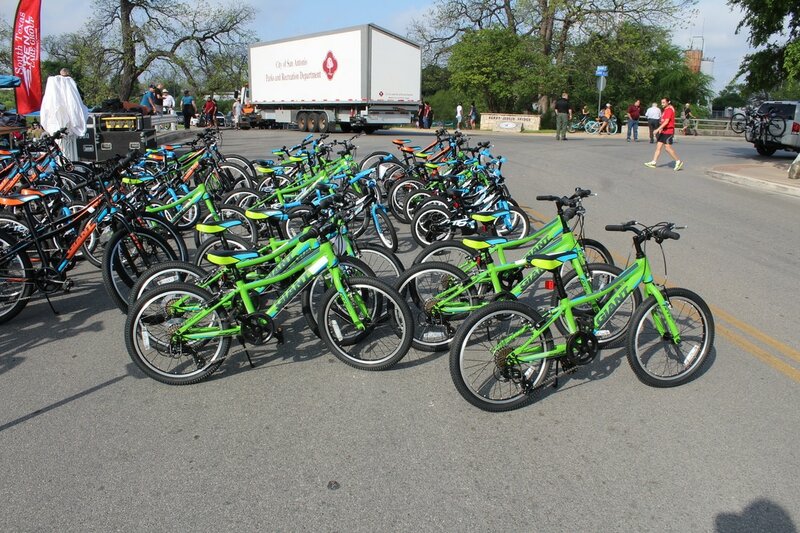 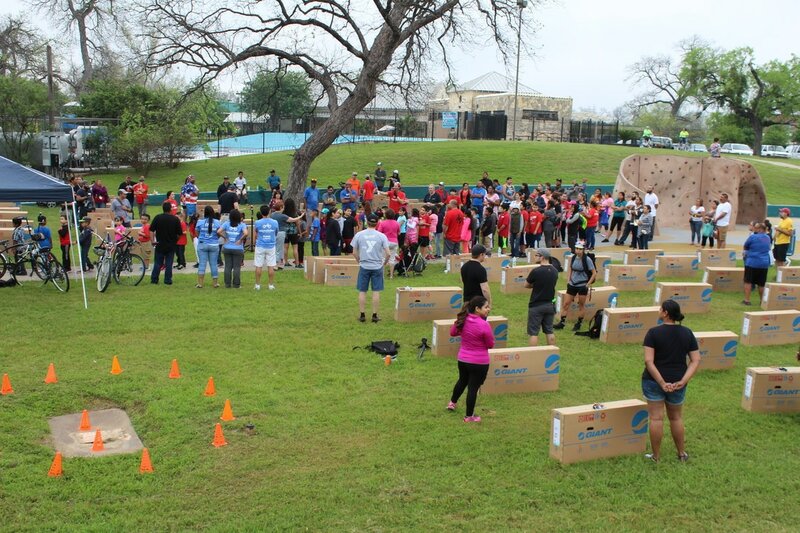 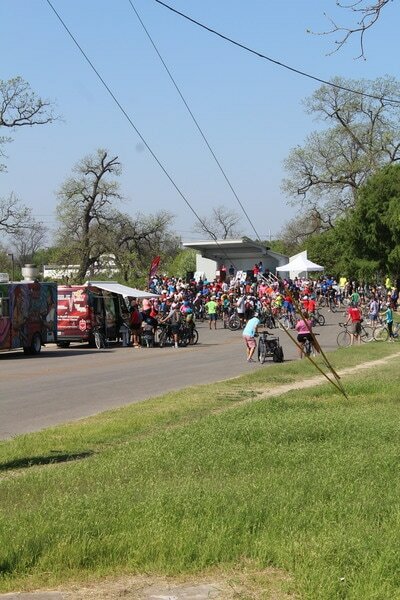 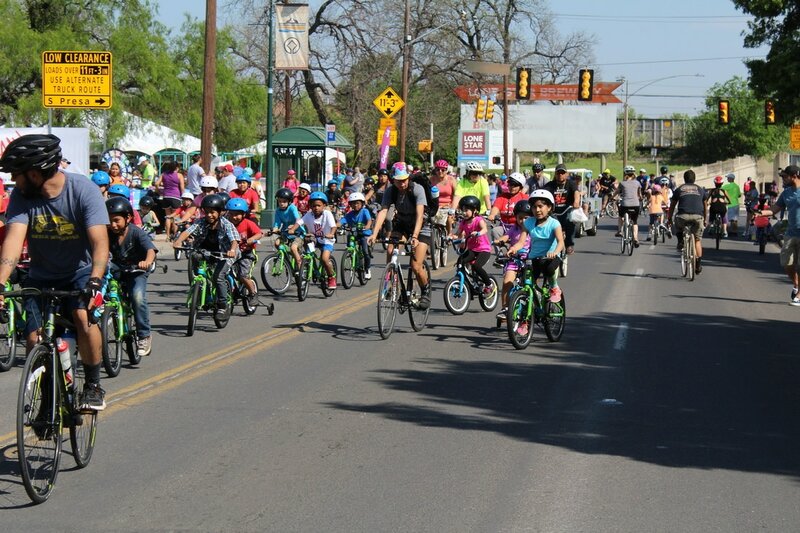 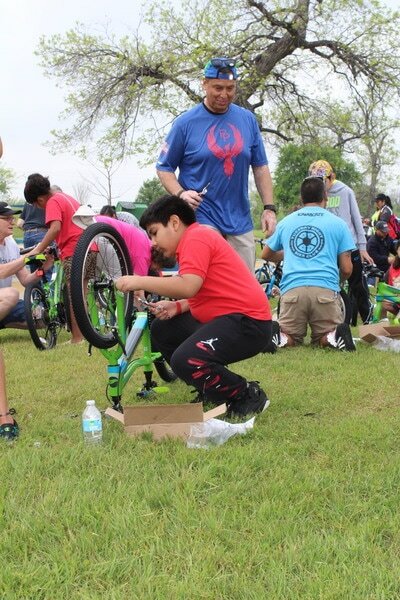 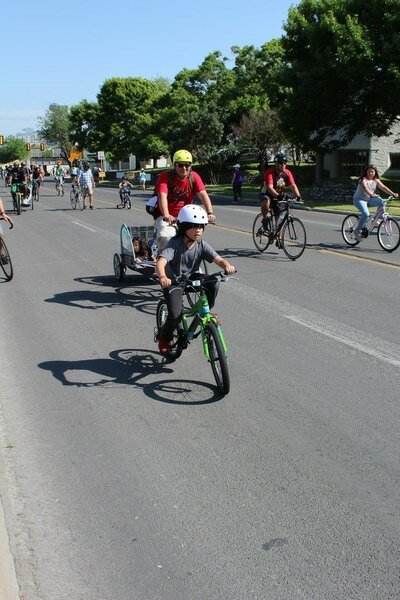 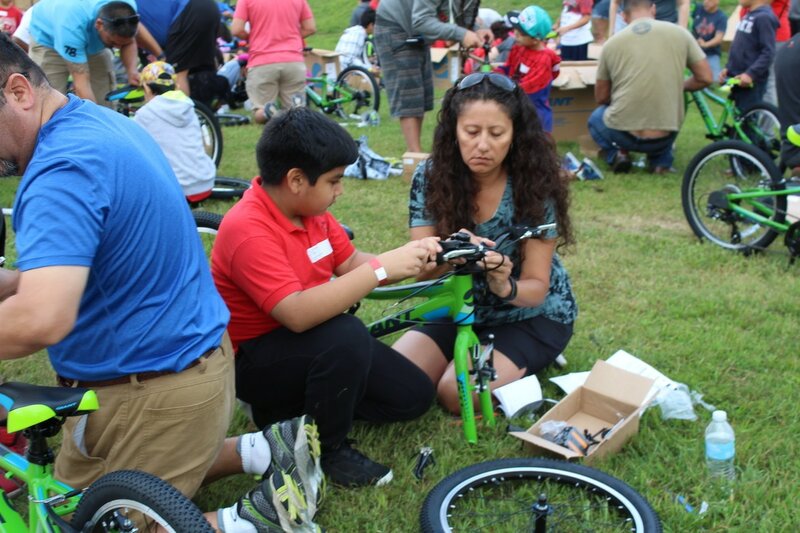 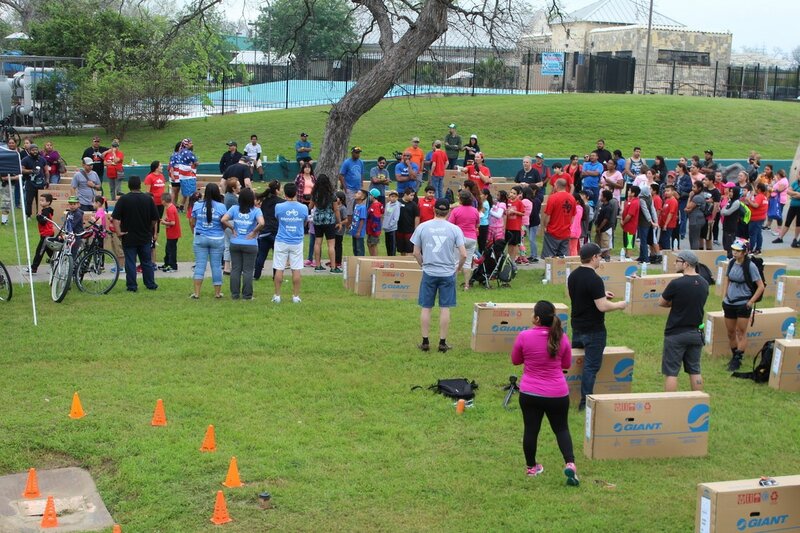 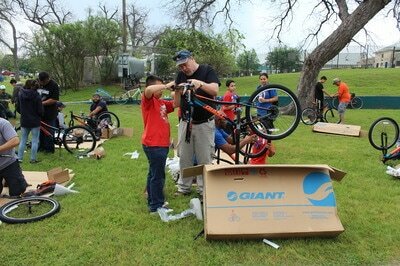 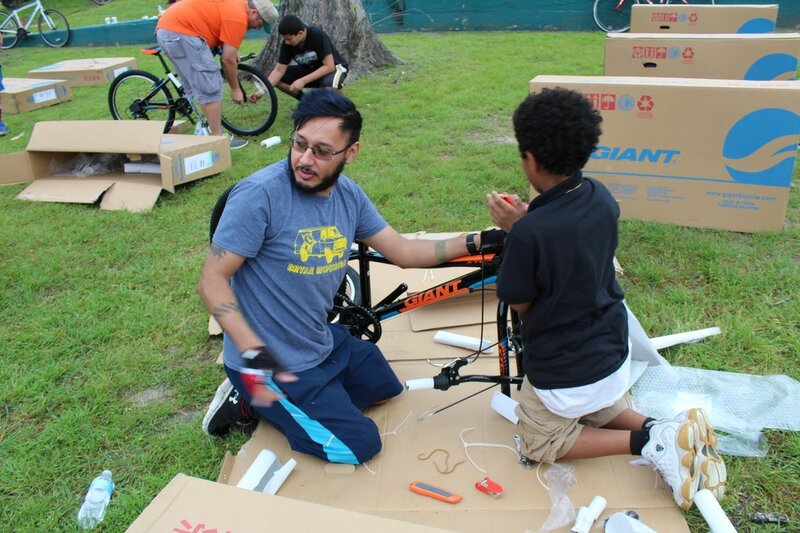 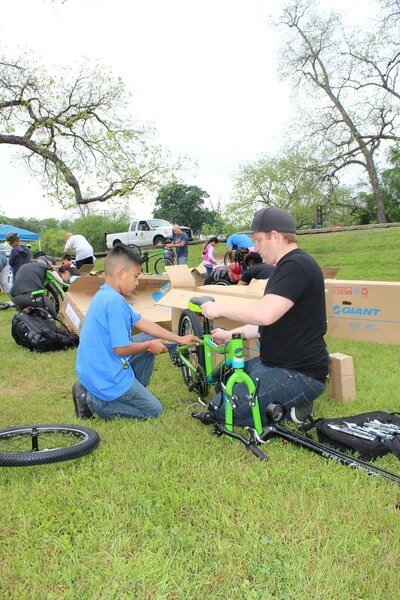 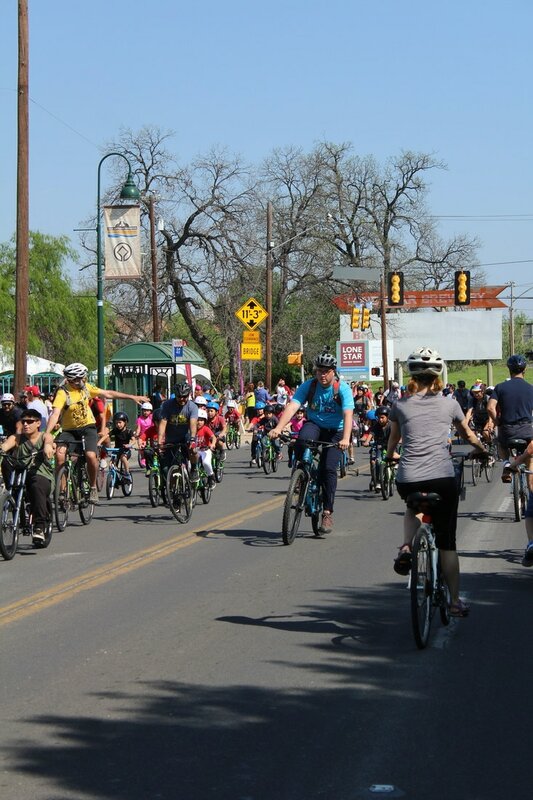 Children that successfully complete the program participate in a six-hour event where they assemble a new GIANT brand bike, learn about safe cycling, and how to support each other when riding as a group. 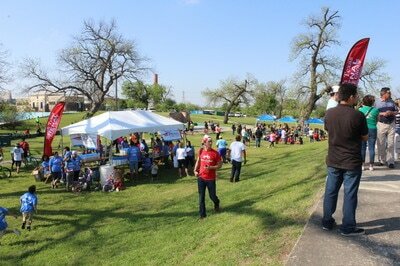 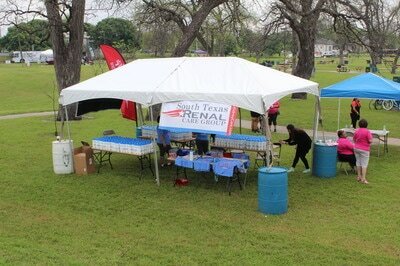 At the event we will bring together several EAB @ School programs. 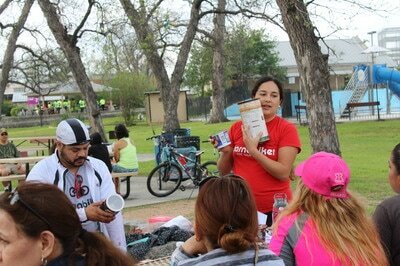 Every child is required to bring a responsible adult, who is then required to attend a nutrition seminar and a community integration workshop with the teachers at the event. The event acts as a celebration of the students commitment, and dedication, to improving themselves and concludes in a two-hour group ride. 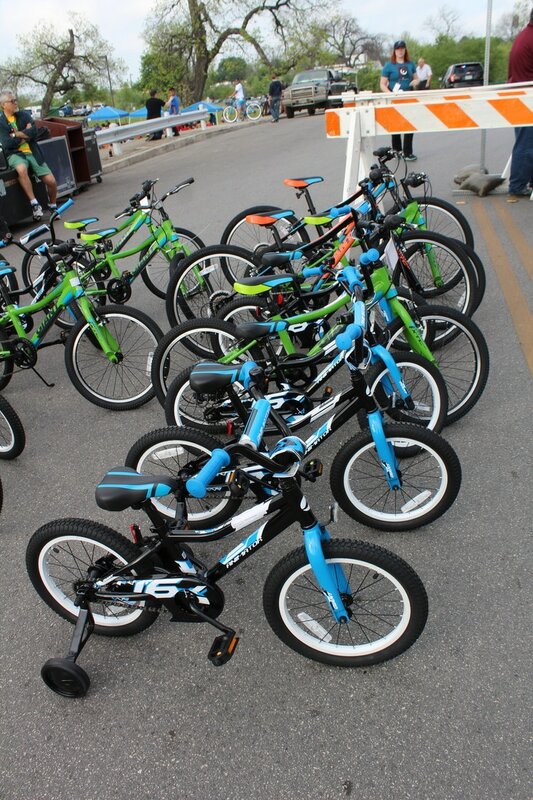 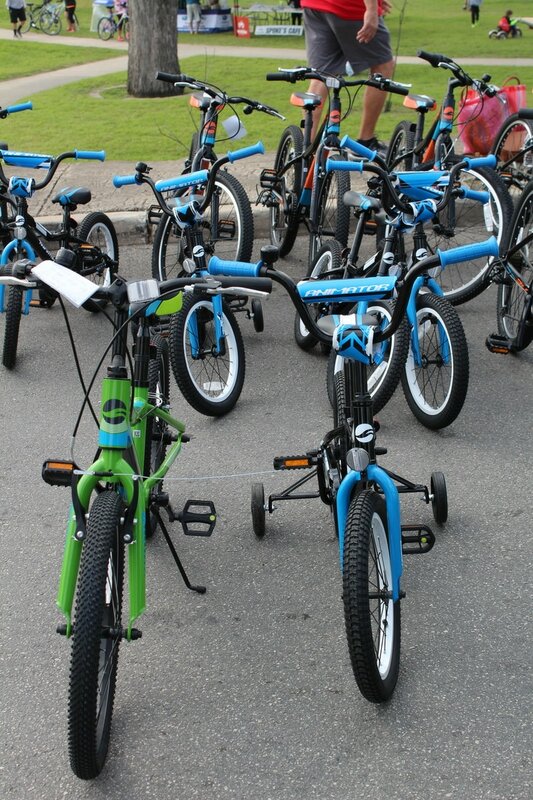 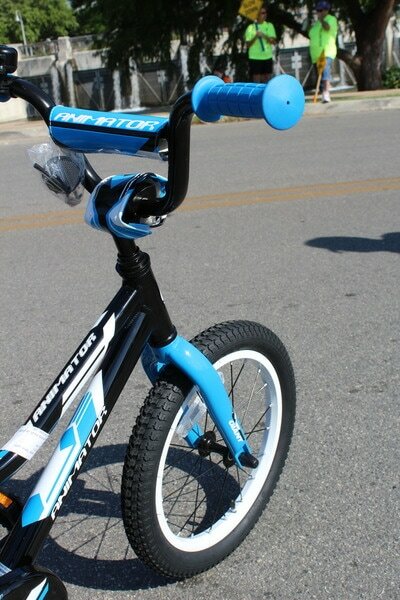 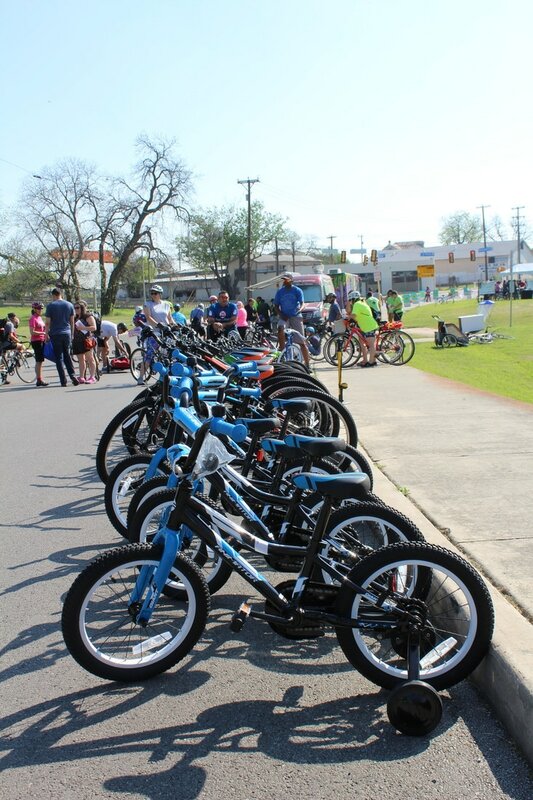 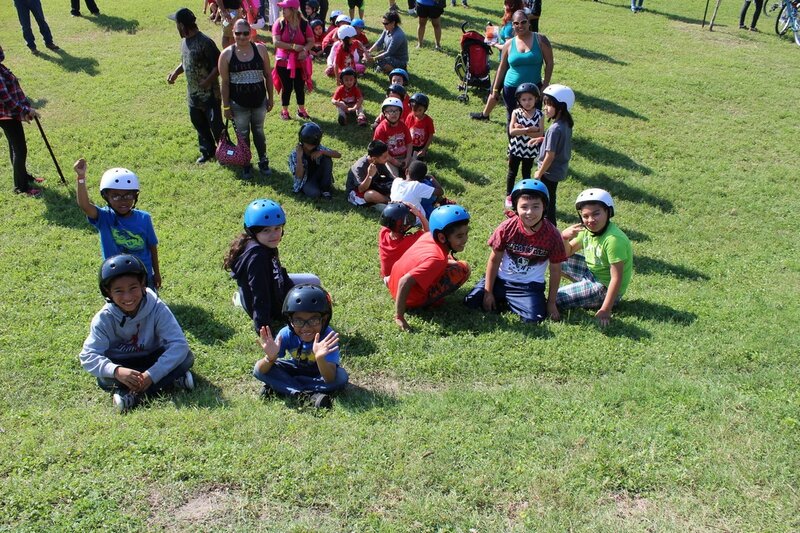 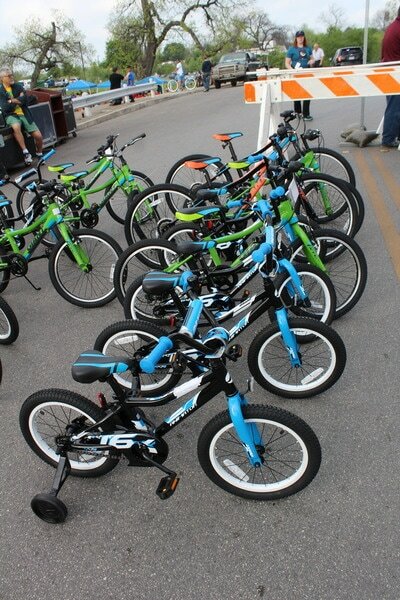 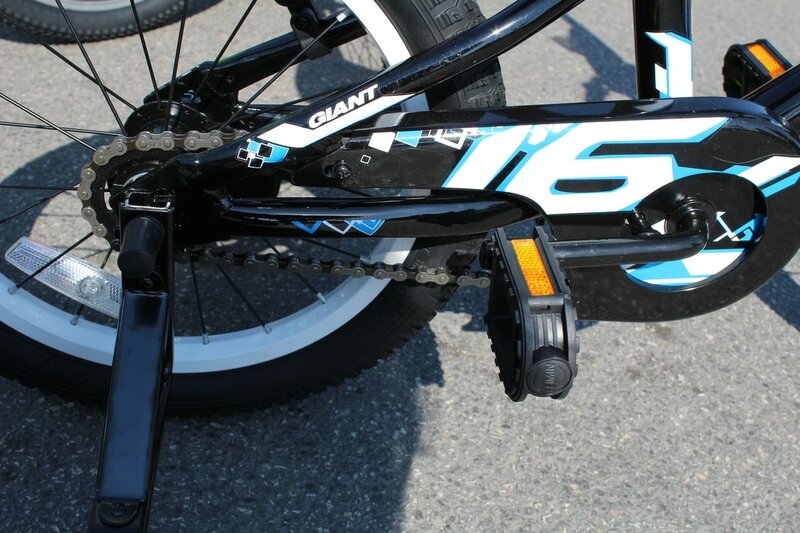 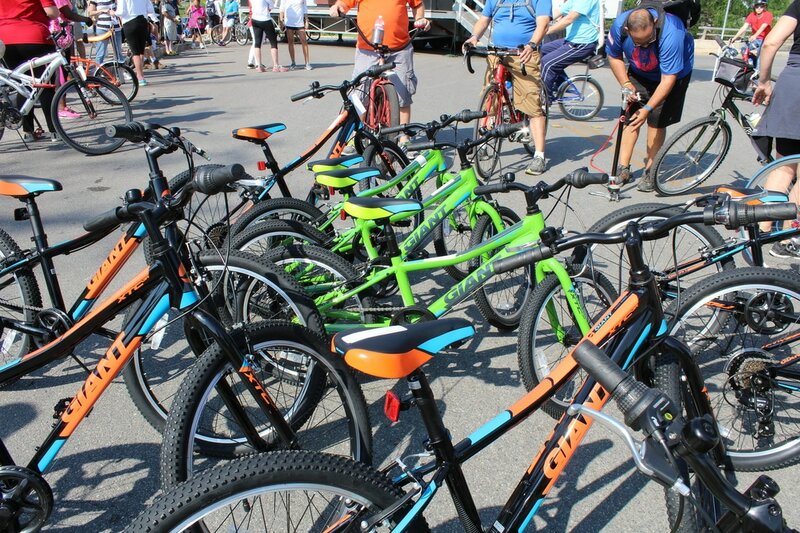 The program creates an opportunity for the child to Earn A Bike through the pursuit of perfect attendance and zero conduct marks and completing a series of simple assignments. 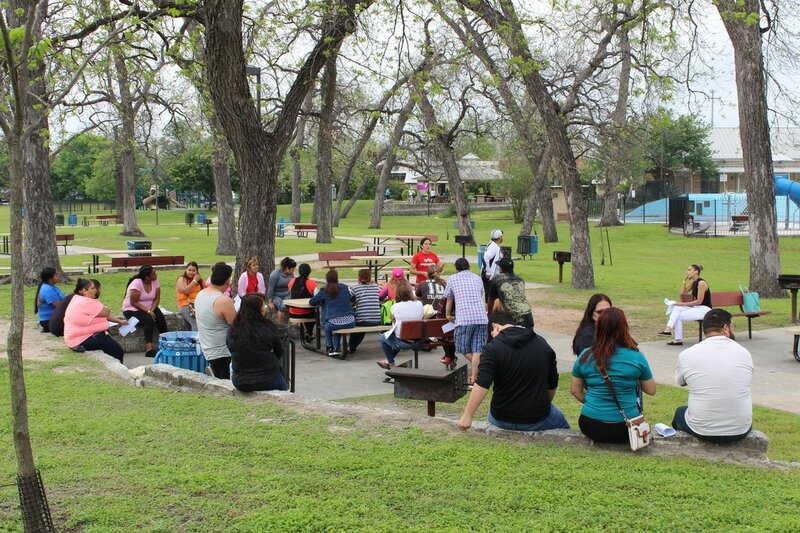 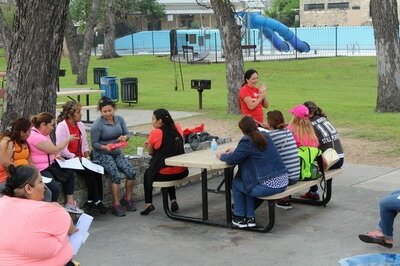 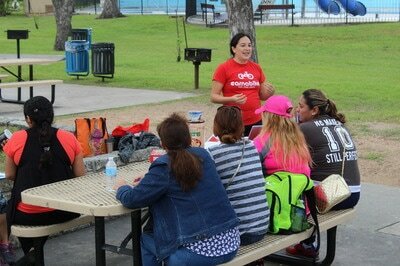 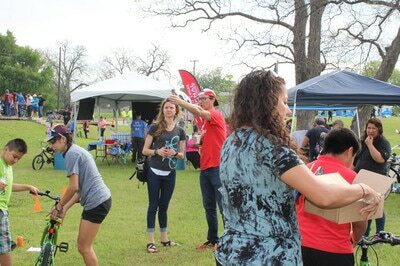 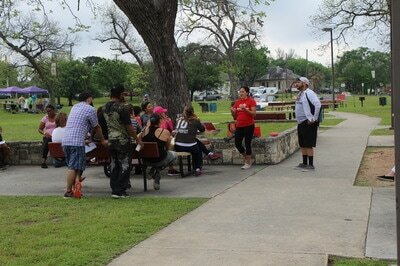 The program is coordinated in conjunction with the school, usually a parent or community liaison. 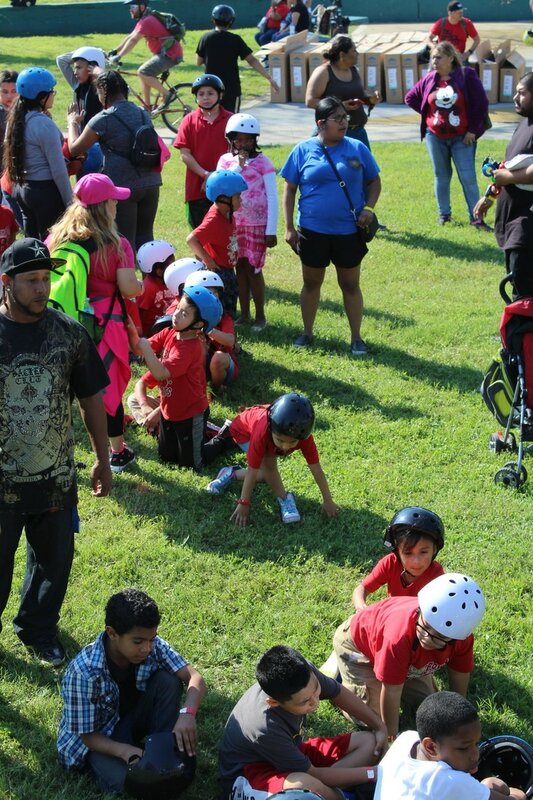 EAB @ School: At the beginning of the school year, children register to be part of the program. 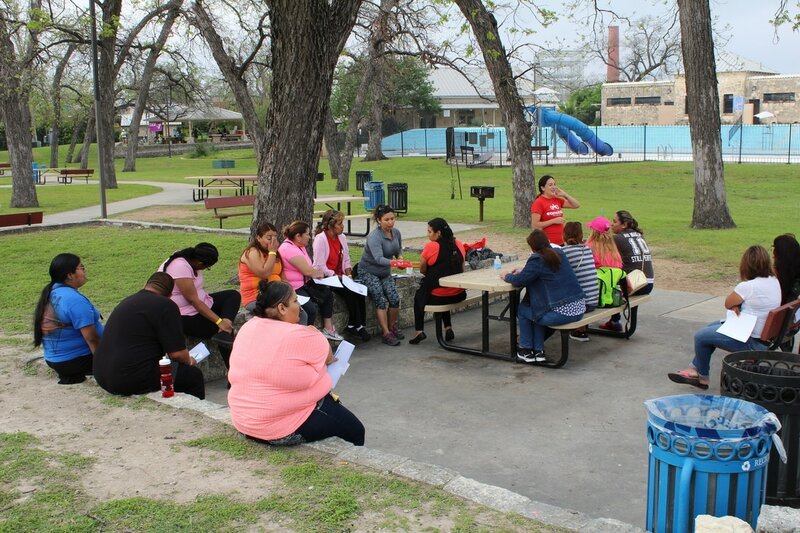 Each month after that children will receive worksheets with health and wellness activities they must complete with their families and turn back in a timely manner. 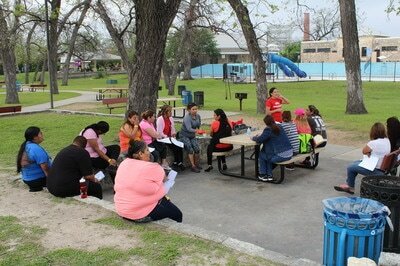 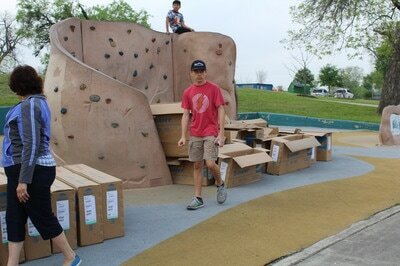 The program will include journal entries, physical activity questionnaire, and the collection of Report Cards. 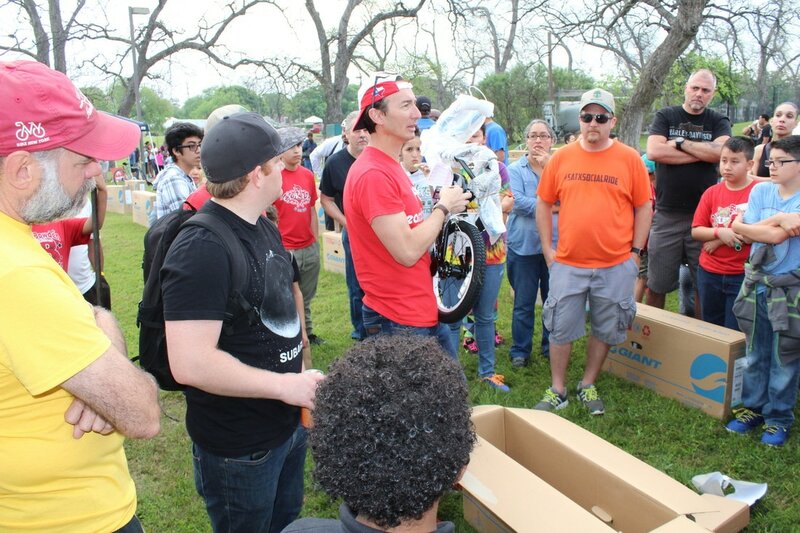 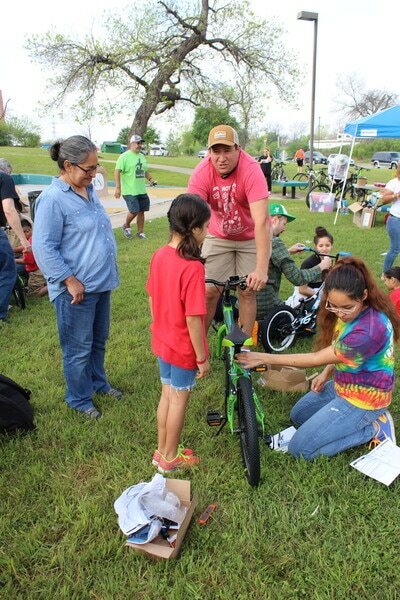 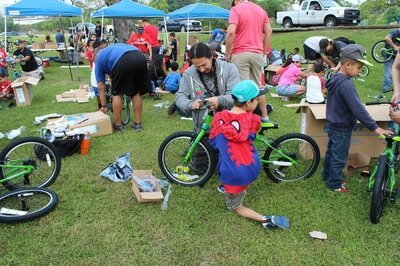 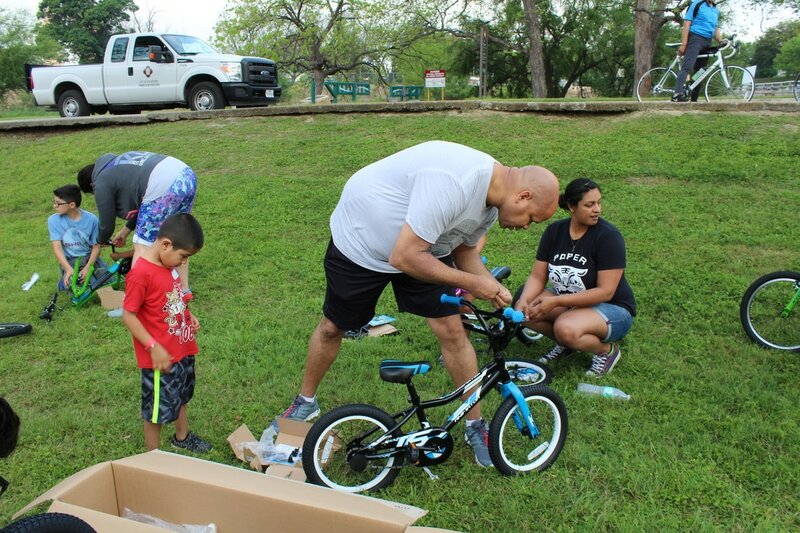 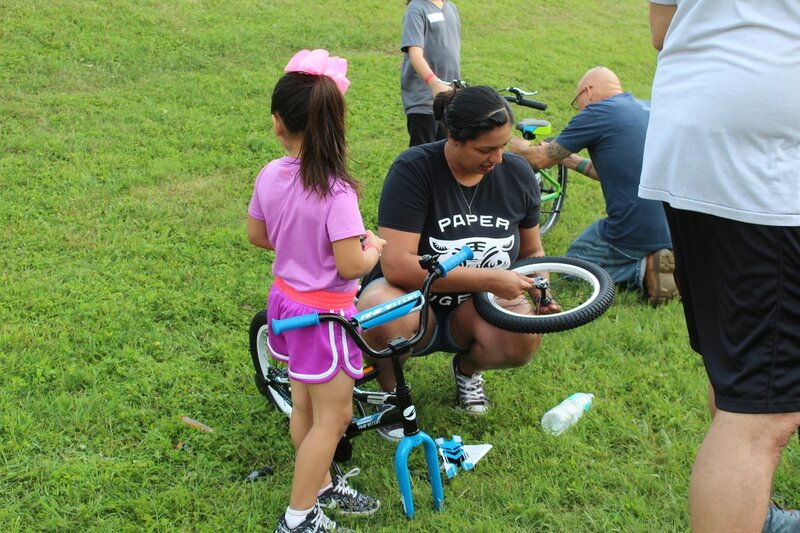 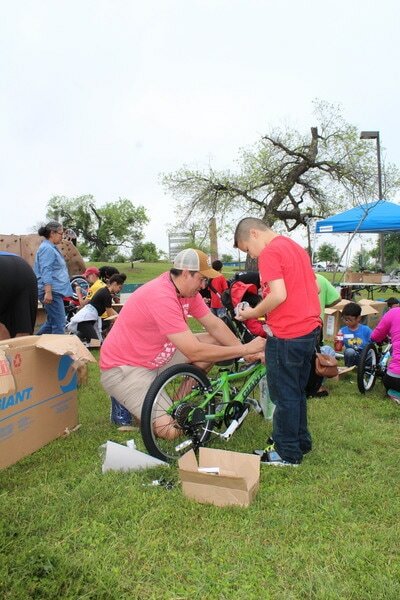 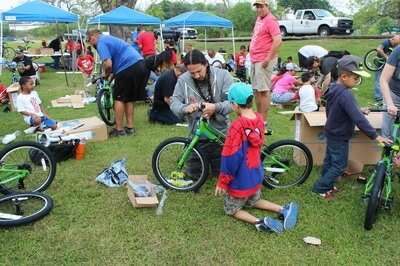 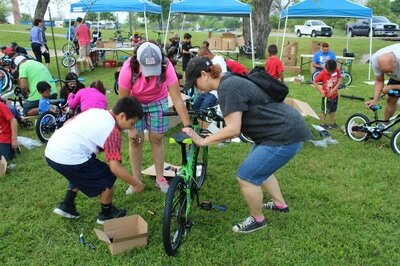 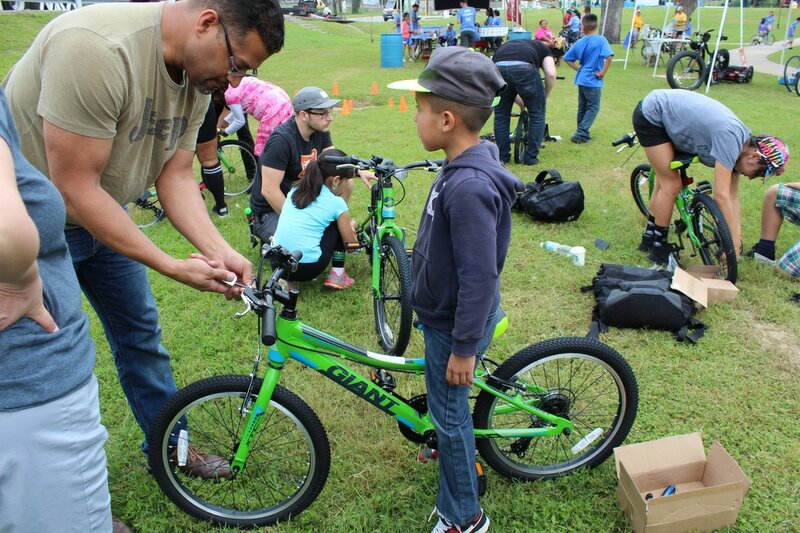 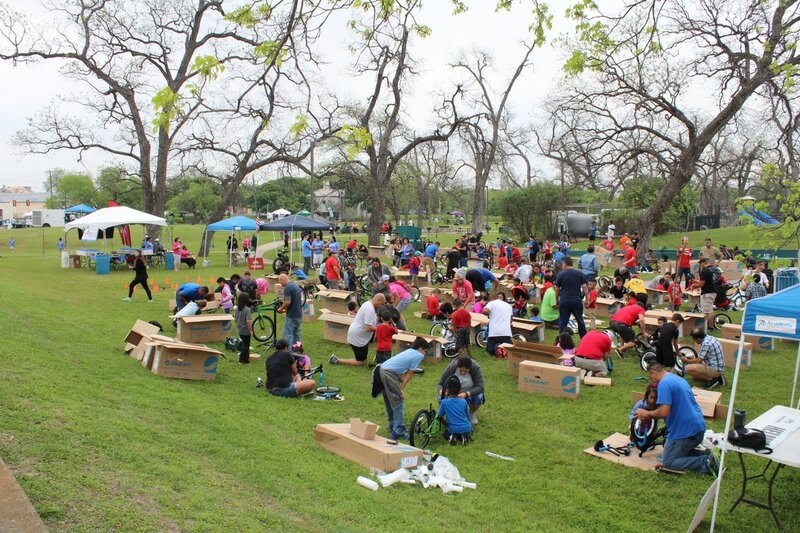 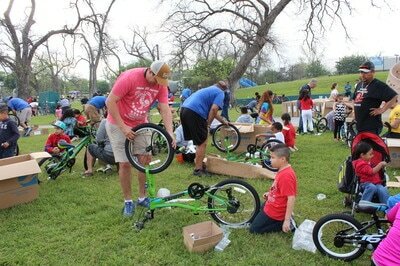 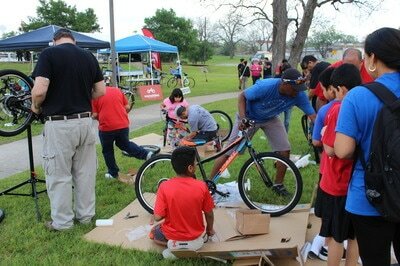 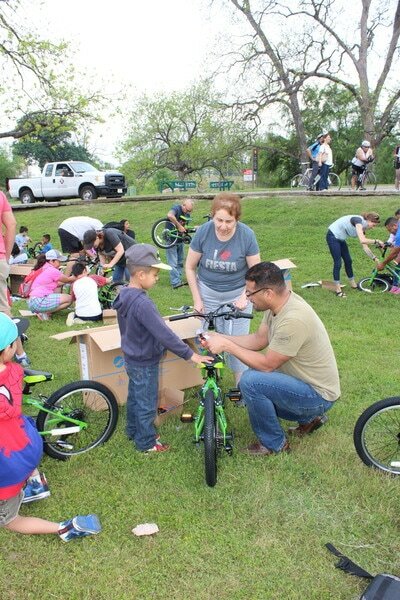 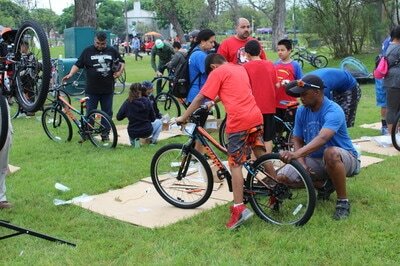 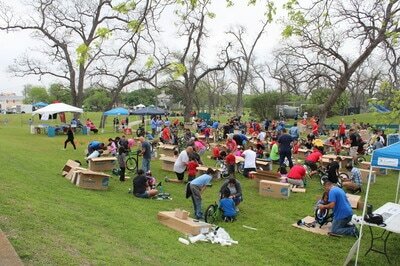 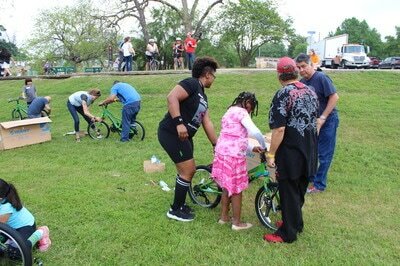 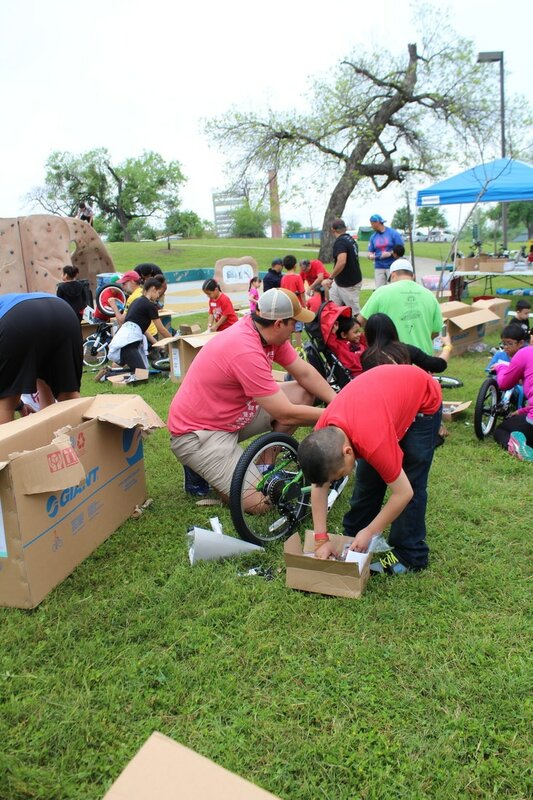 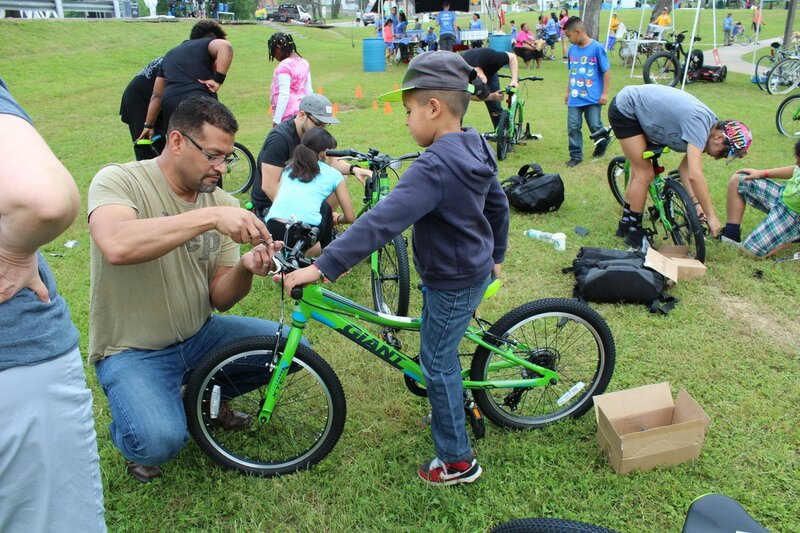 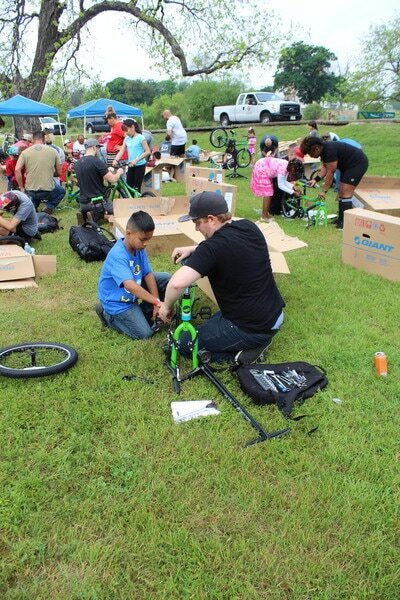 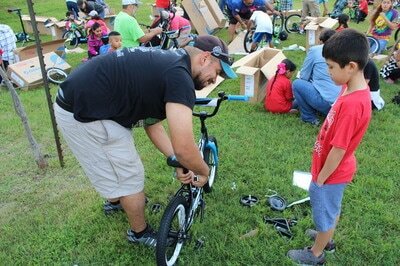 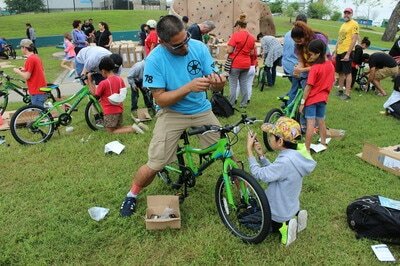 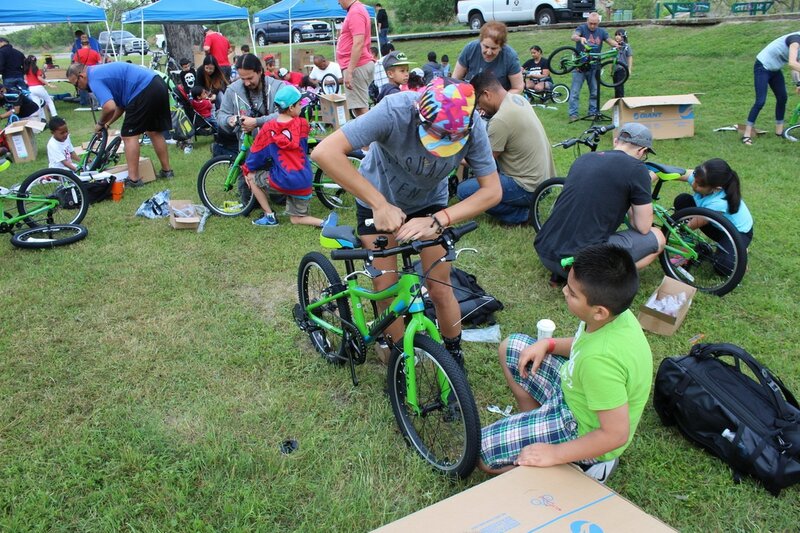 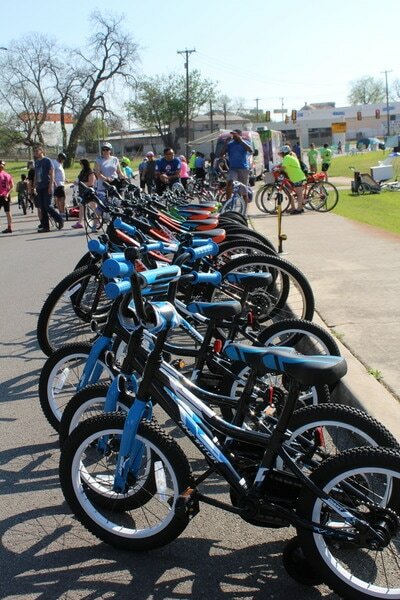 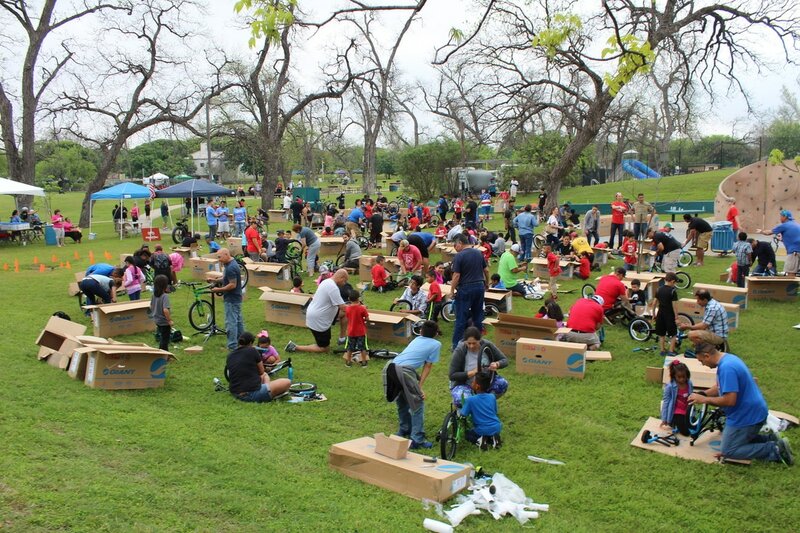 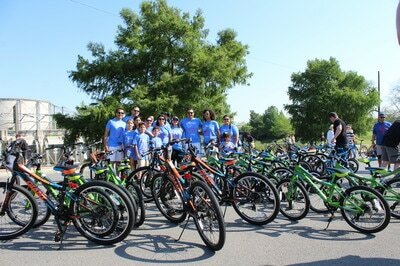 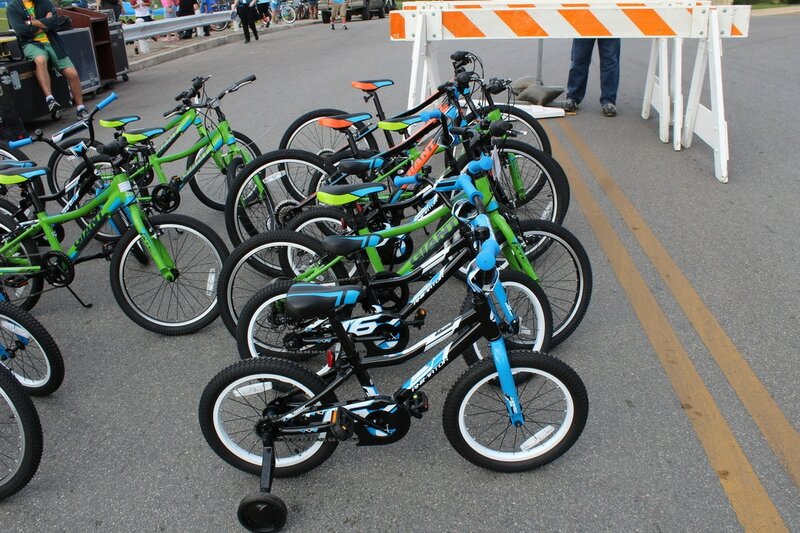 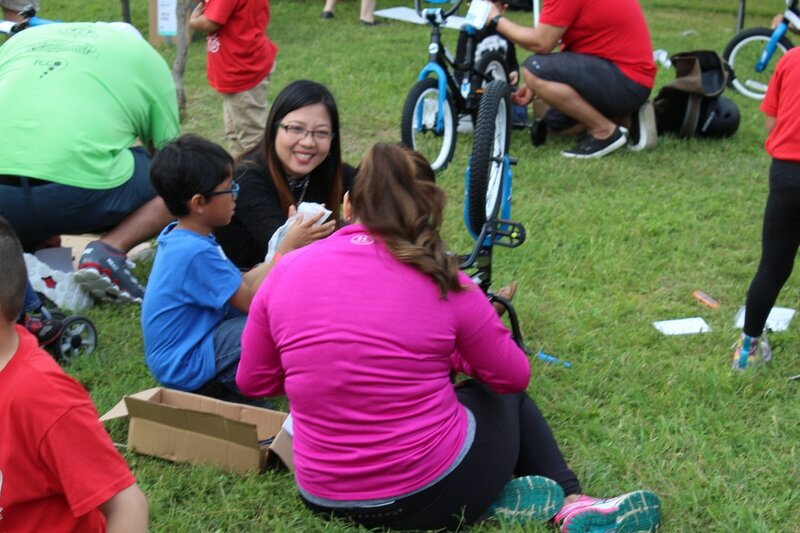 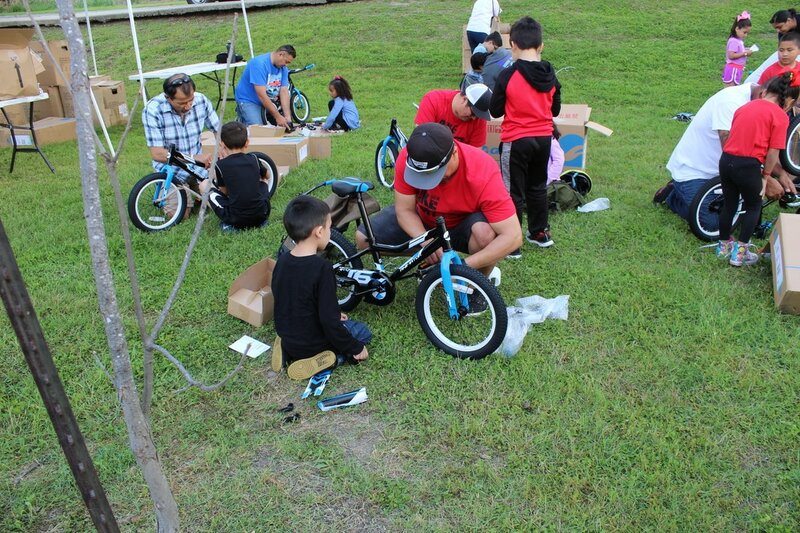 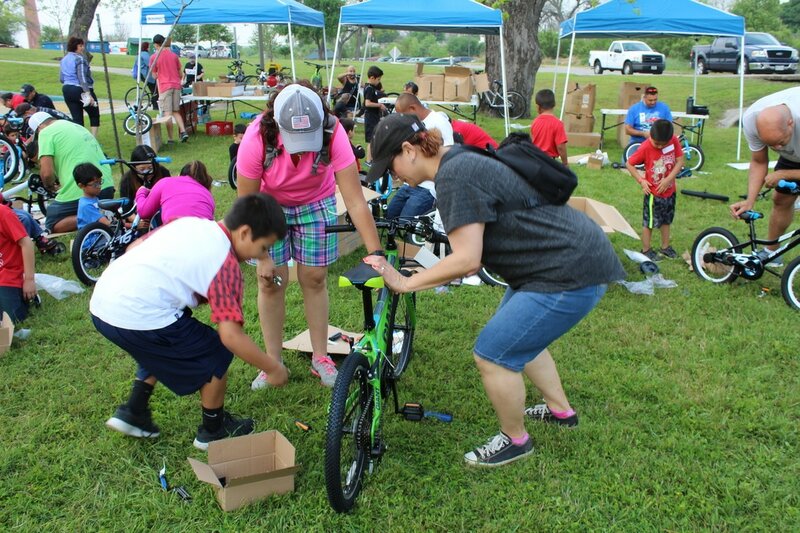 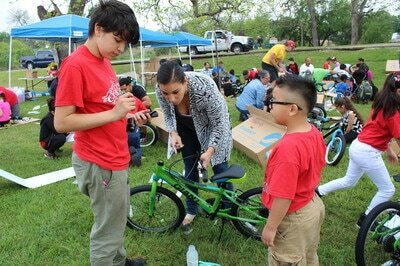 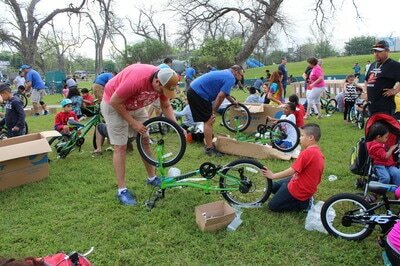 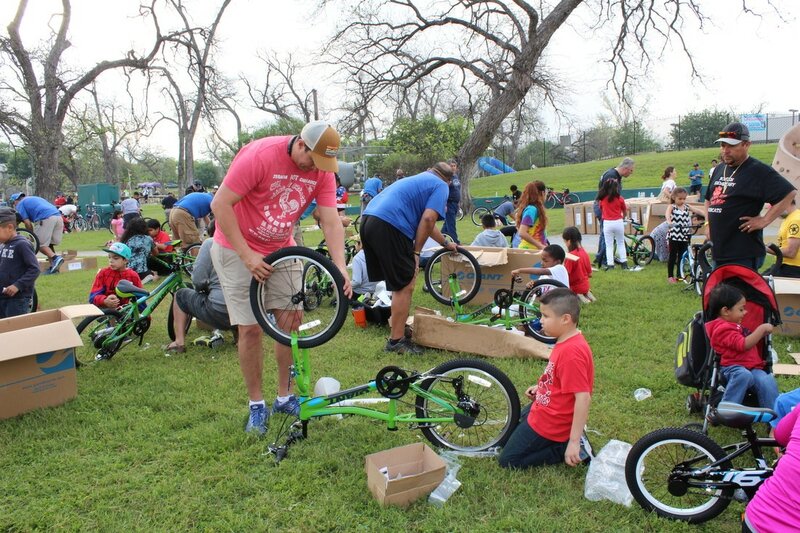 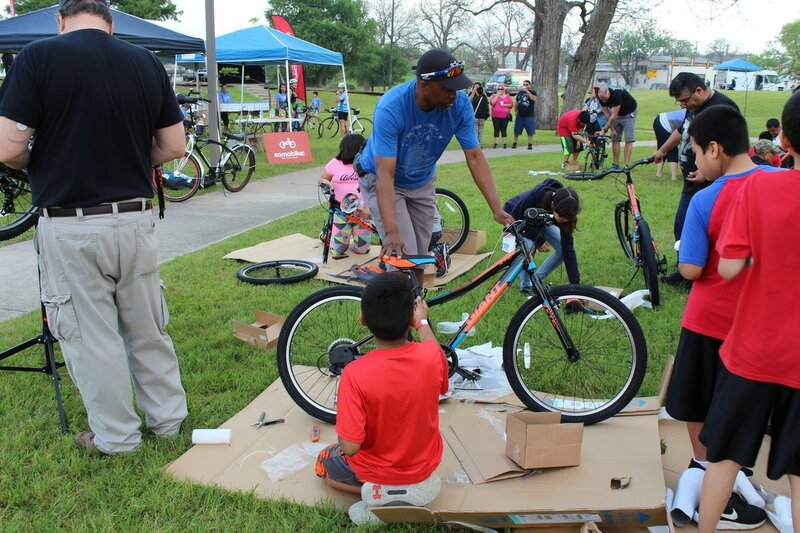 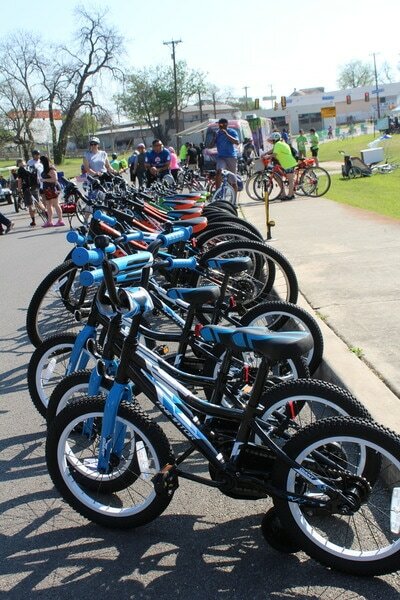 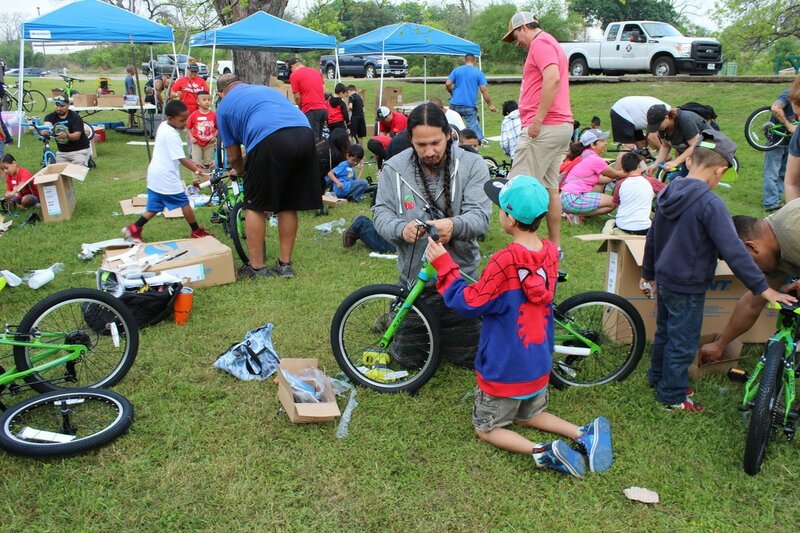 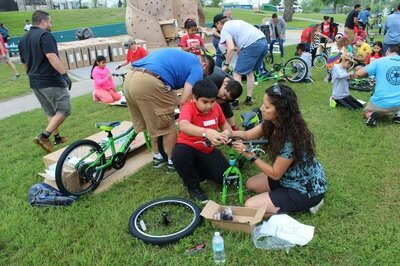 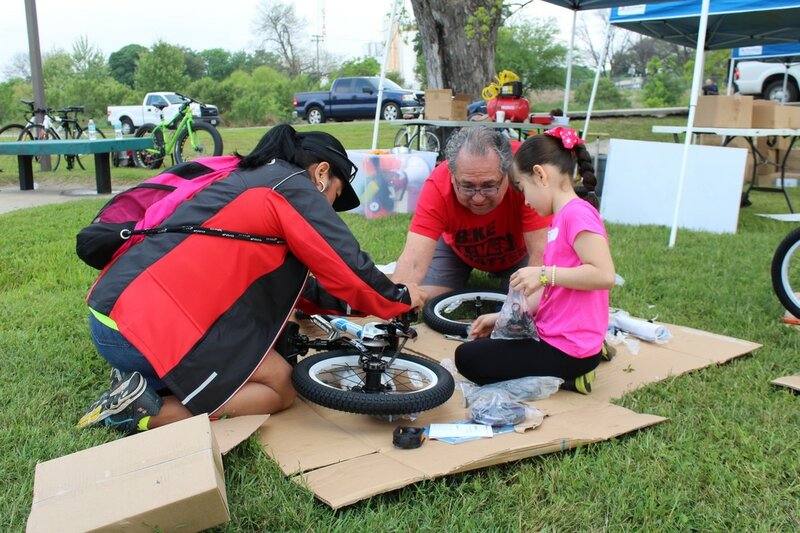 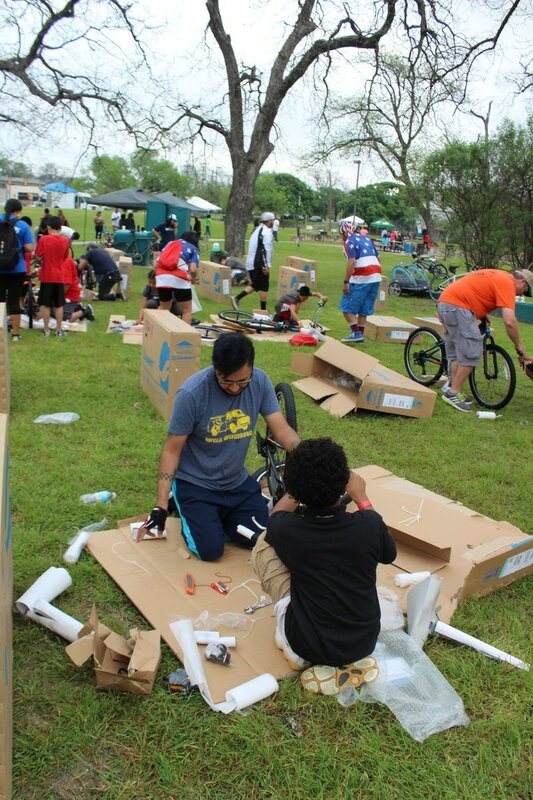 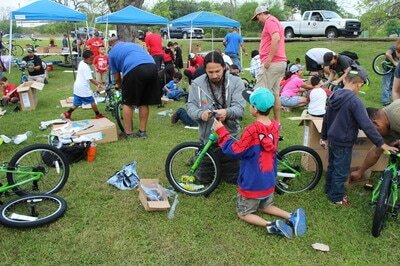 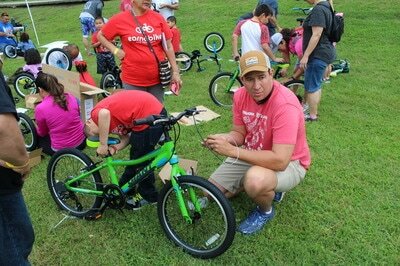 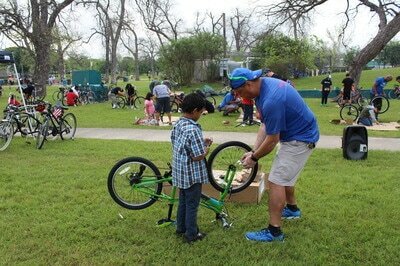 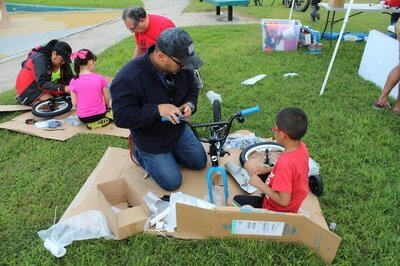 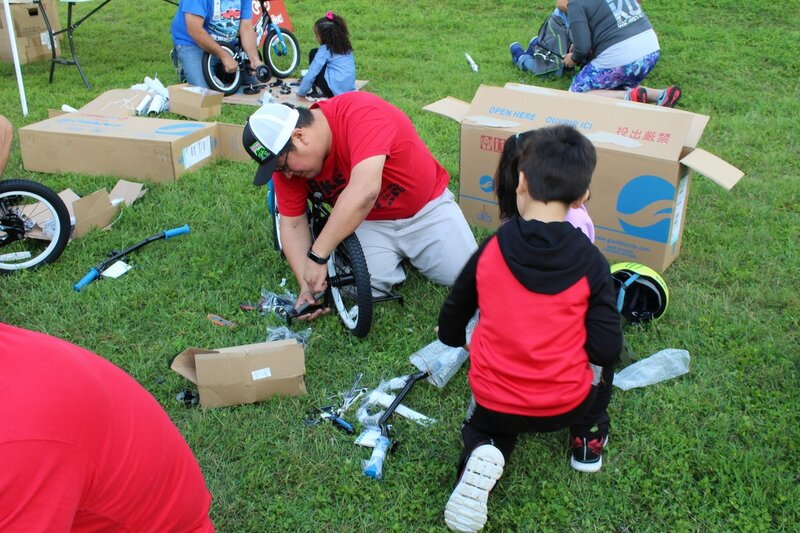 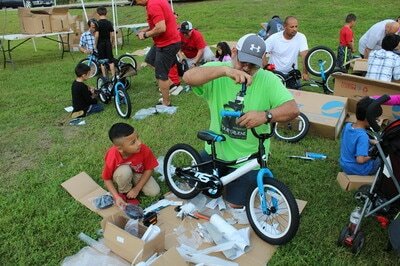 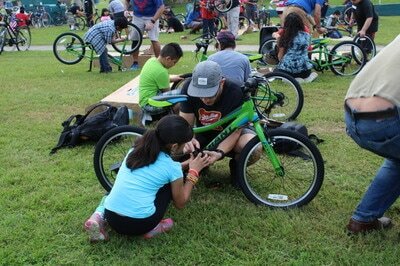 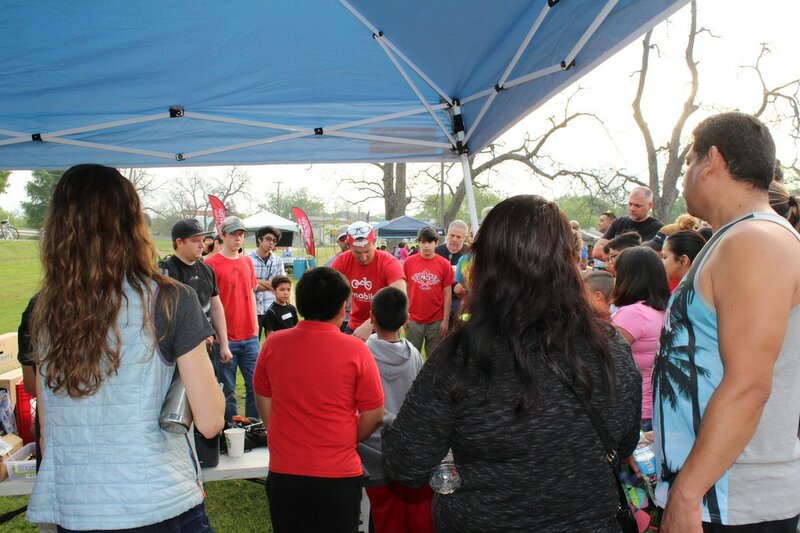 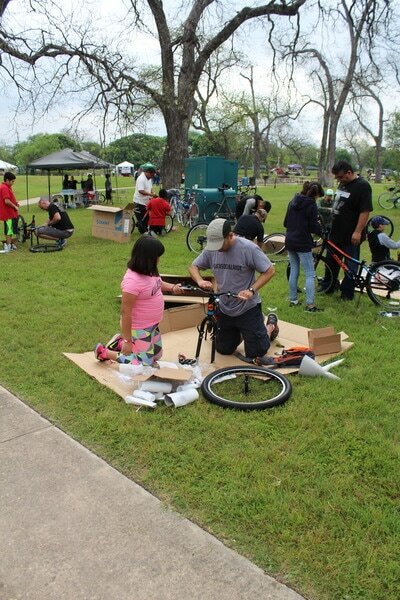 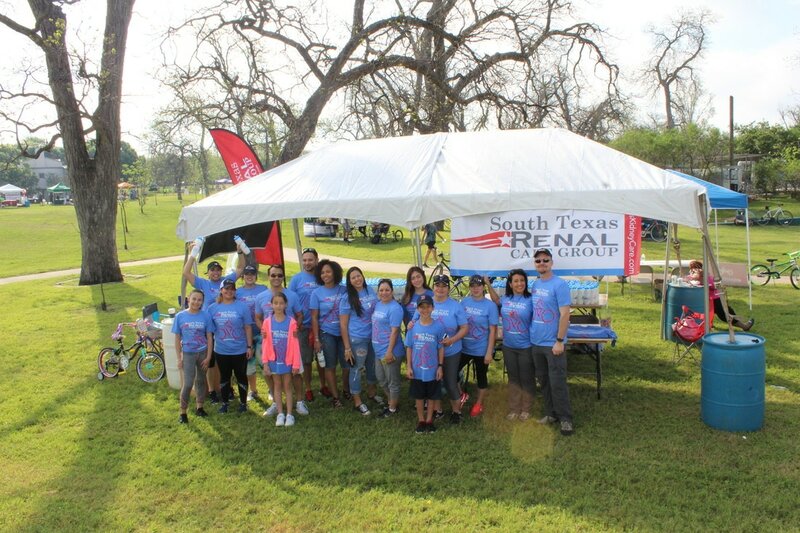 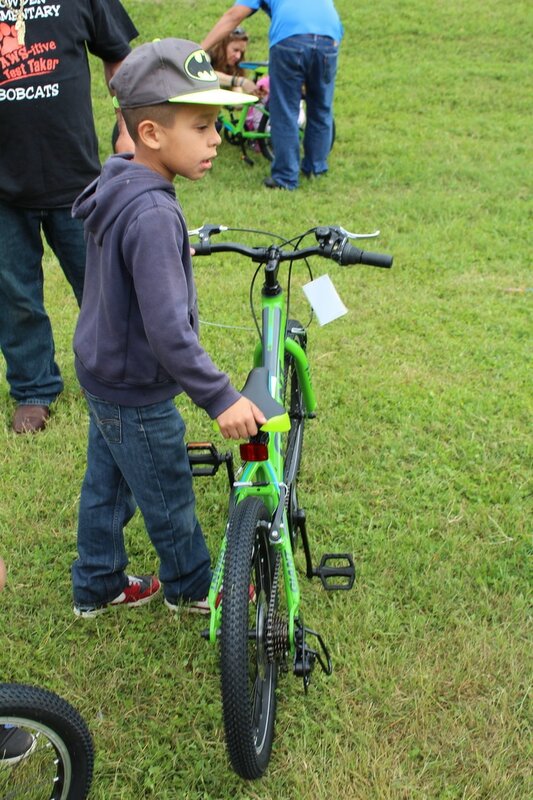 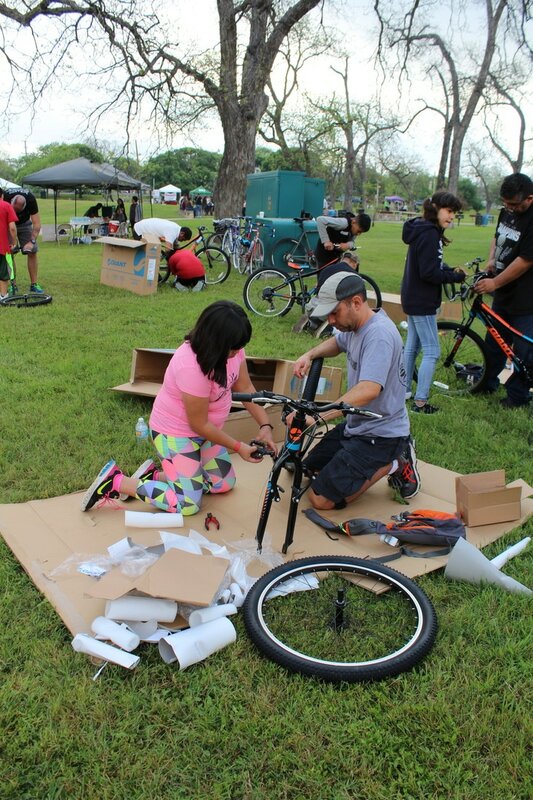 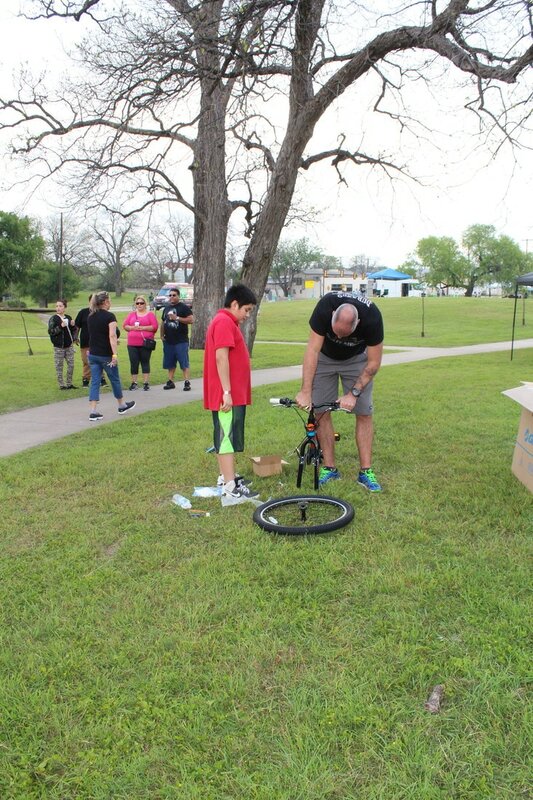 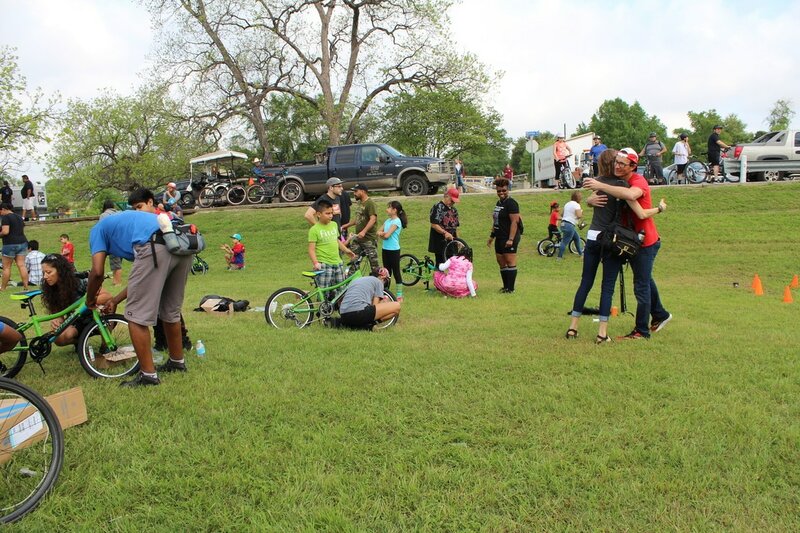 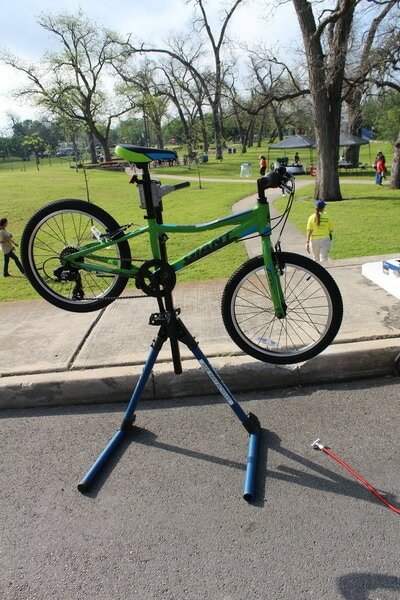 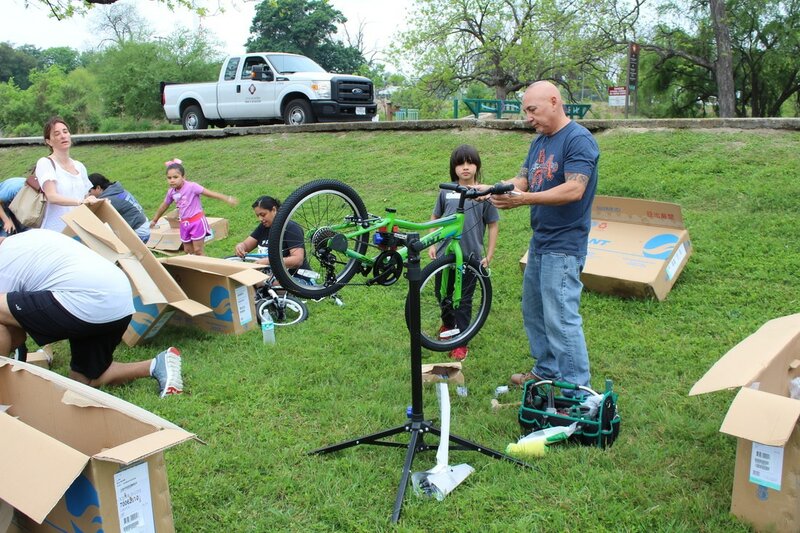 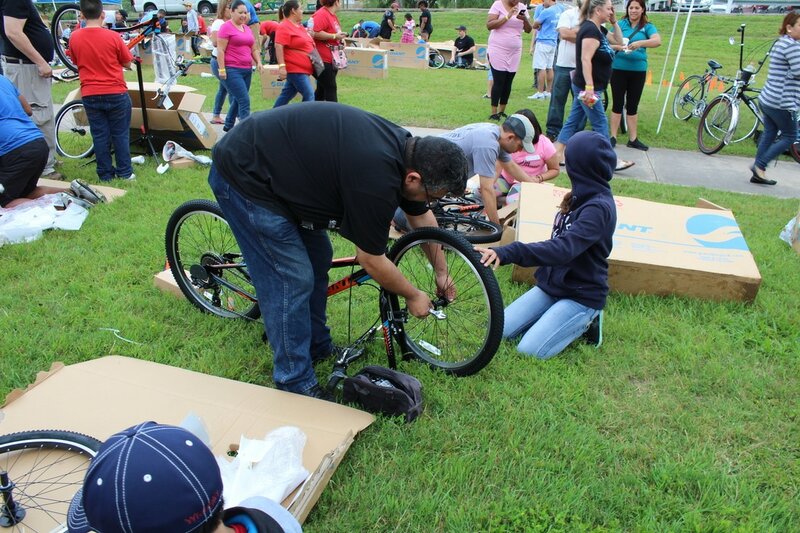 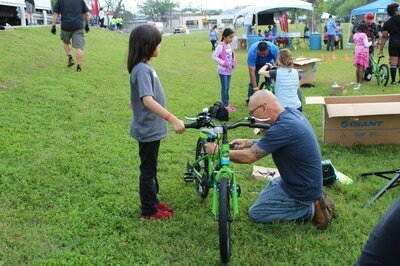 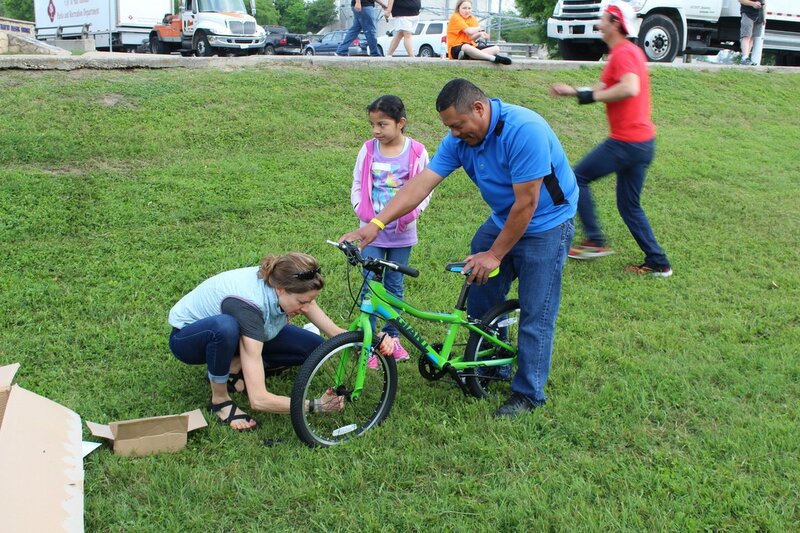 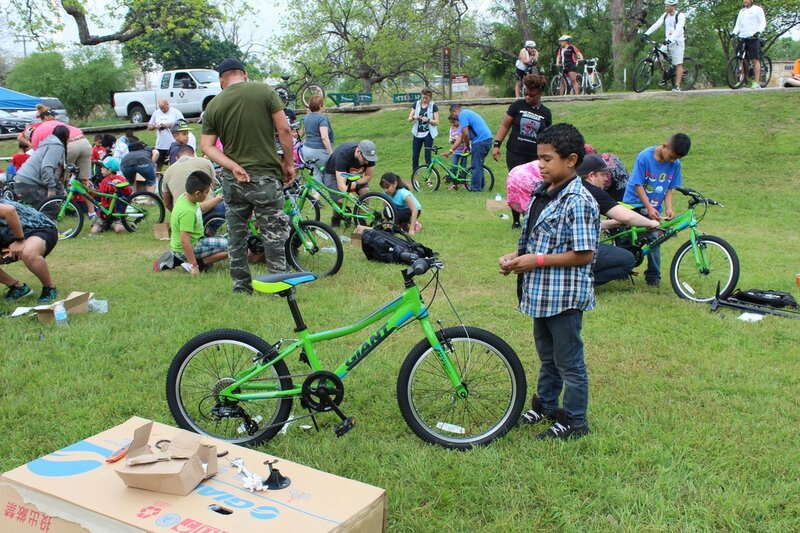 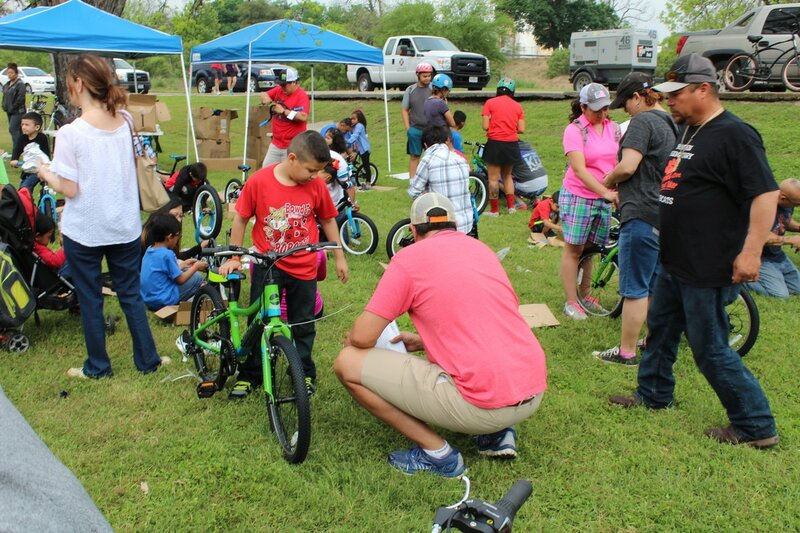 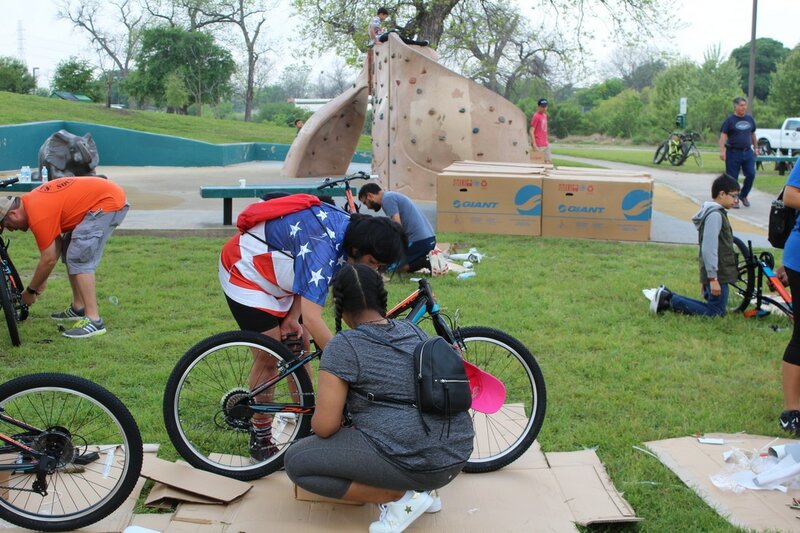 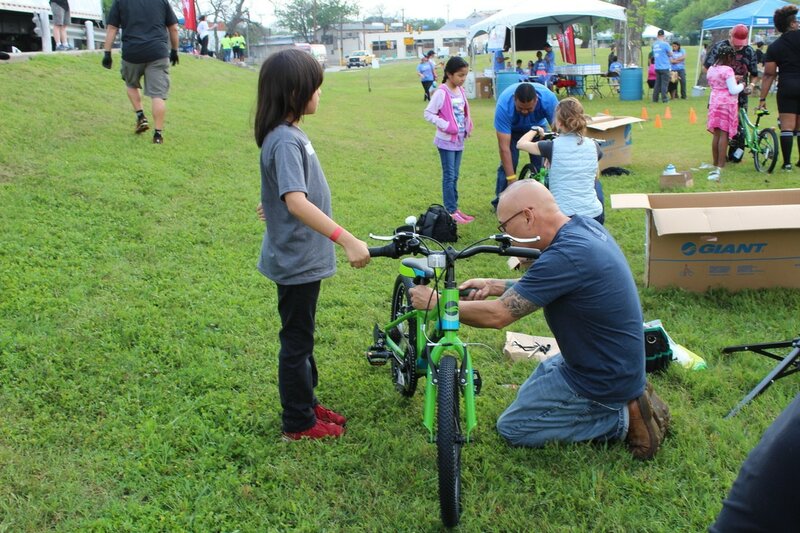 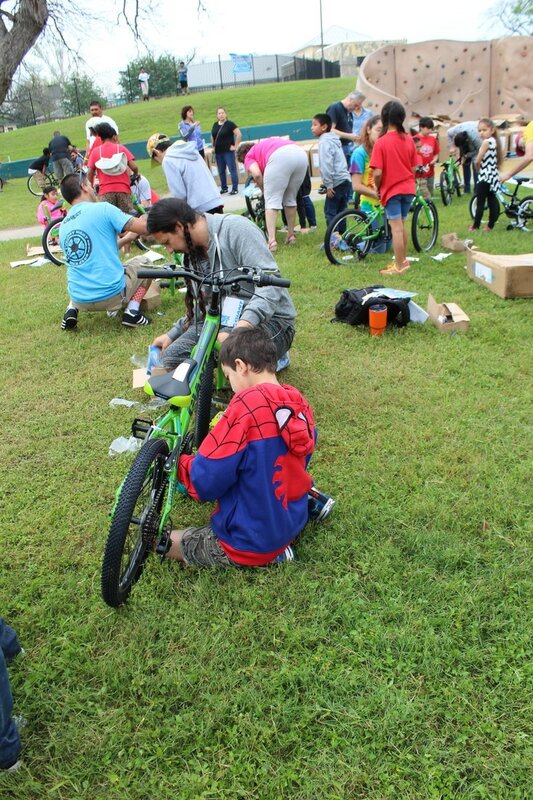 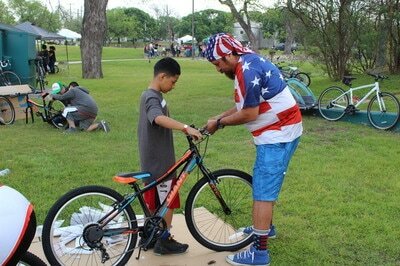 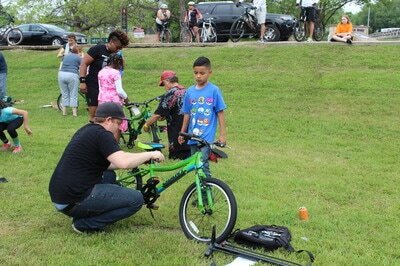 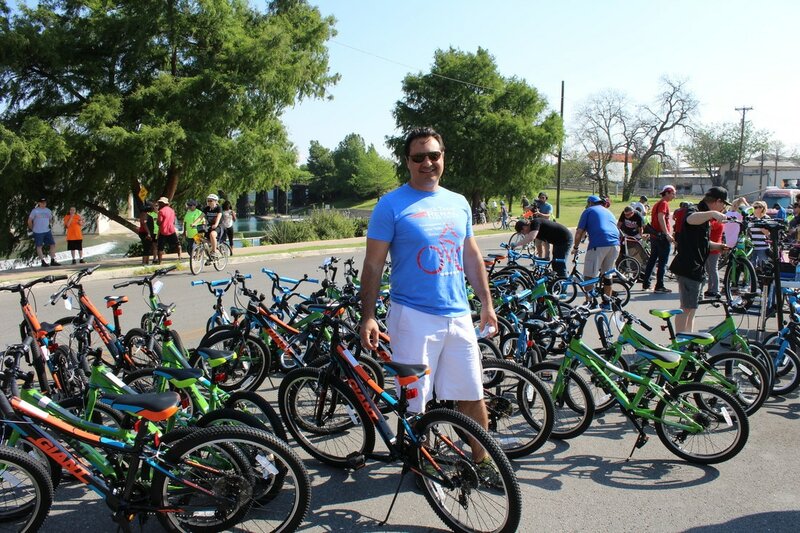 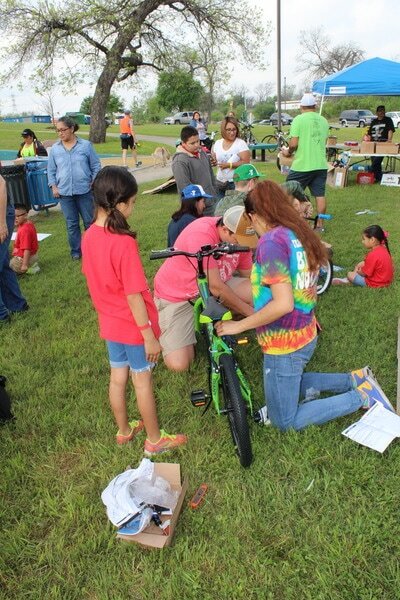 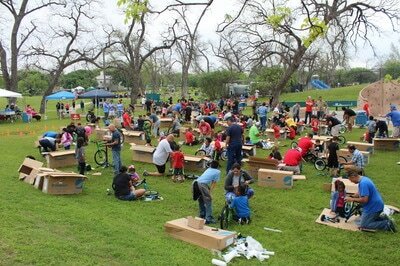 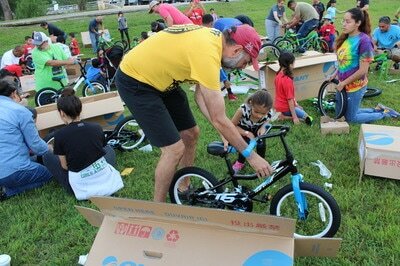 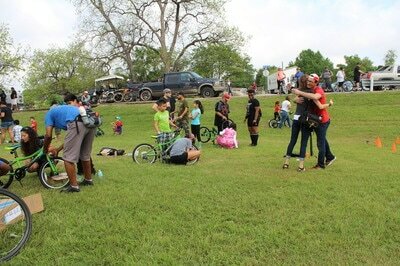 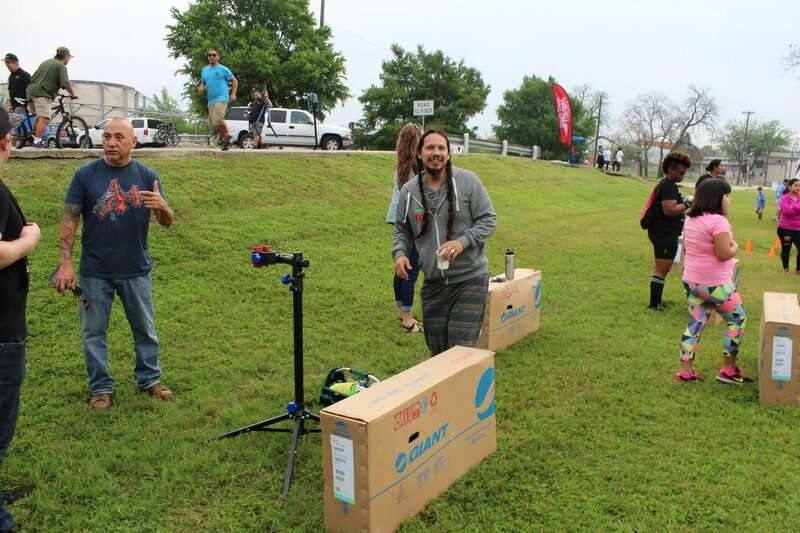 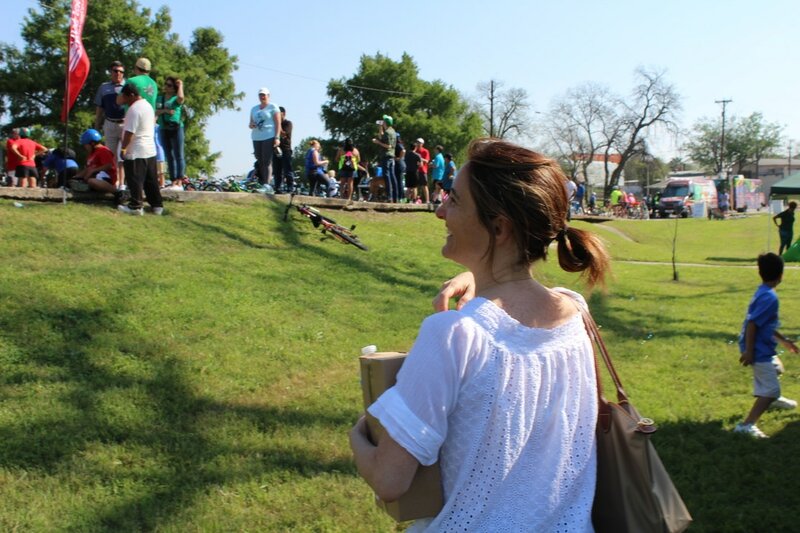 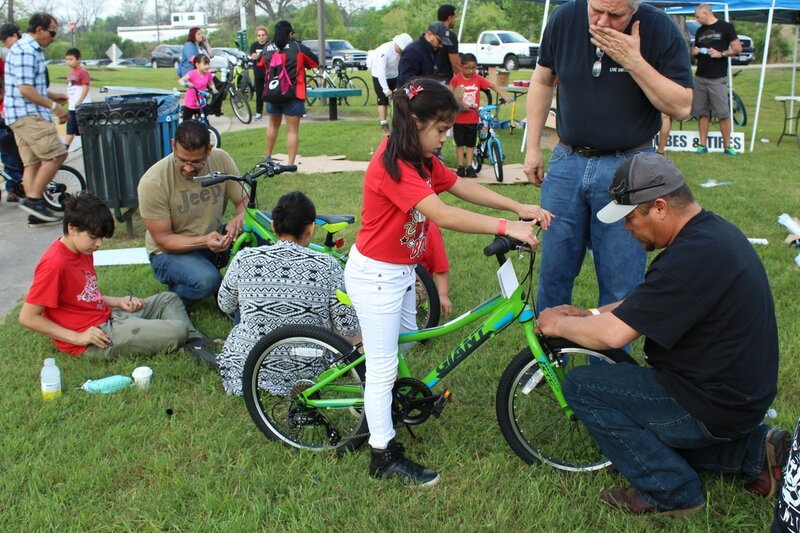 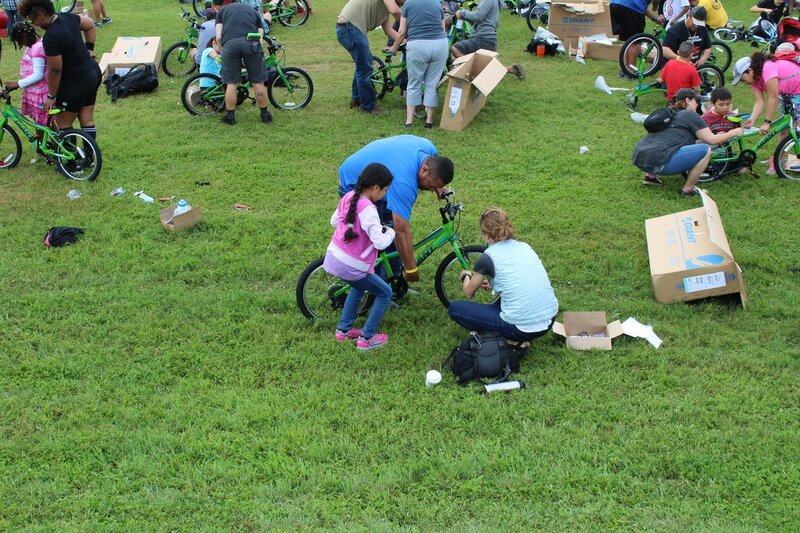 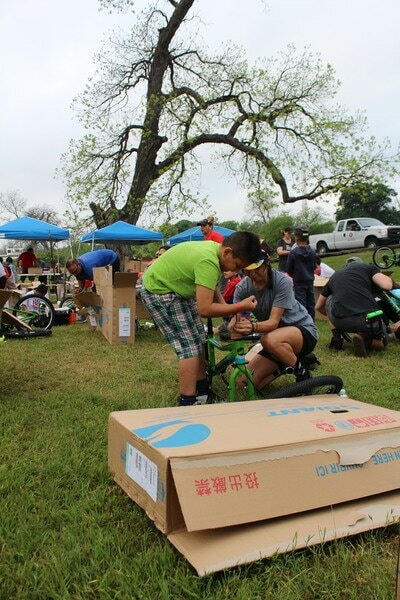 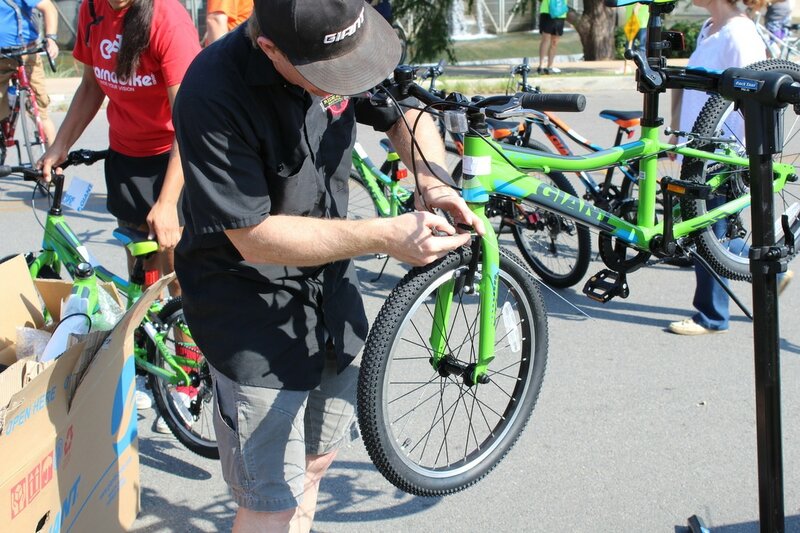 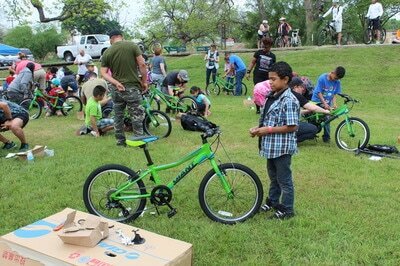 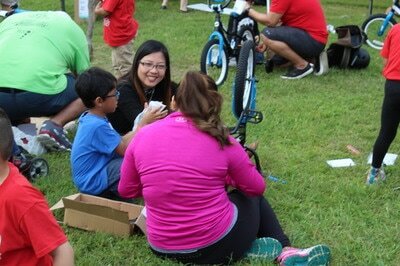 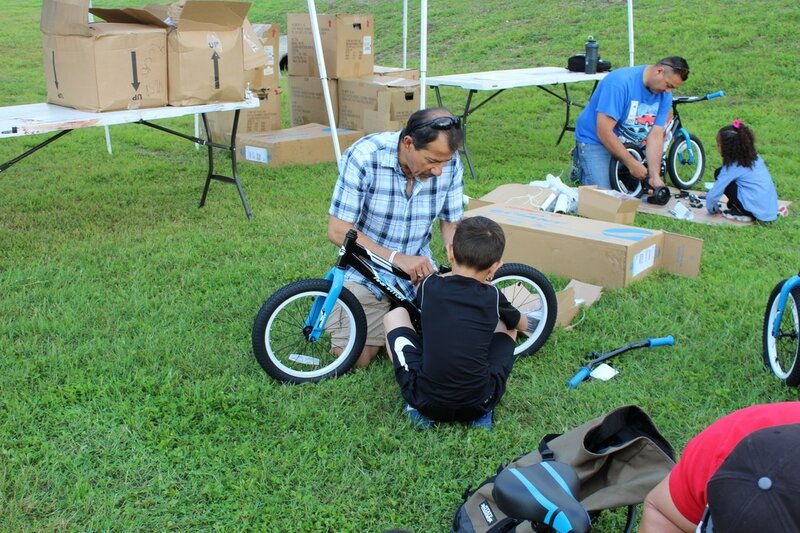 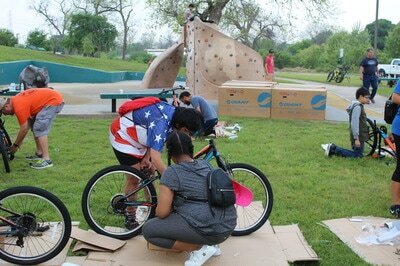 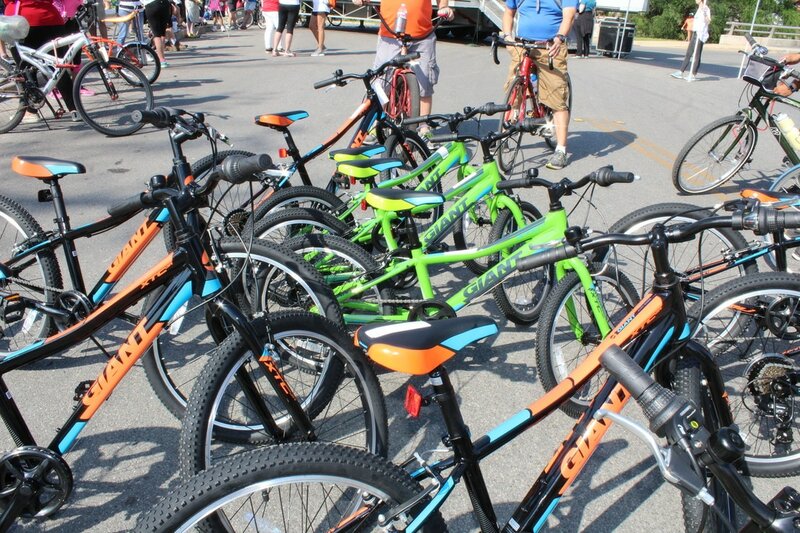 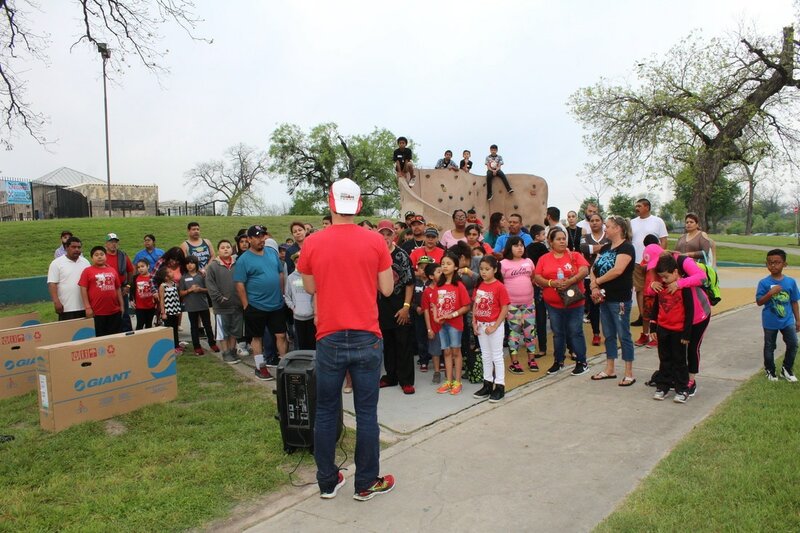 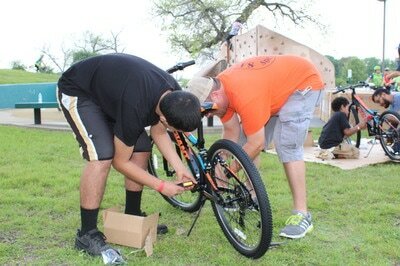 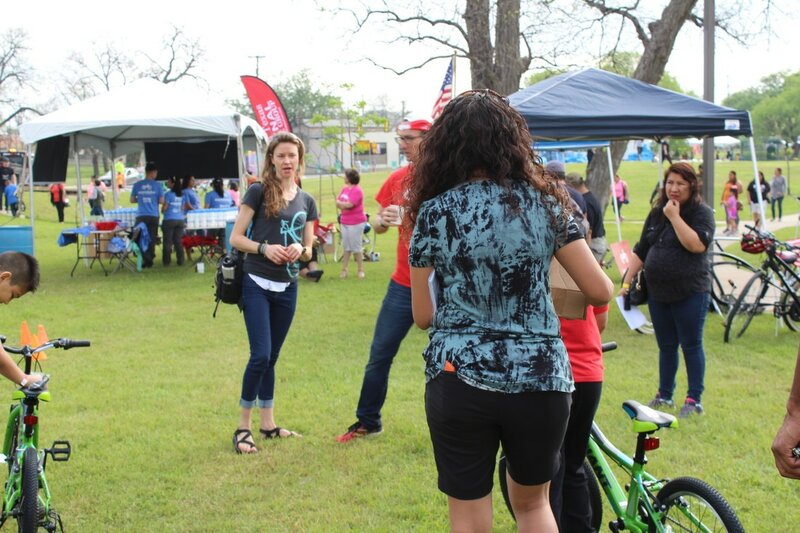 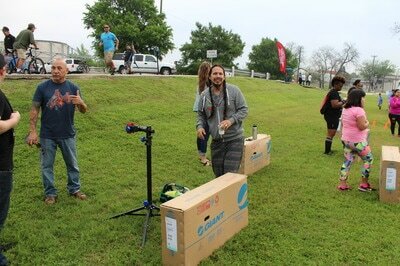 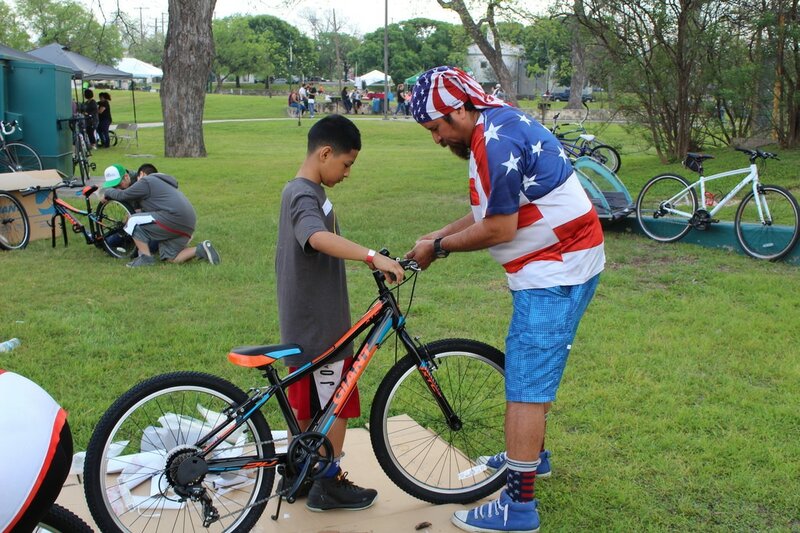 Build A Bike Event: At the event, with the help of volunteers, children assemble their new bike, and participate in a group ride. 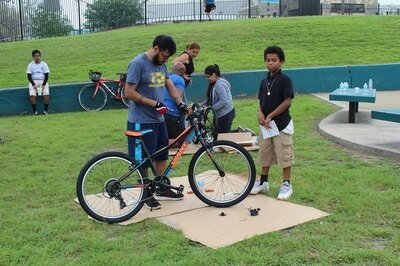 The event acts as a celebration of the students commitment, and dedication, to improving themselves and concludes in a two-hour group ride. 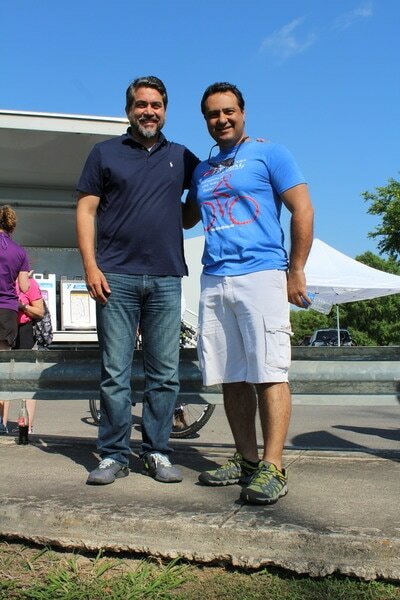 Opportunities to connect parents to cycling will also be at the event. Post EAB @ School: After the program Earn-A-Bike follows up with the school officials and ensures that the kids are riding their bicycles and that the parents continue supporting their activities. 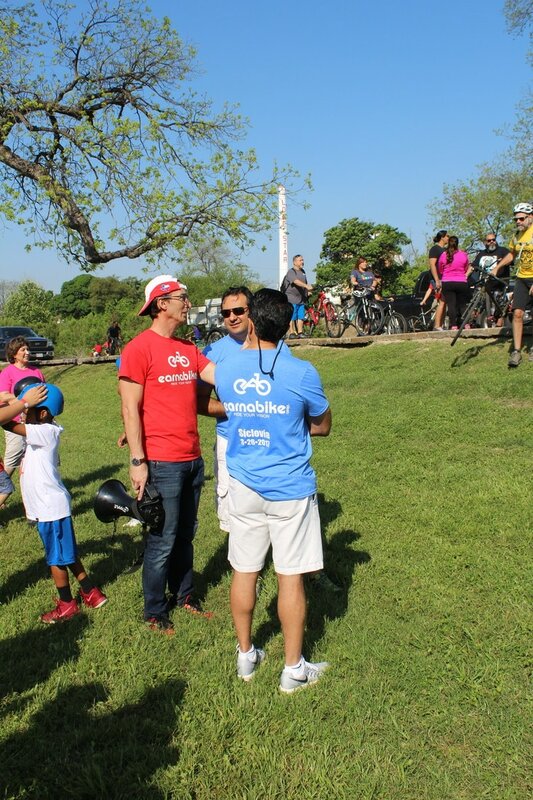 At the end of the program EAB will release a study measuring impact with the help of its partners. 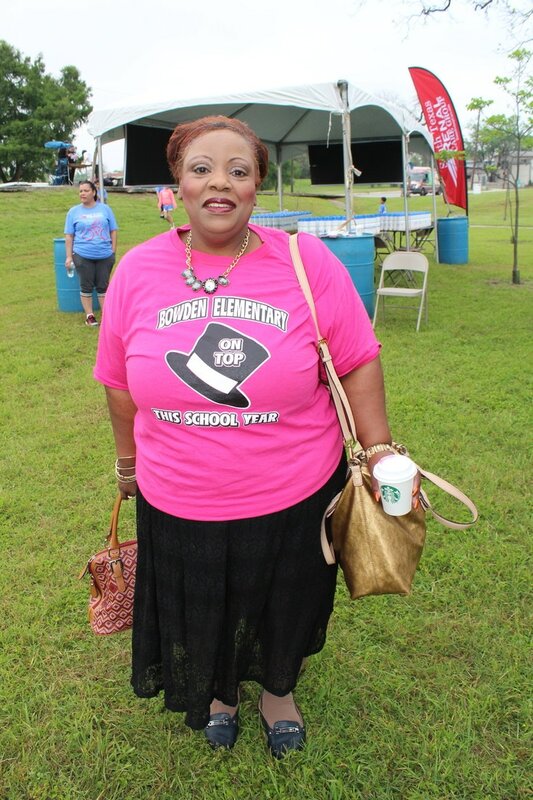 Schools are selected based on need and commitment shown by the school administration. 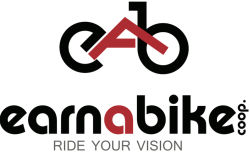 And availability of funding partners. School administrators submit an application which is then reviewed by the board. 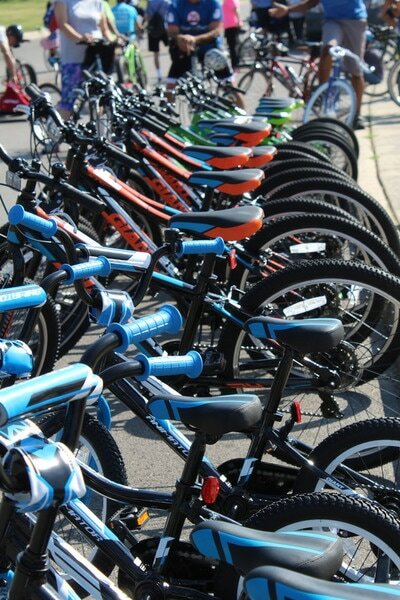 The cost per school varies on the reach of the program. 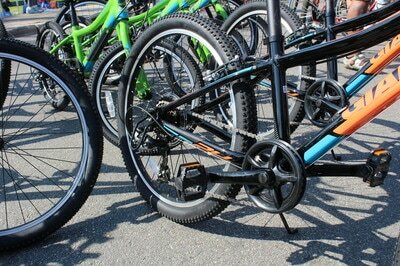 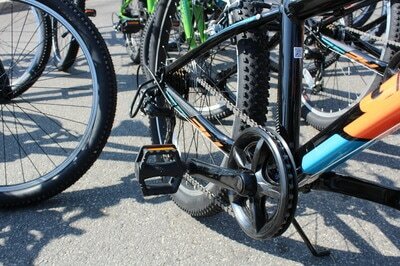 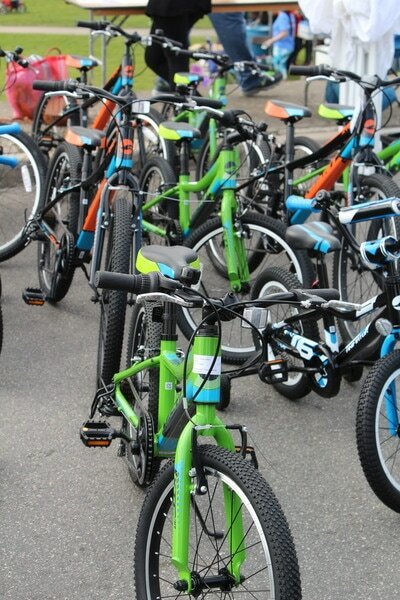 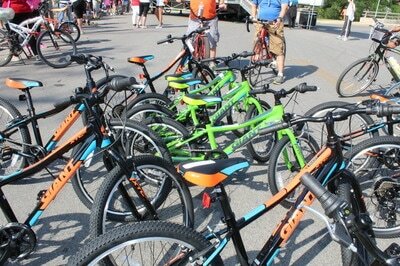 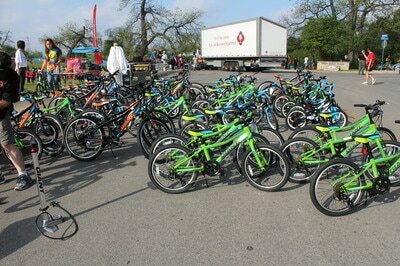 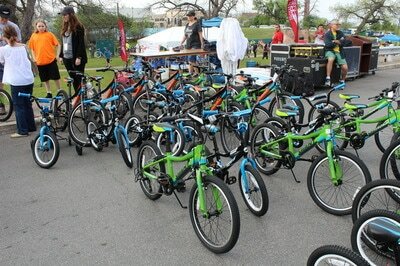 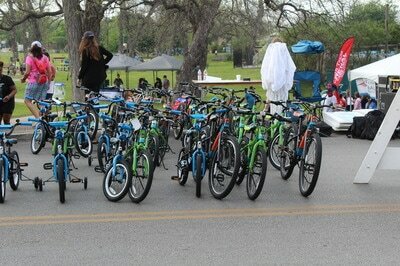 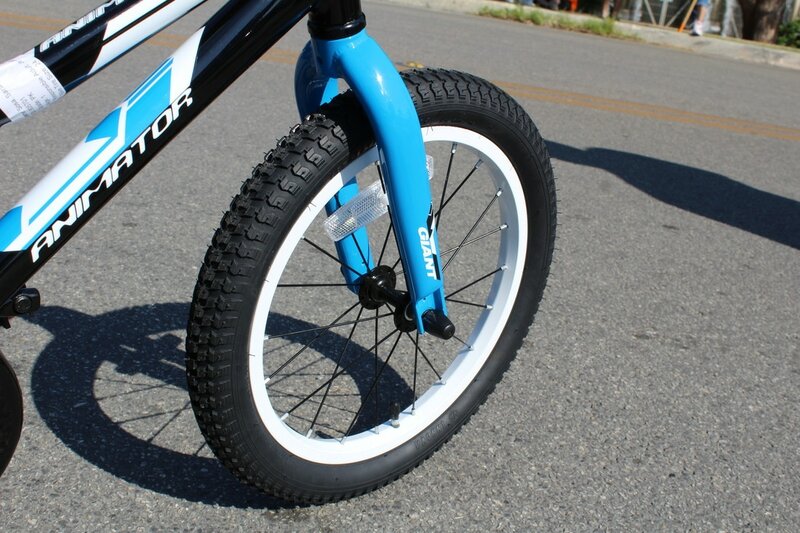 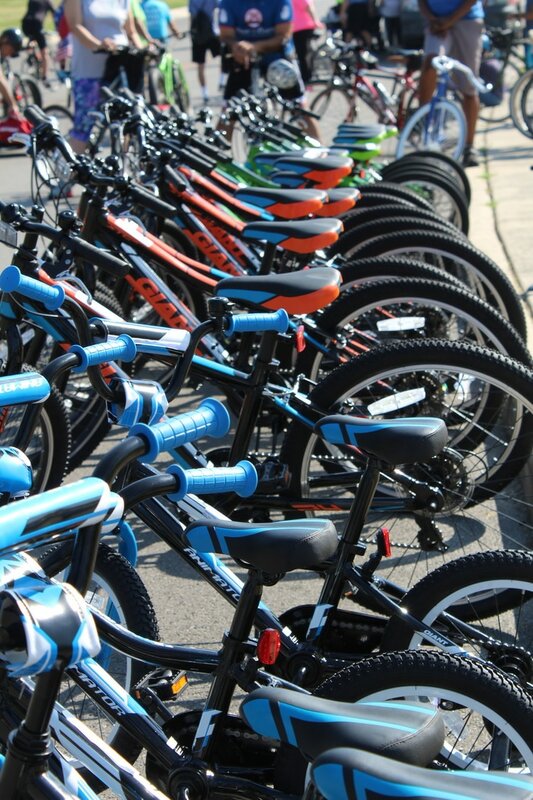 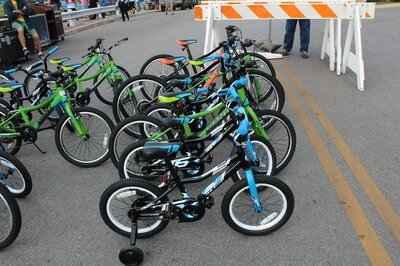 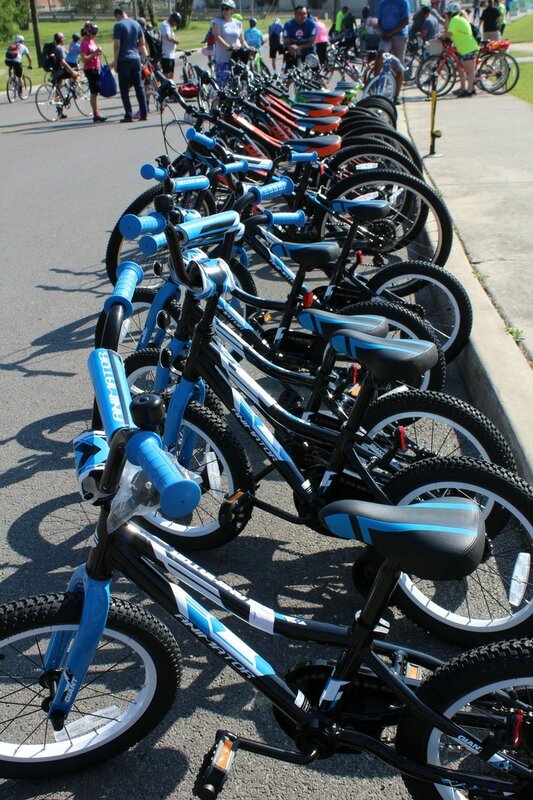 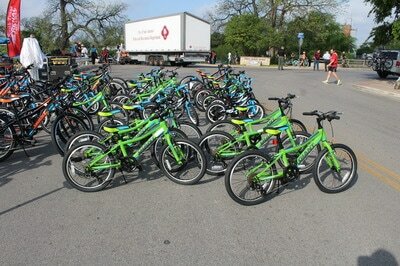 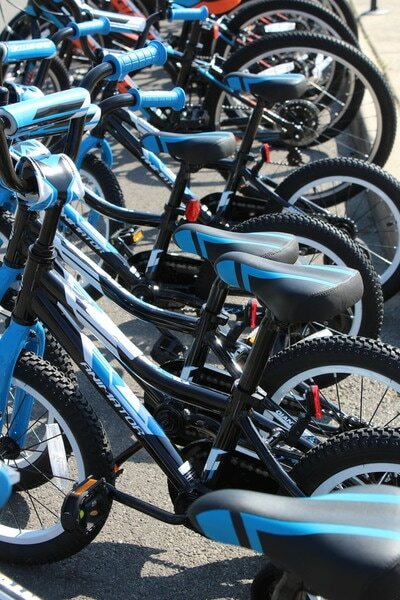 We can offer 100 students bikes for $25,000. 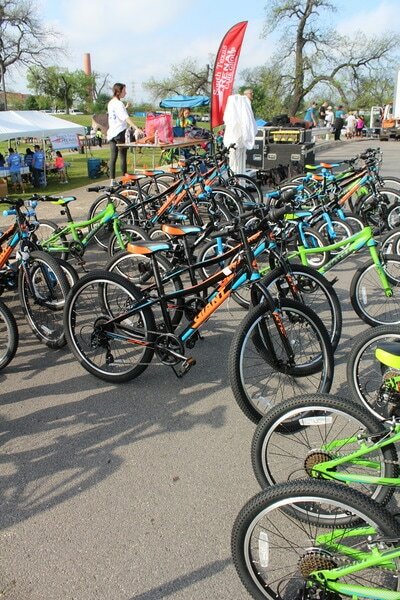 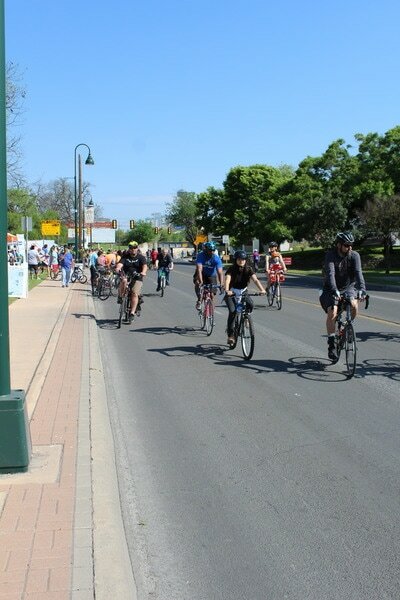 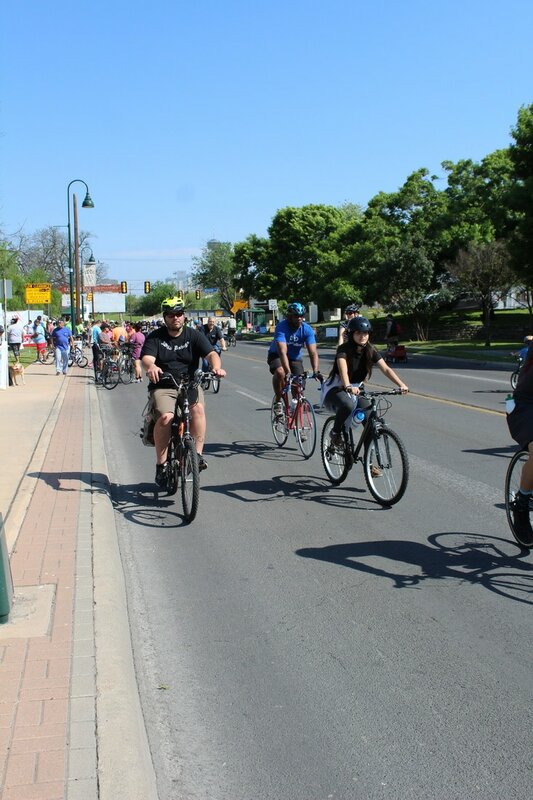 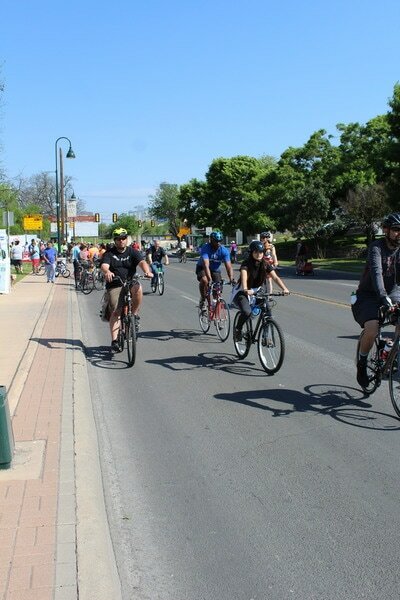 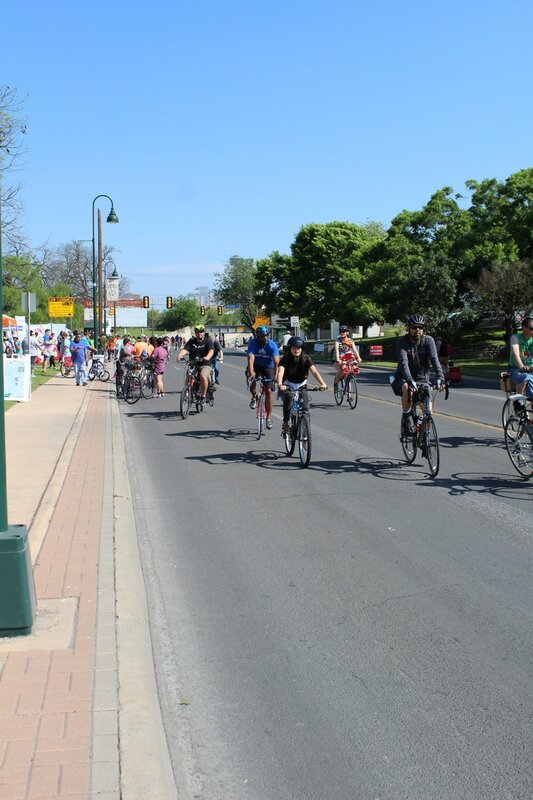 This covers the expenses to purchase the bicycles, program materials, event coordination, execution and administrative follow up. Help us create opportunities for these kids. 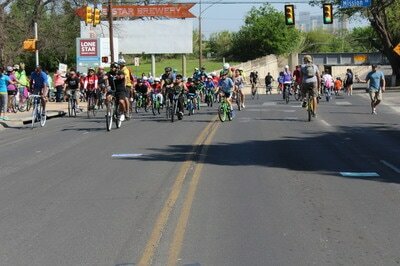 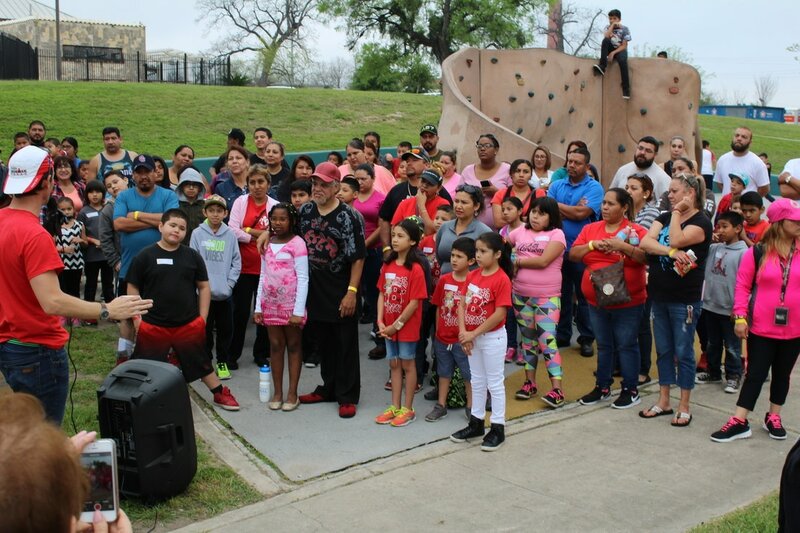 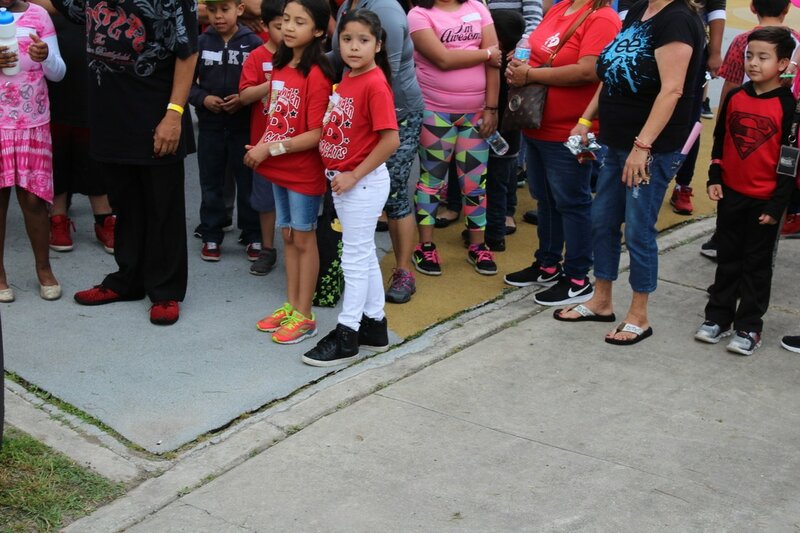 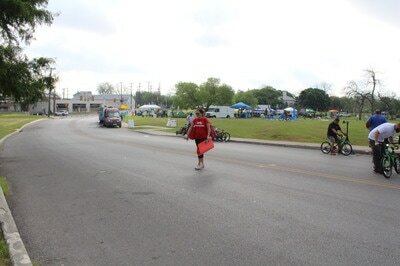 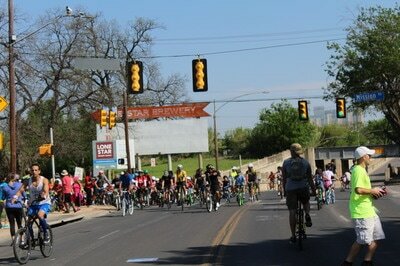 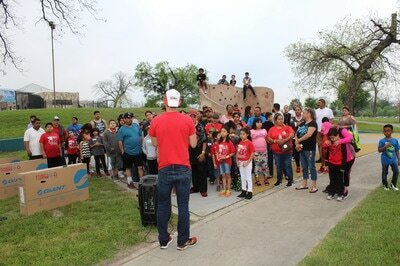 San Antonio kids are our kids. 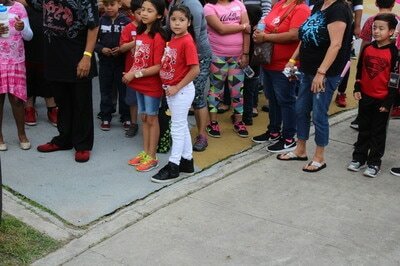 We decide the future we want them to have. 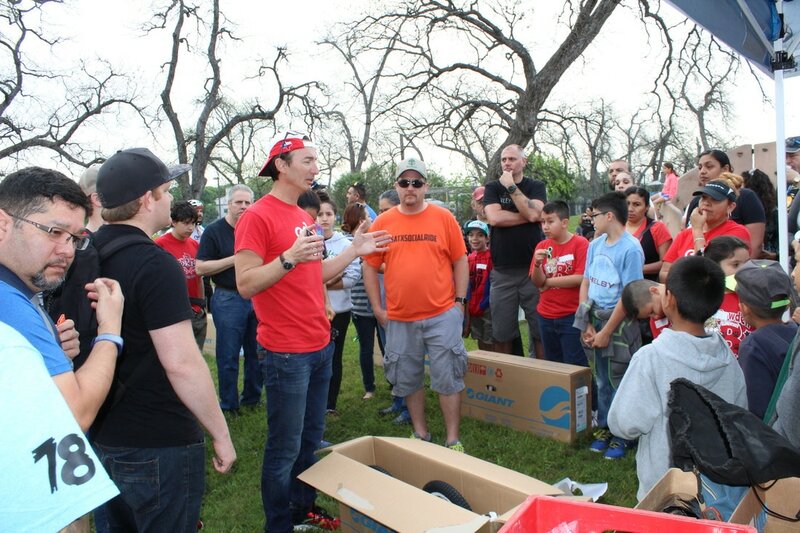 We can make a difference. 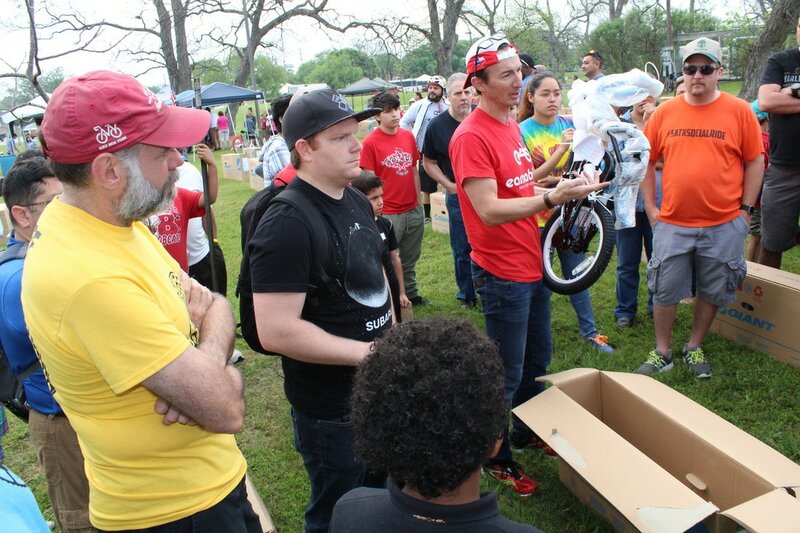 Help us break the cycle by donating, sponsoring or volunteering. 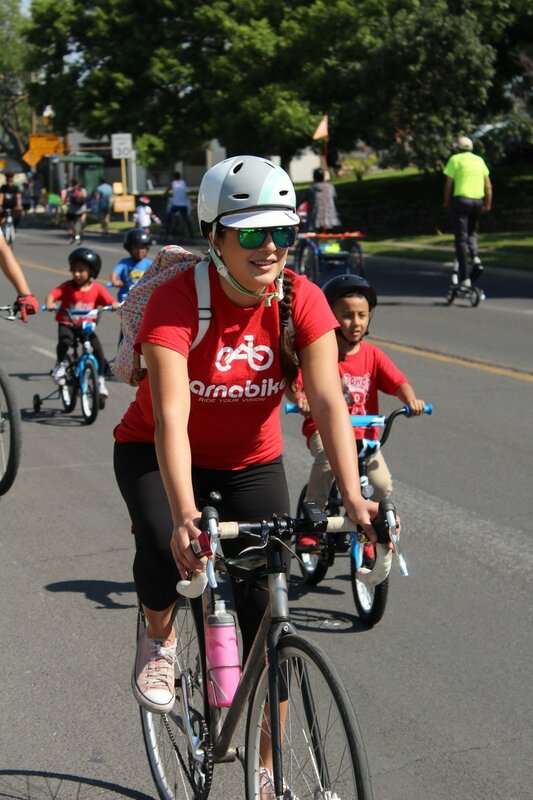 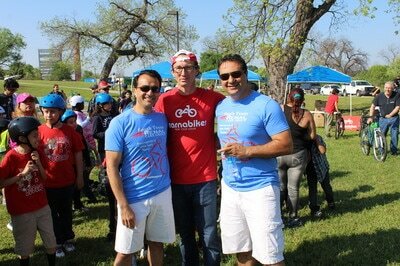 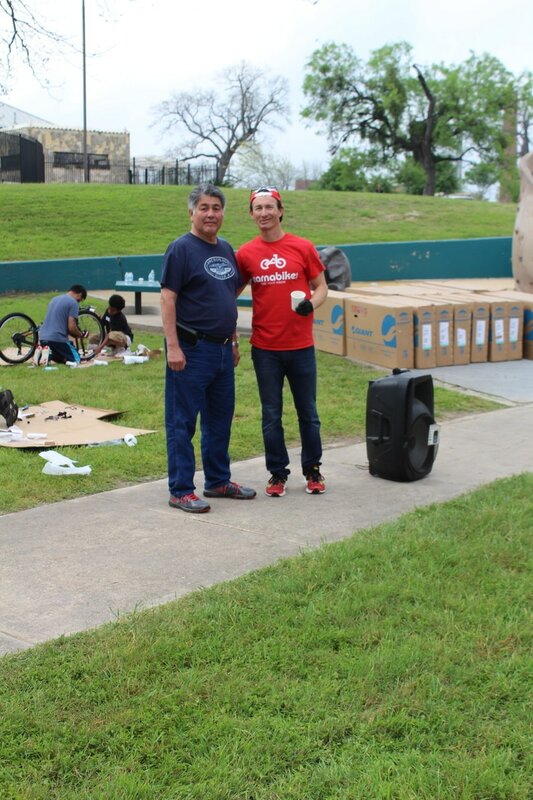 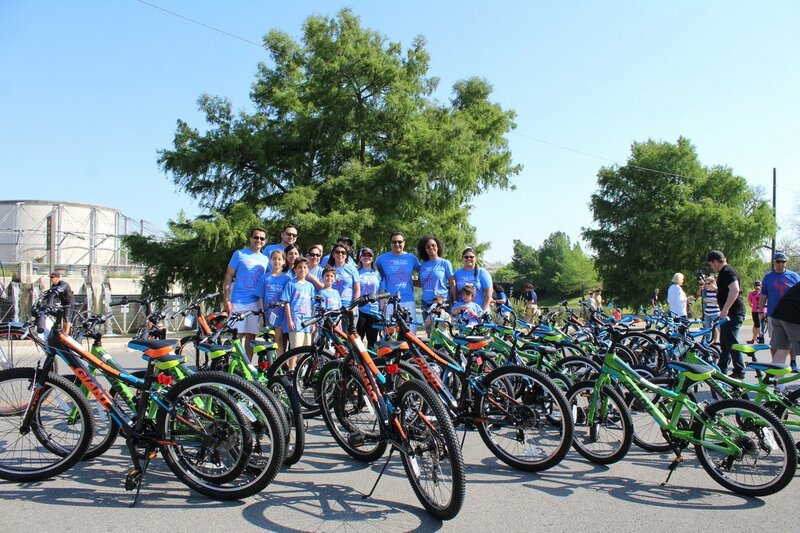 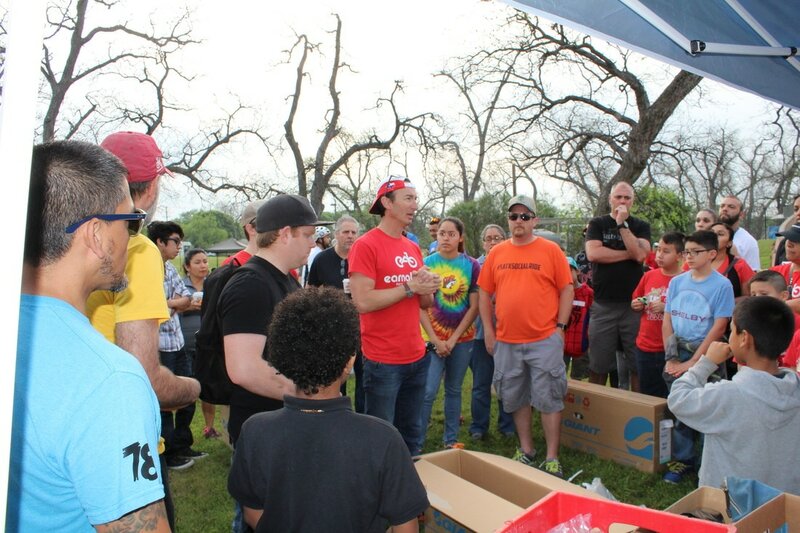 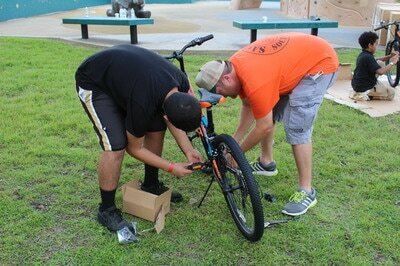 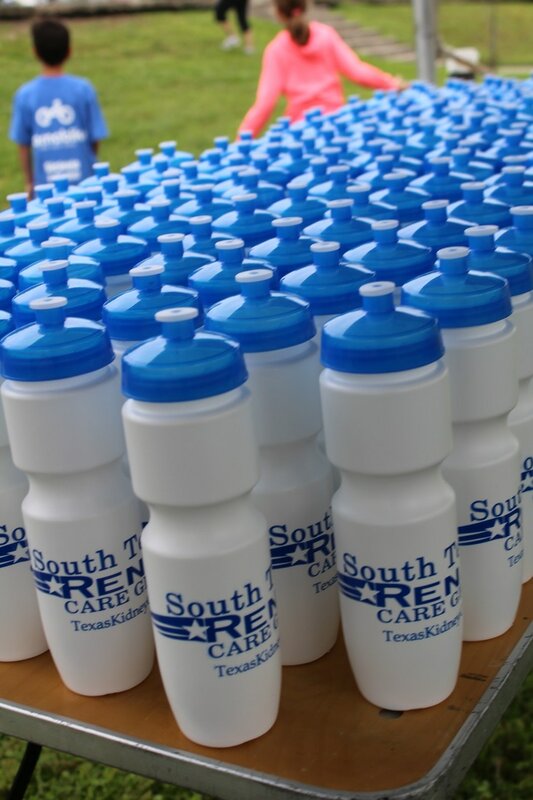 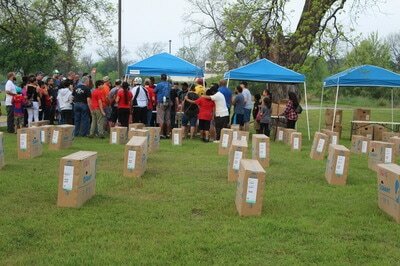 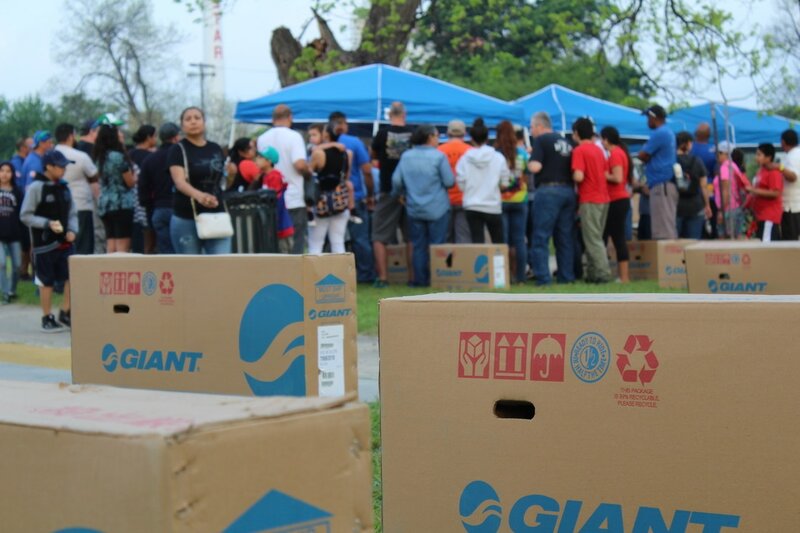 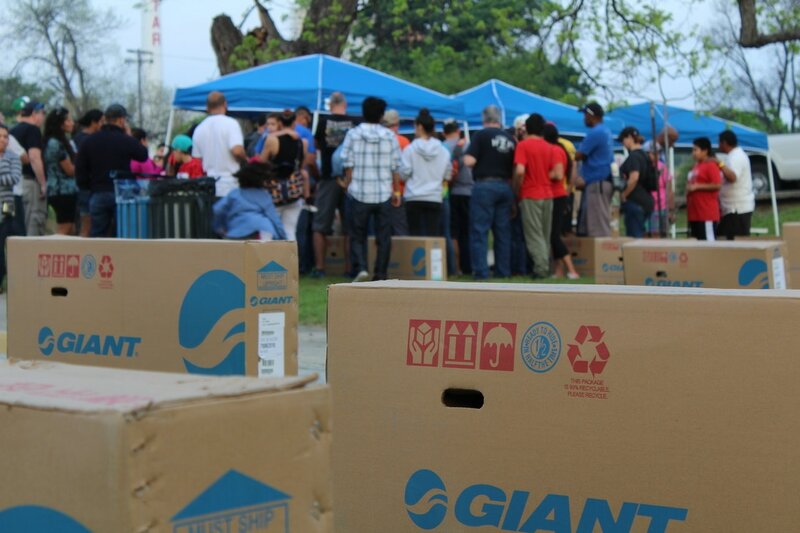 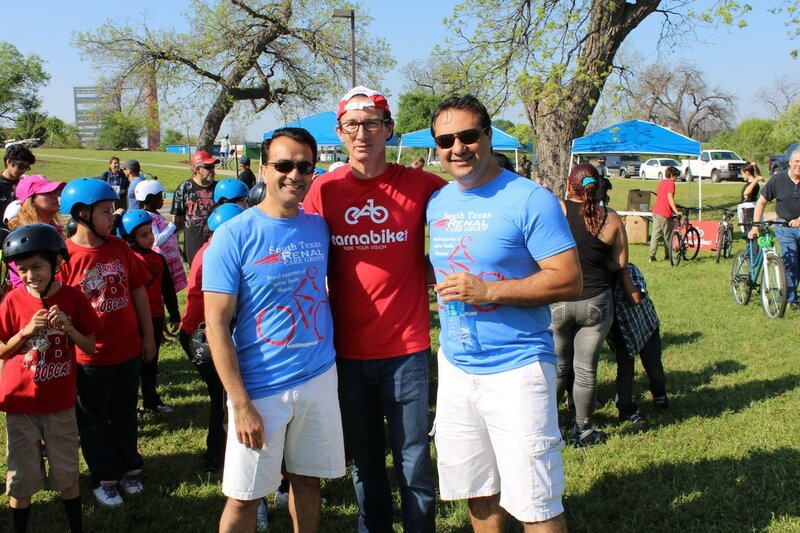 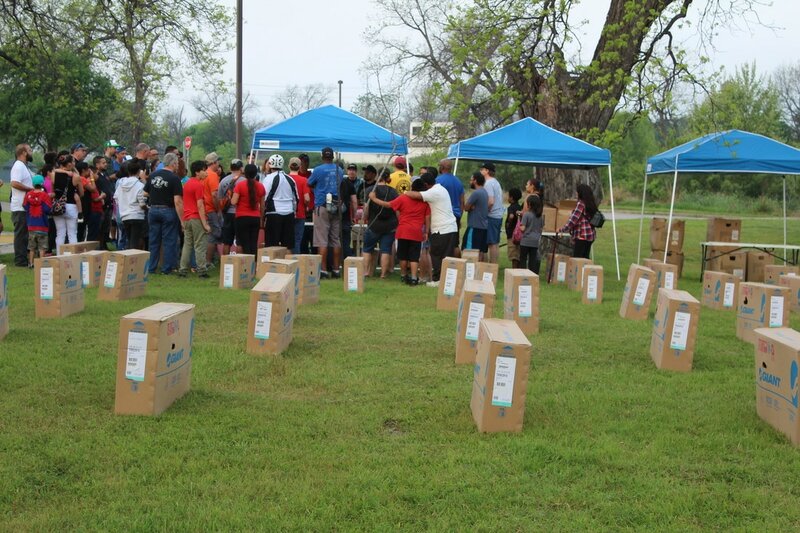 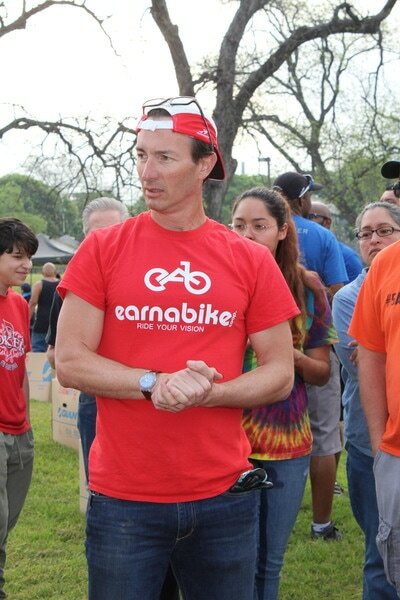 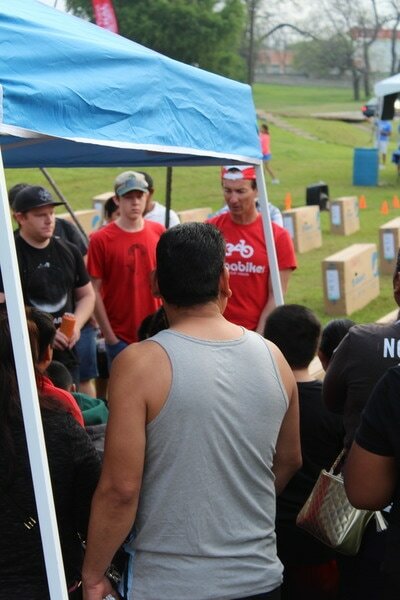 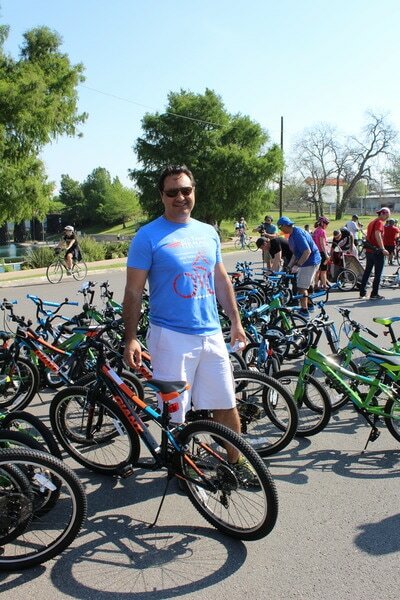 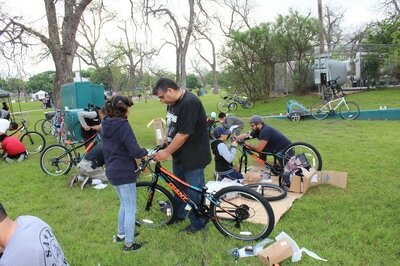 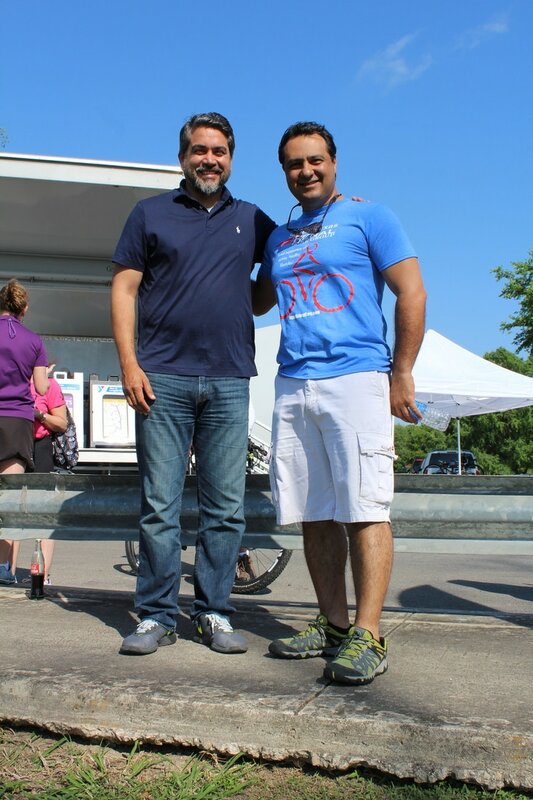 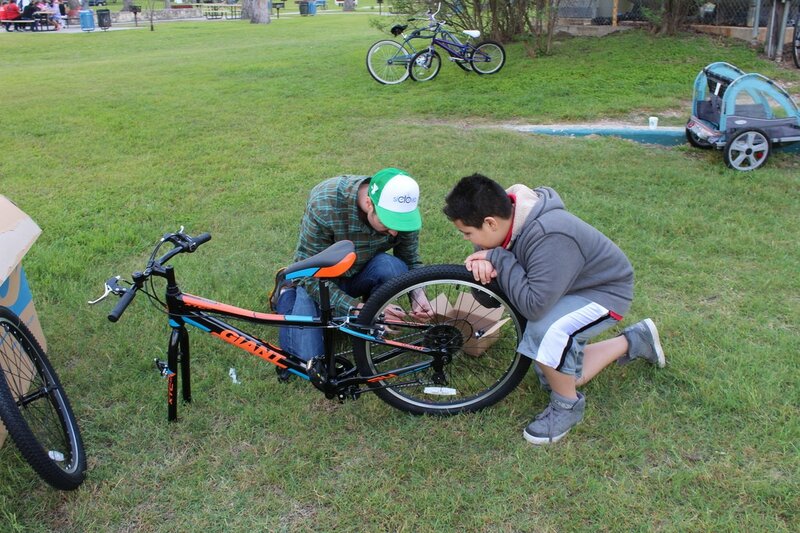 ​​Earn A Bike is one of the most rewarding volunteer experiences you will have this year. 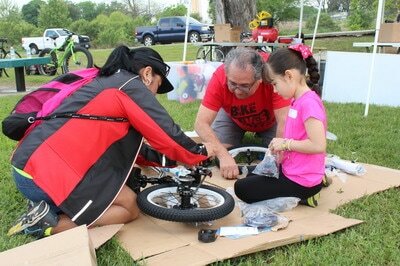 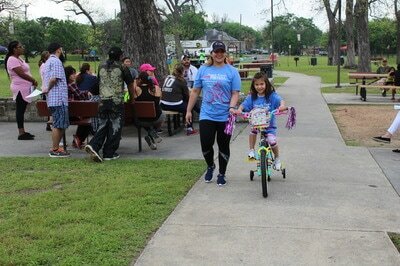 The opportunity to work side by side with a child and help her/him Earn A Bike. 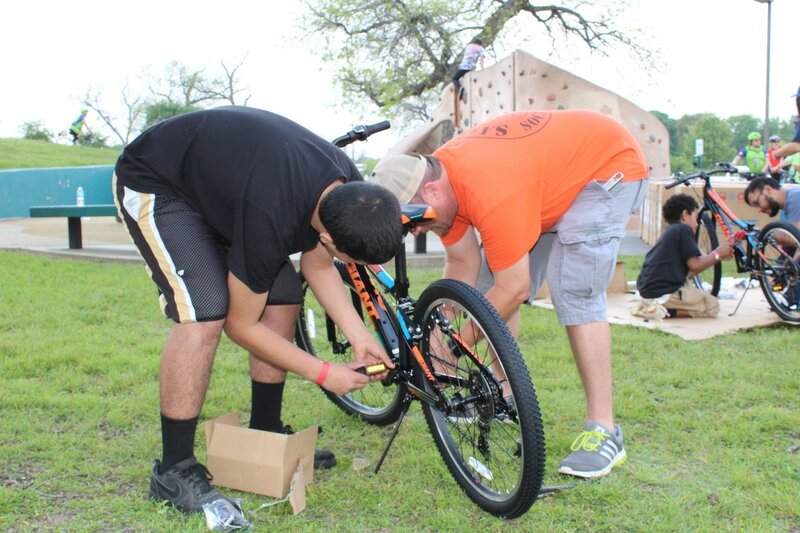 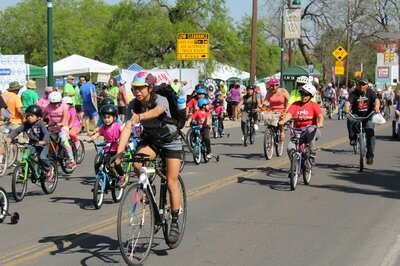 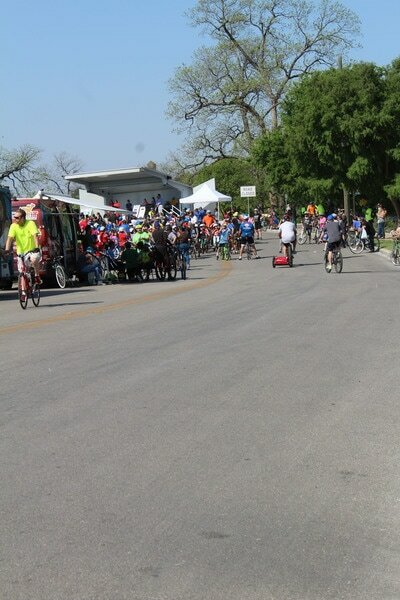 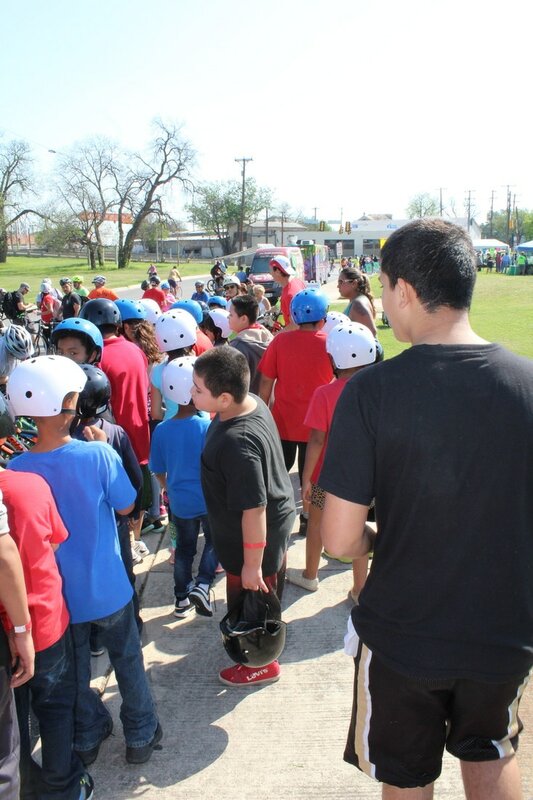 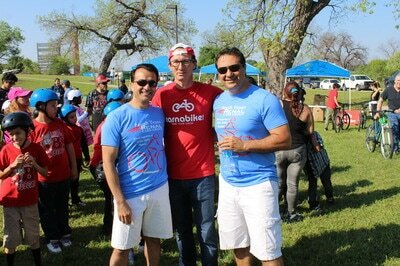 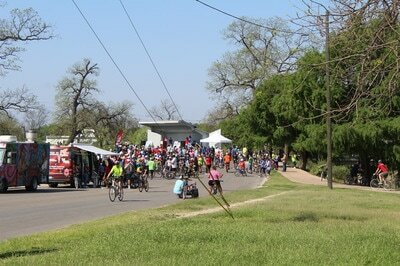 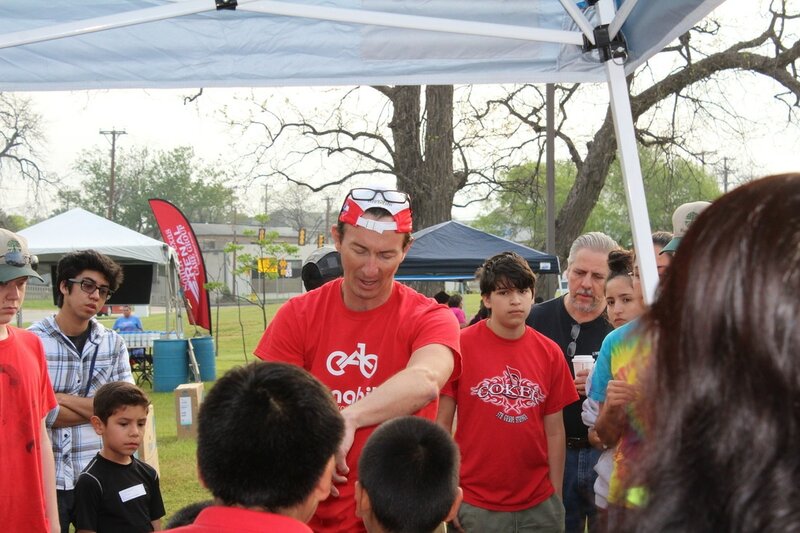 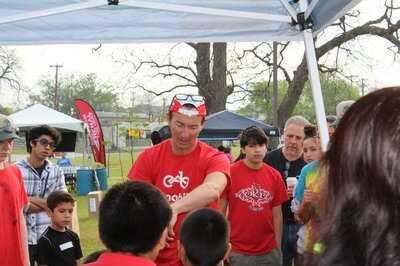 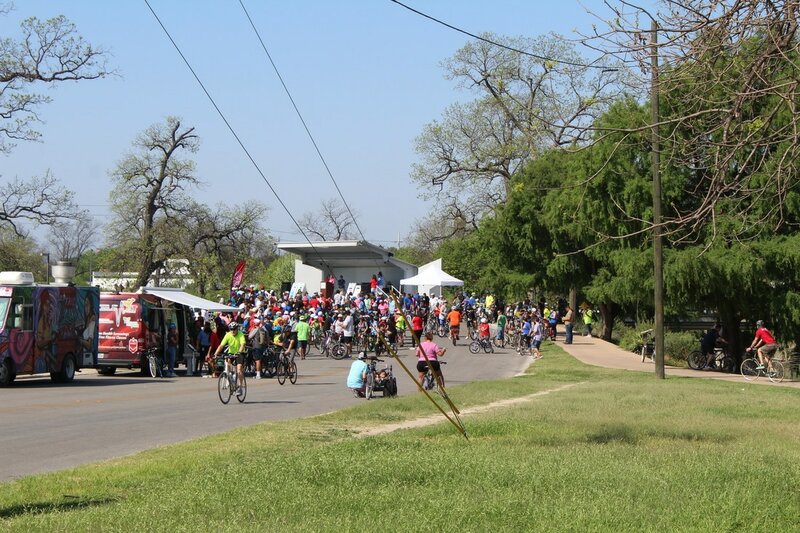 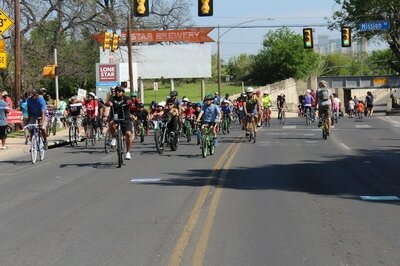 Share your passion for cycling and health, while empowering youth to achieve their goals. He took it like a man.